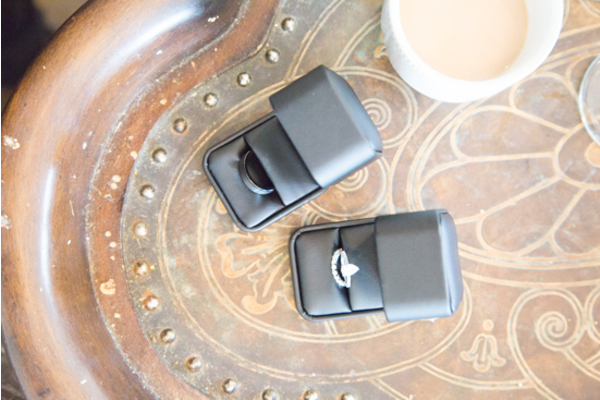 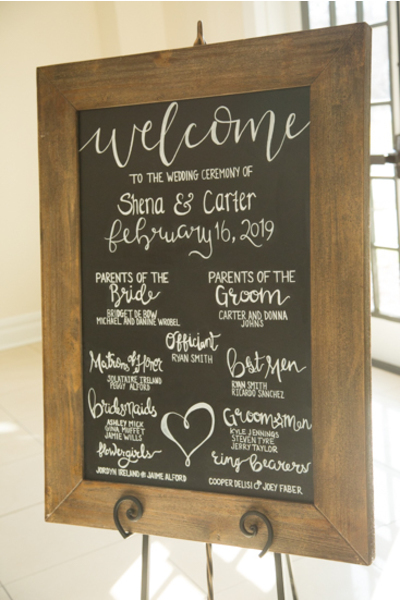 Congratulations to Shena and Carter! 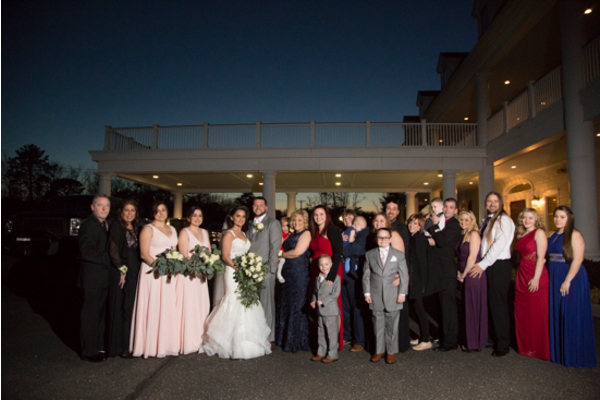 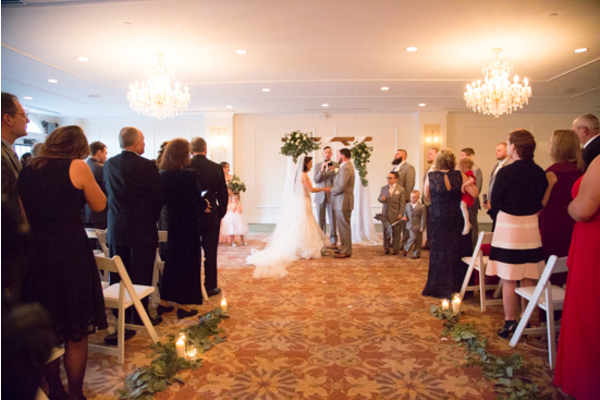 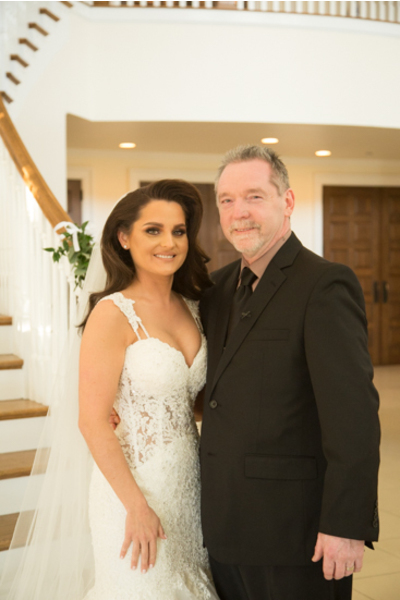 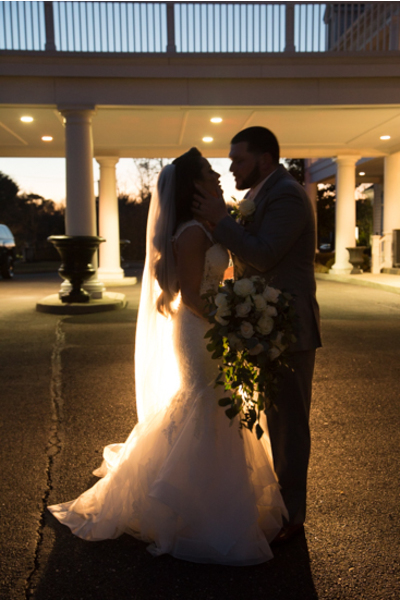 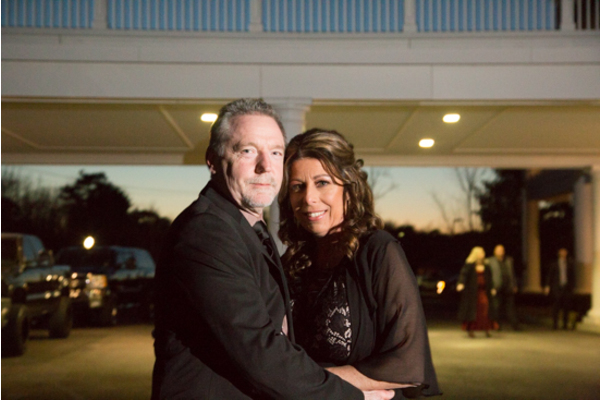 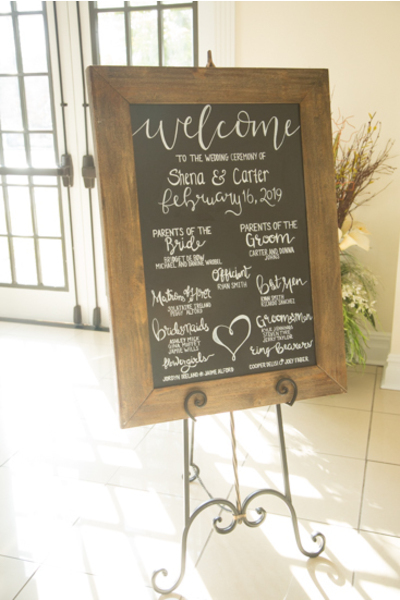 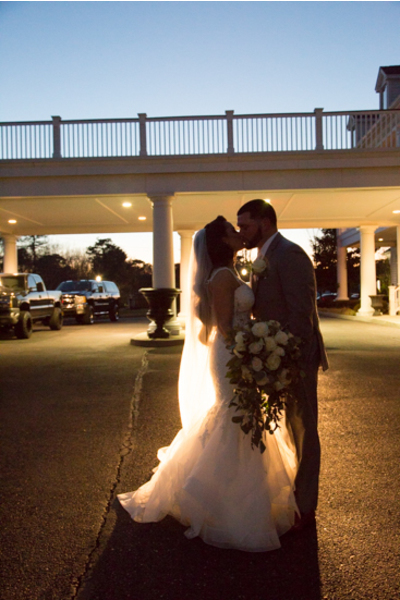 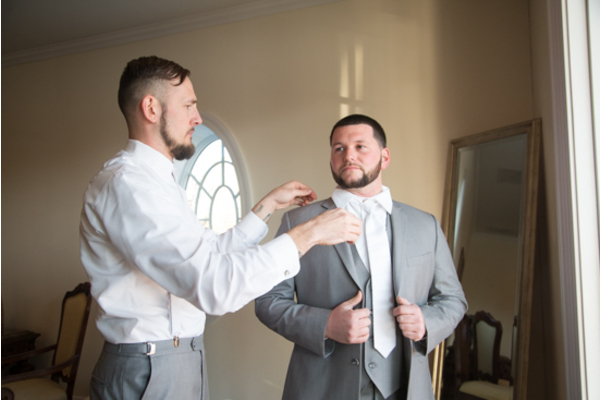 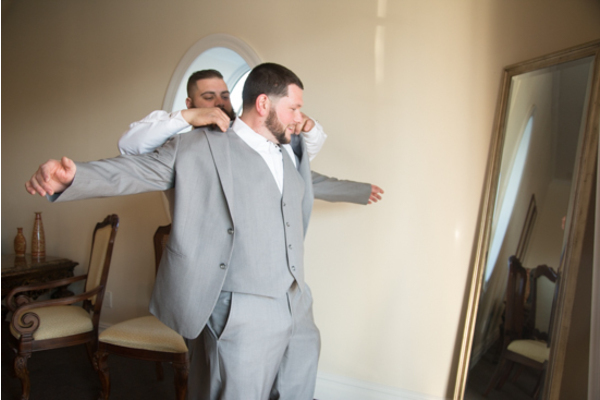 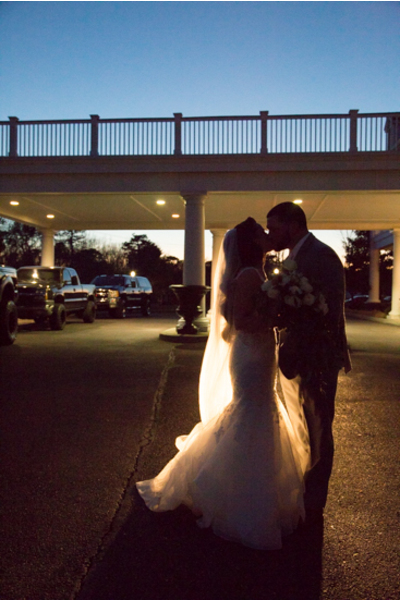 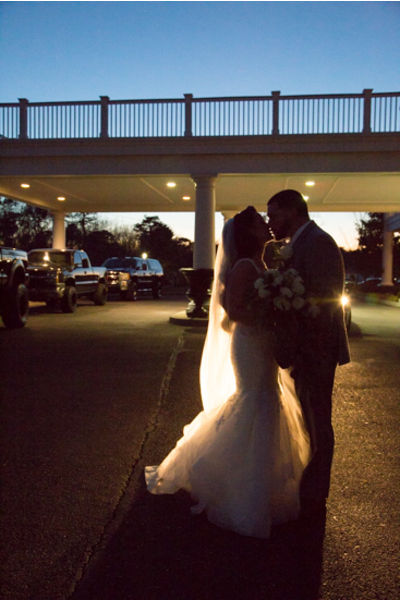 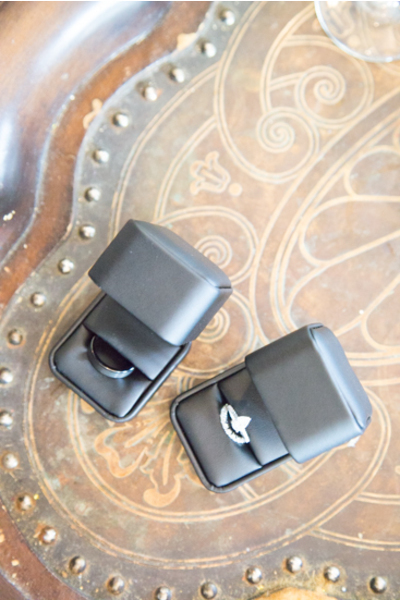 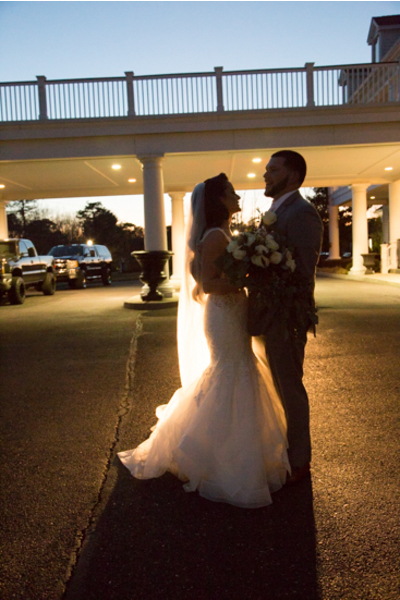 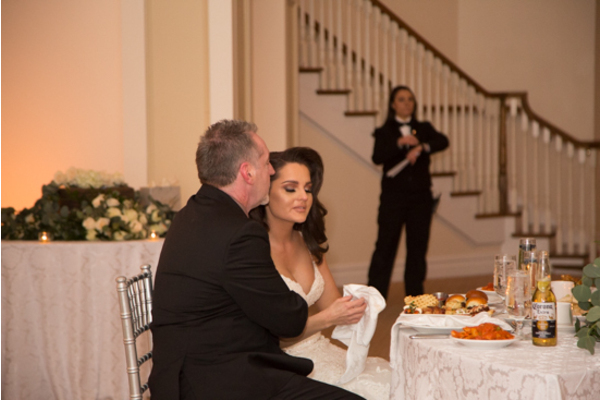 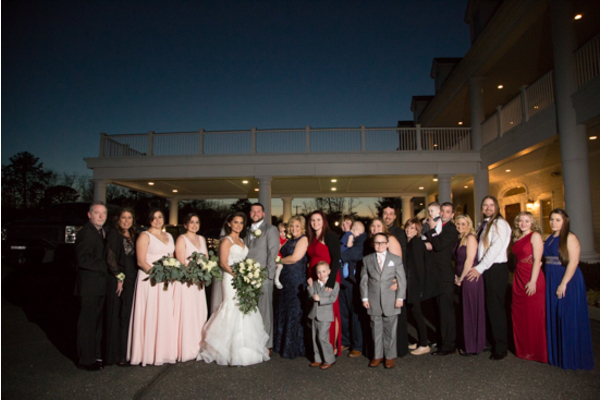 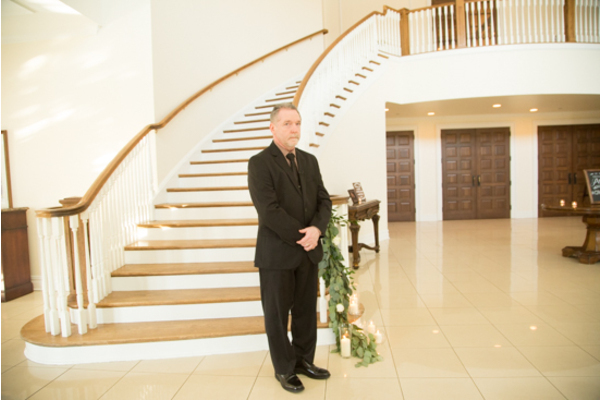 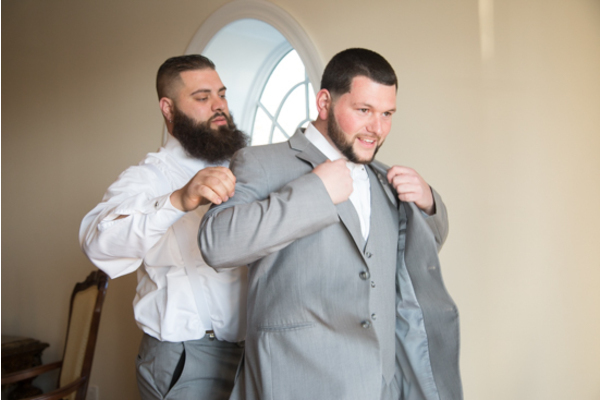 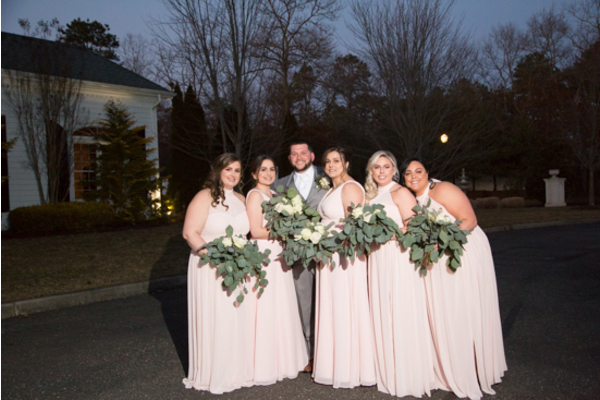 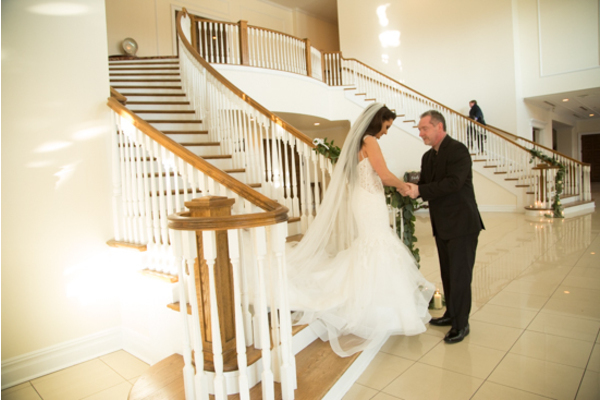 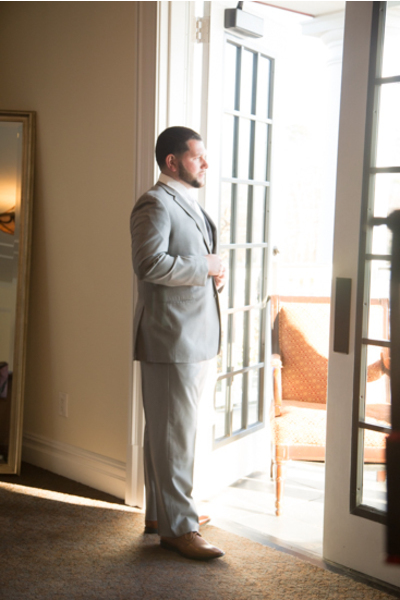 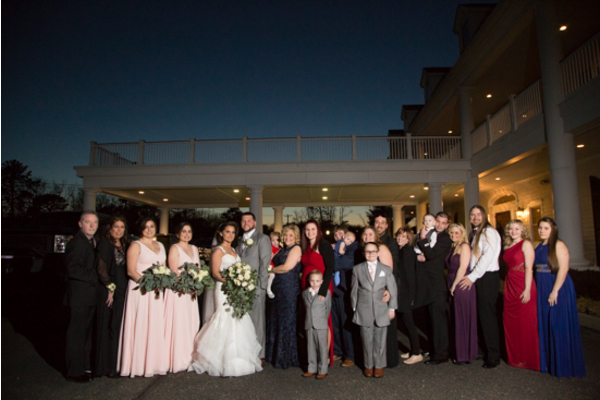 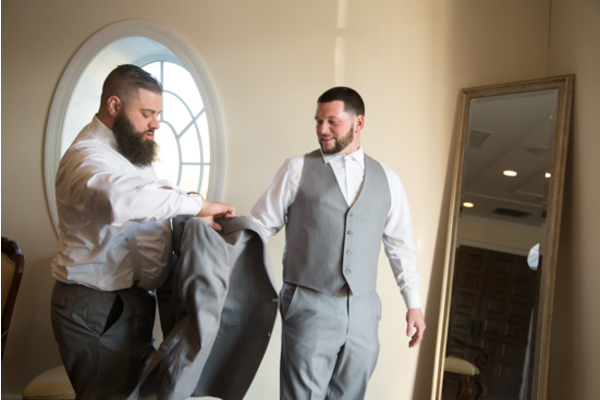 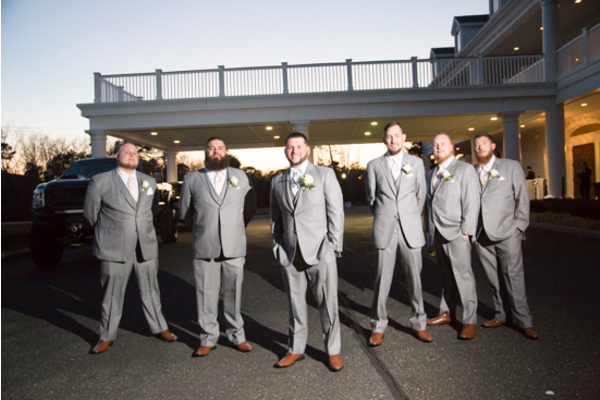 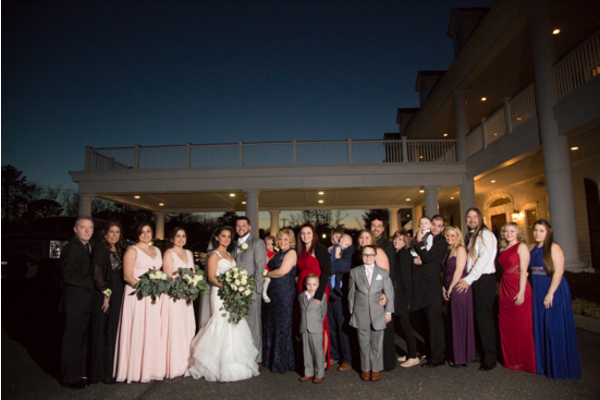 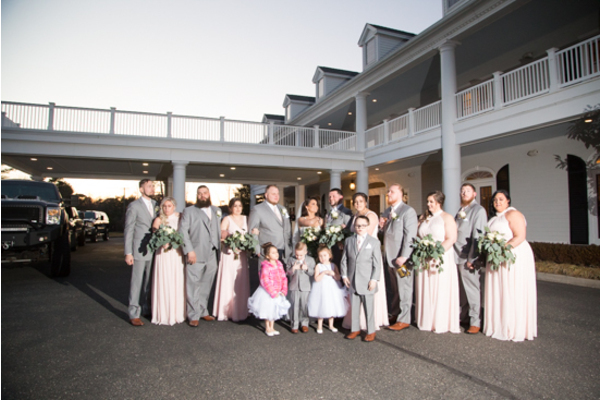 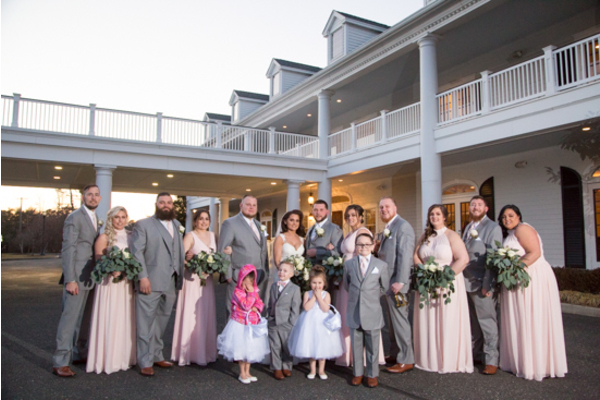 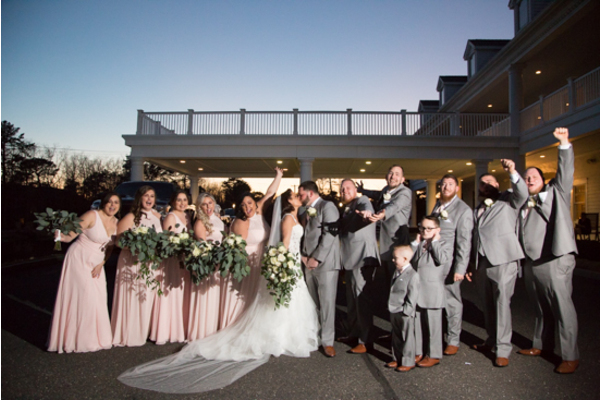 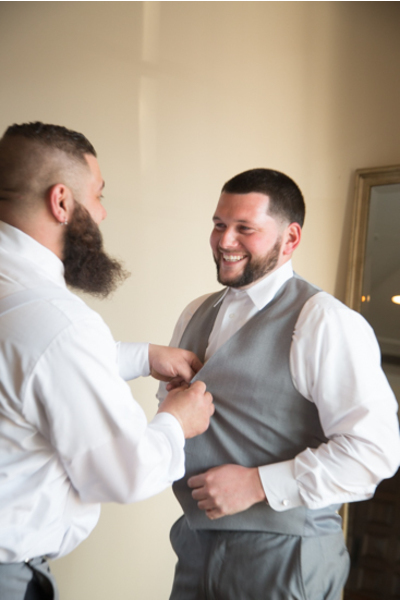 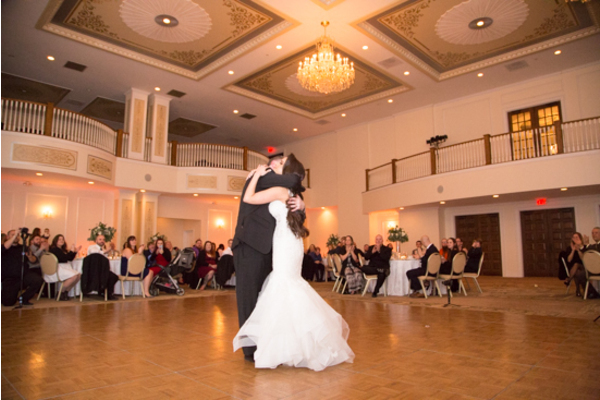 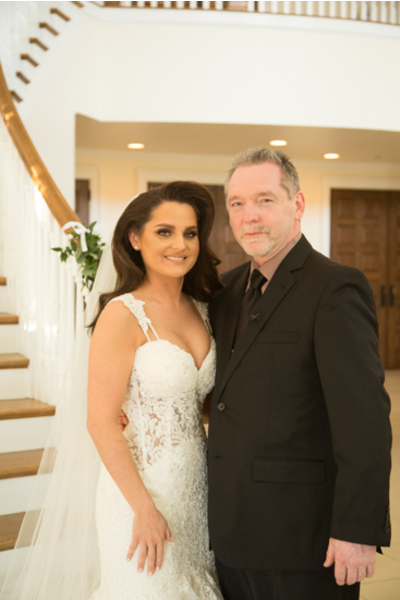 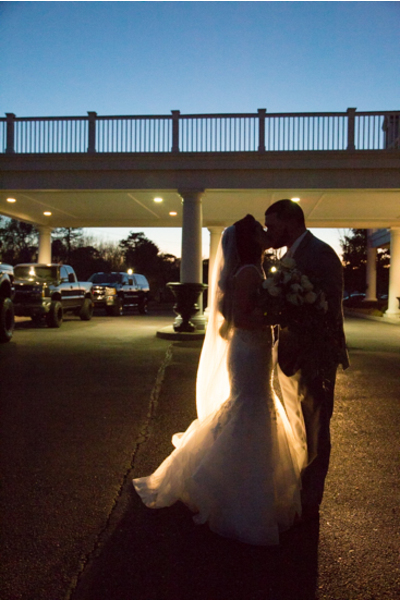 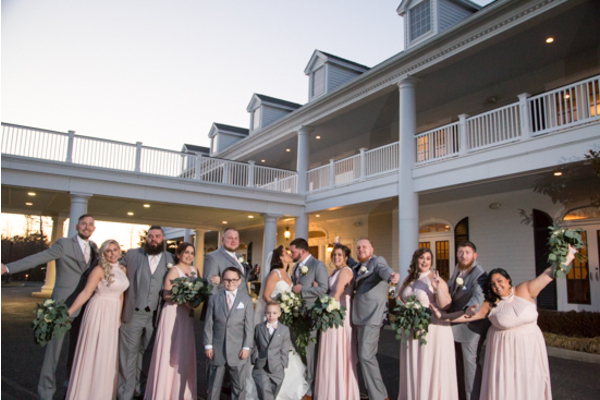 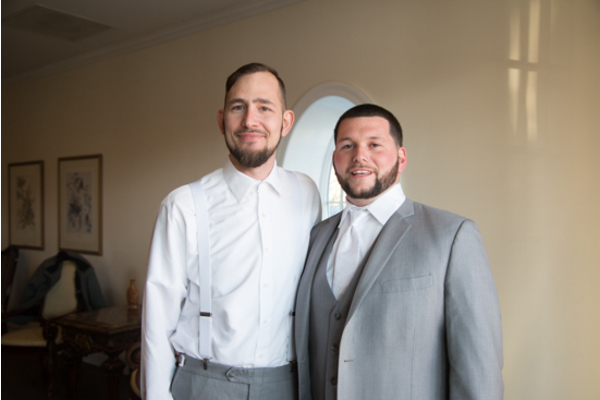 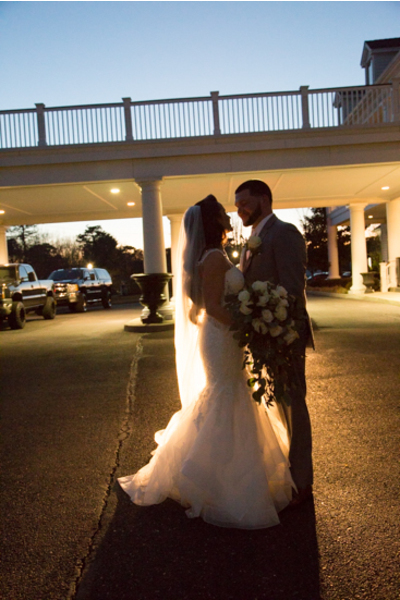 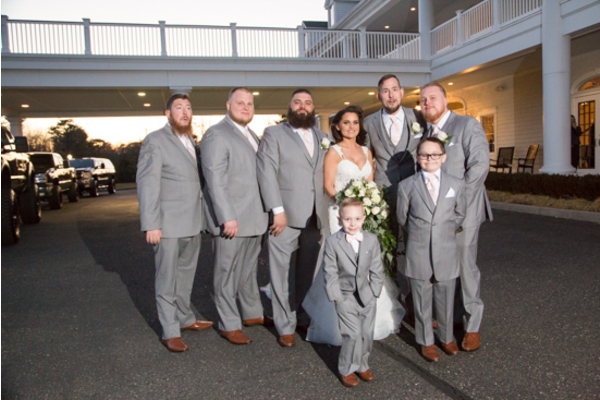 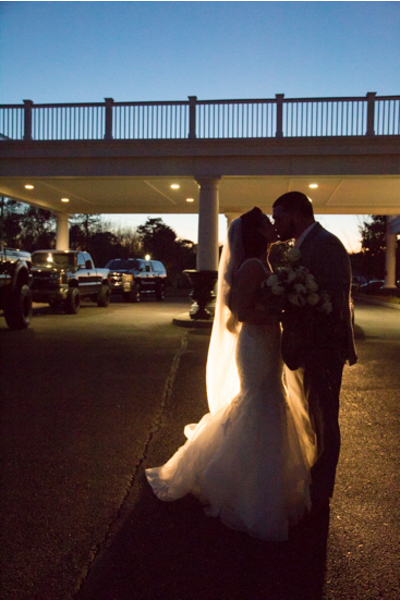 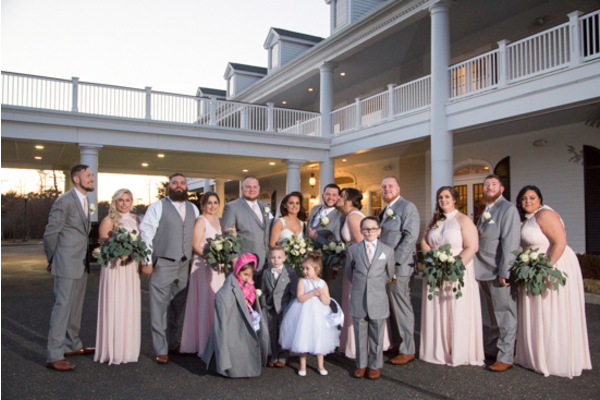 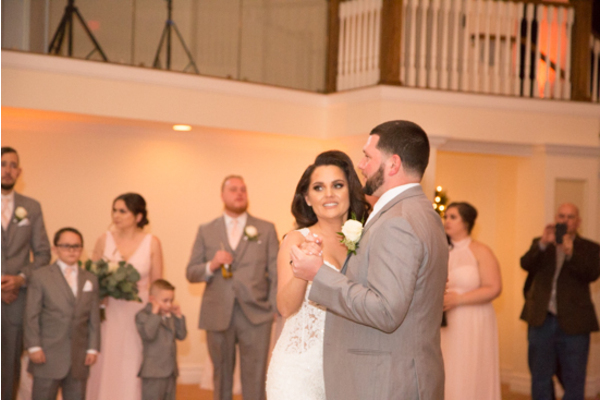 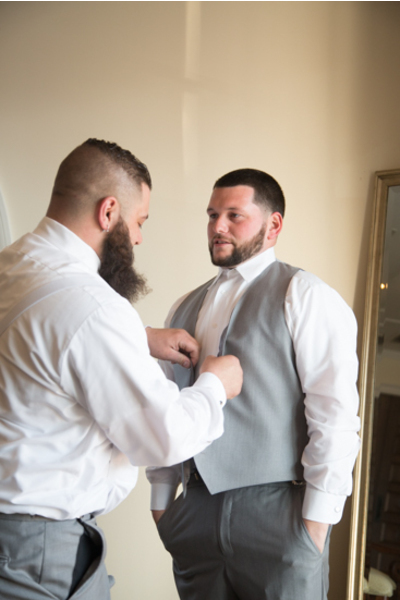 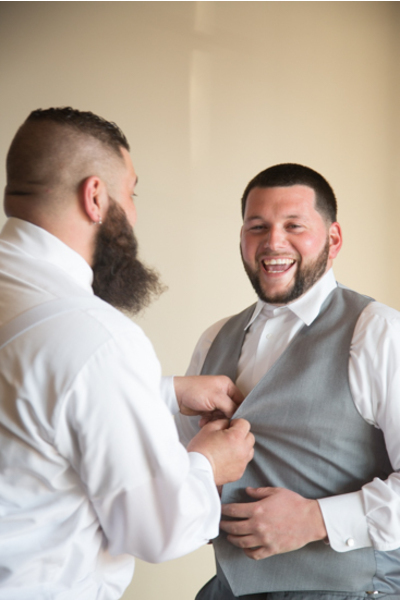 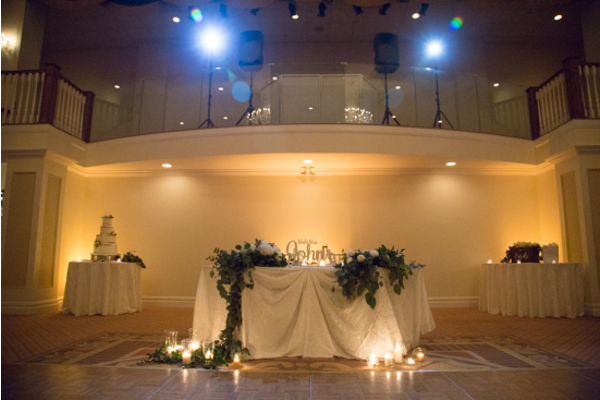 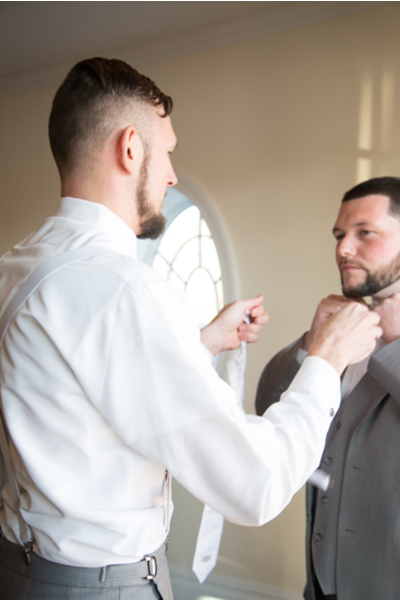 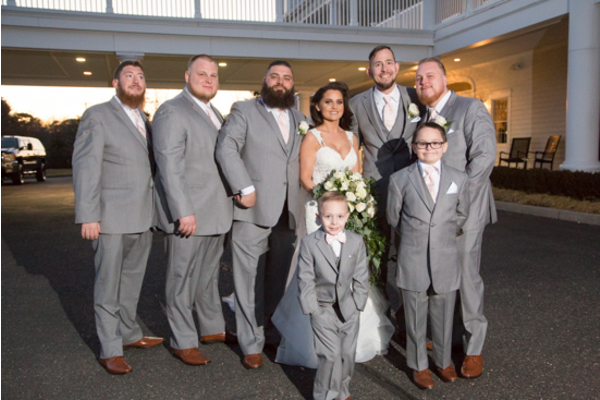 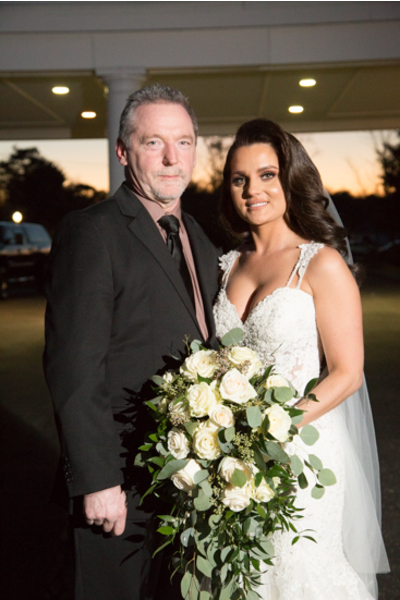 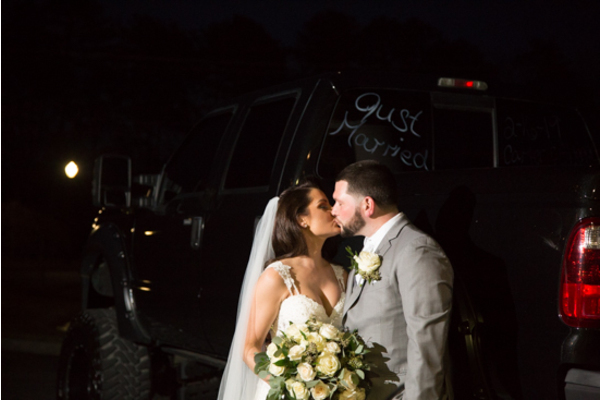 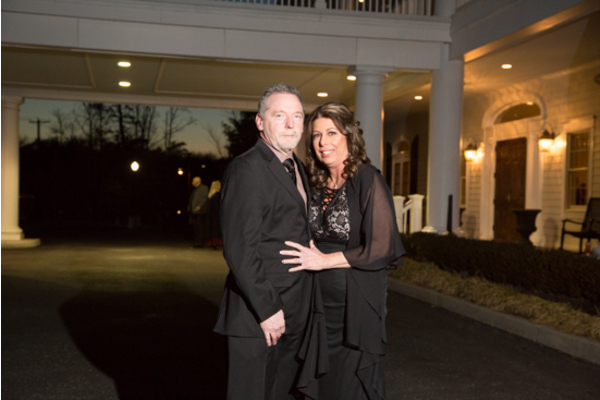 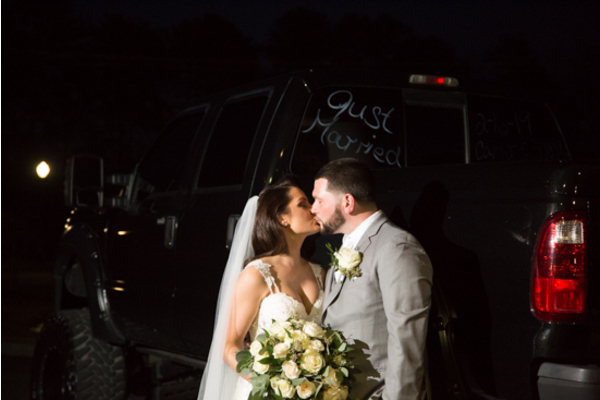 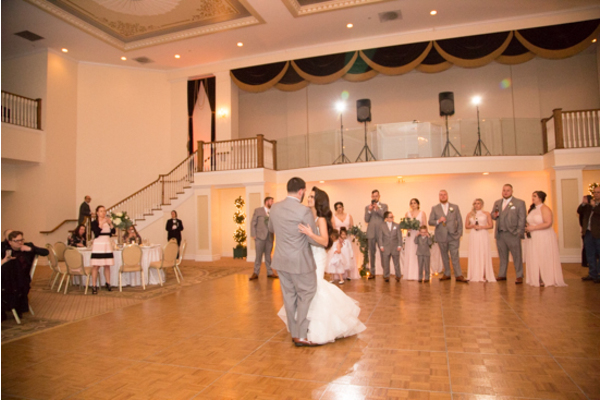 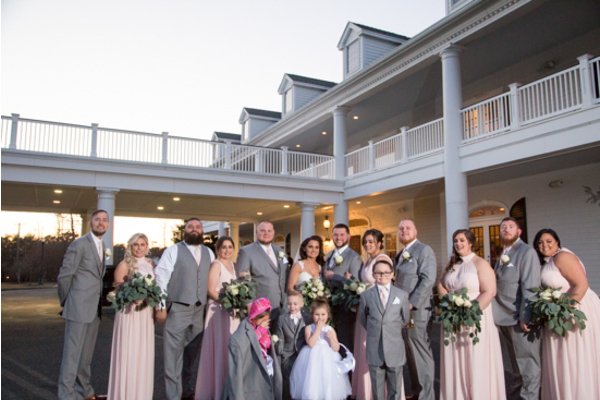 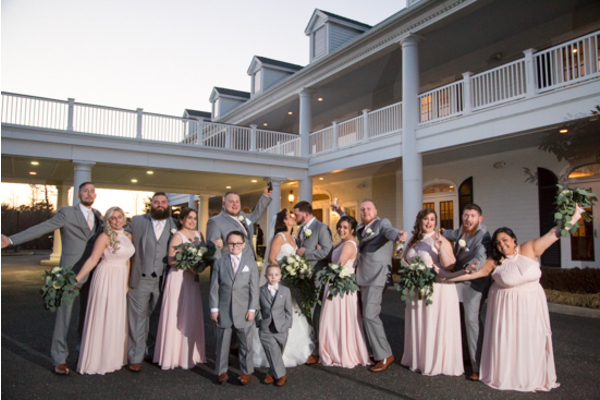 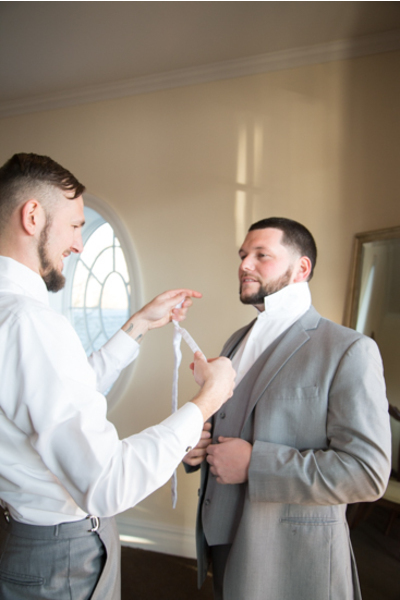 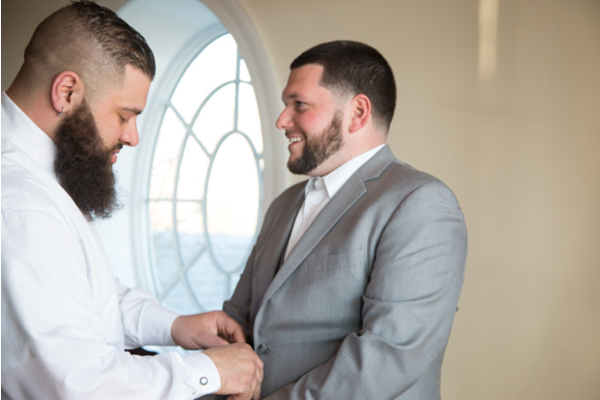 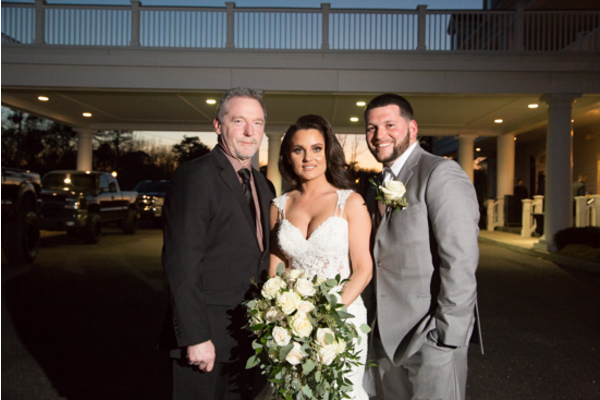 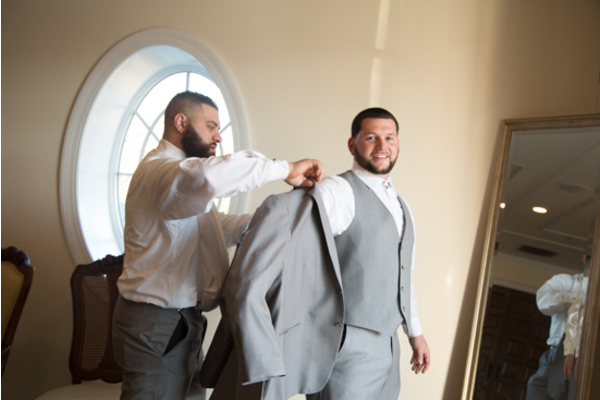 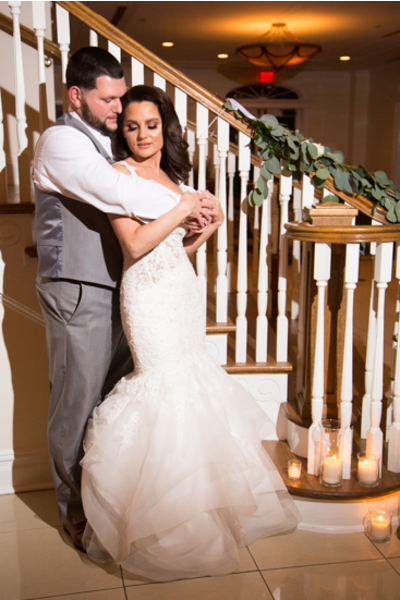 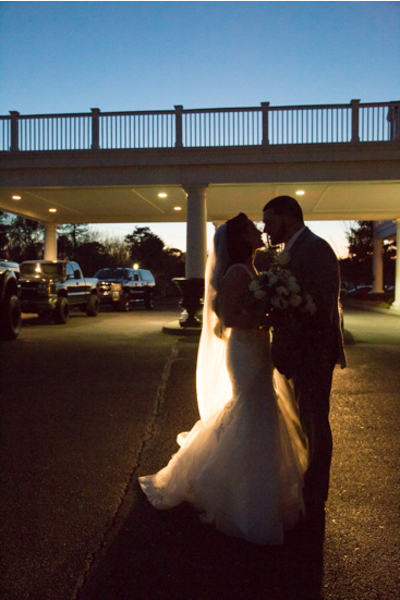 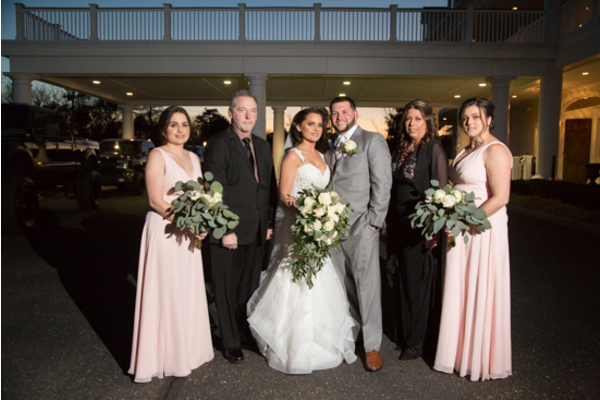 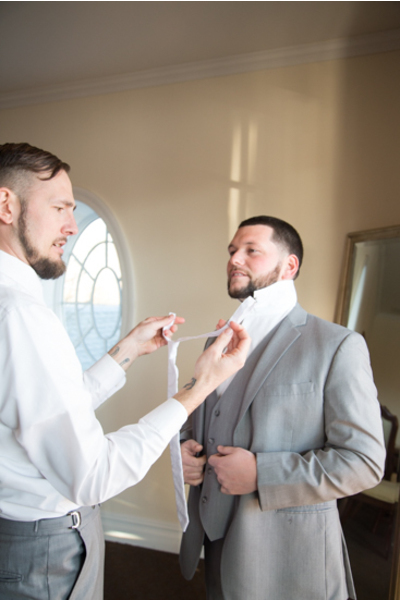 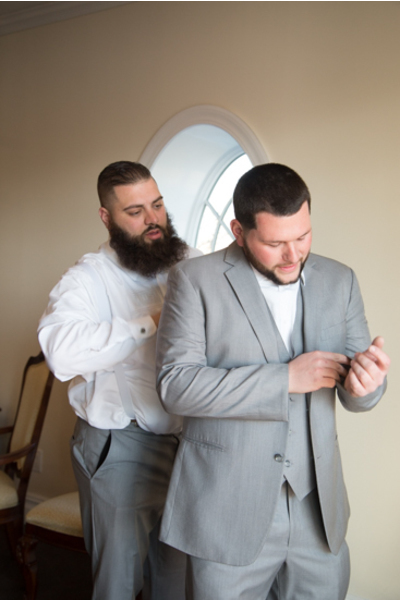 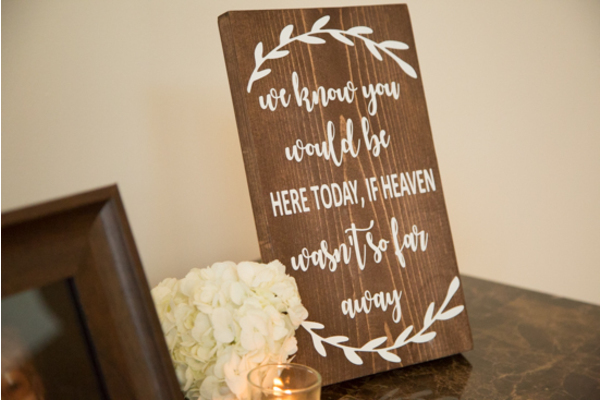 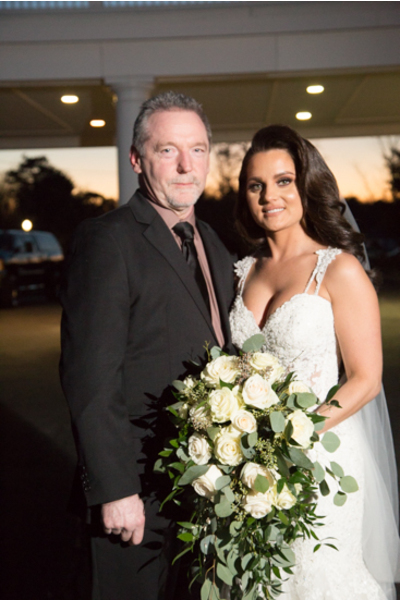 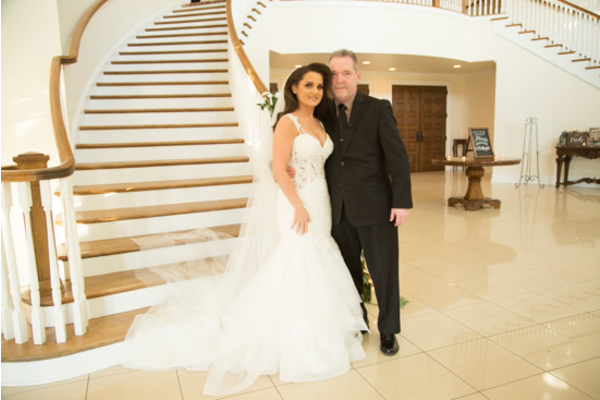 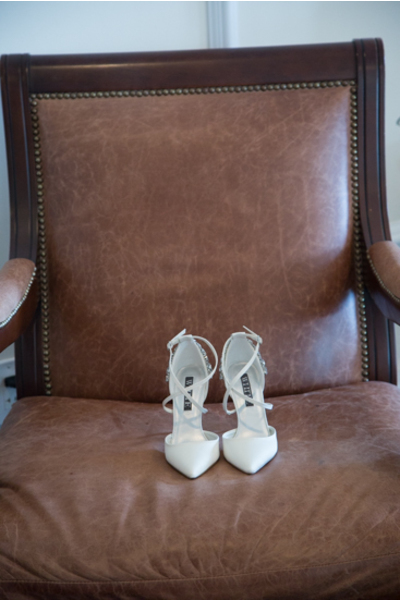 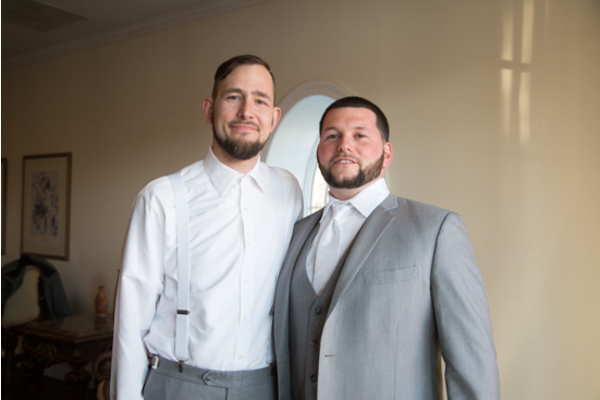 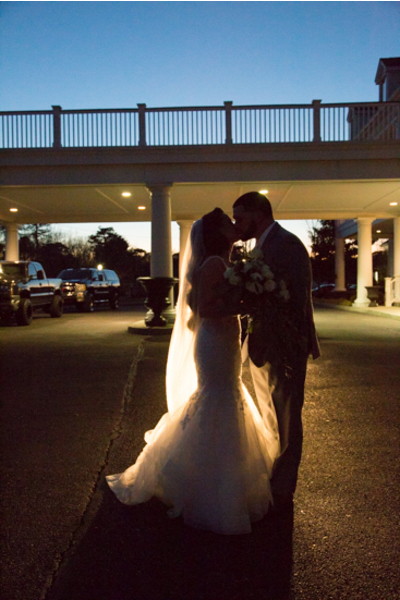 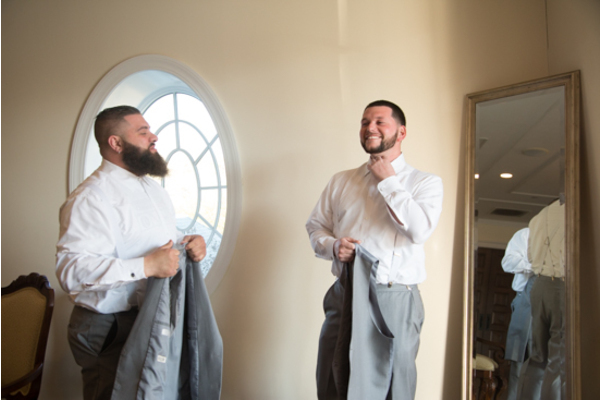 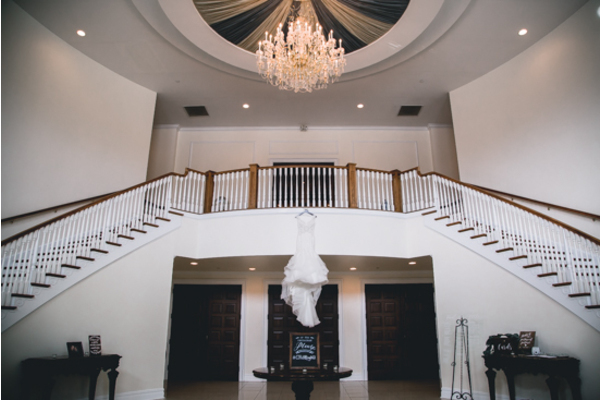 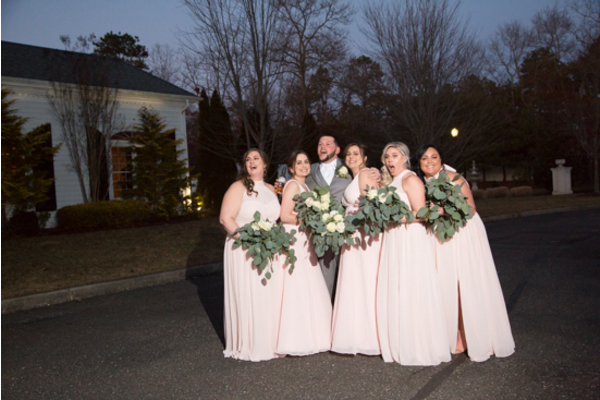 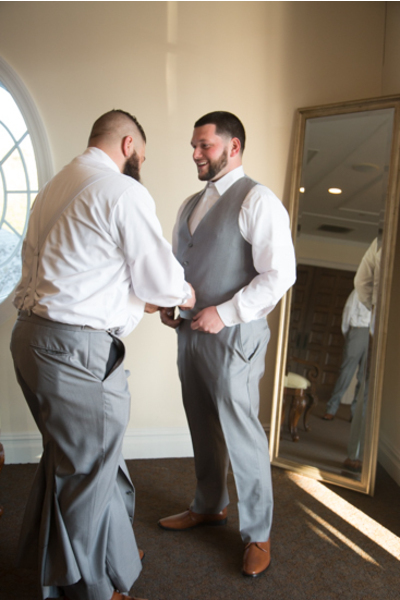 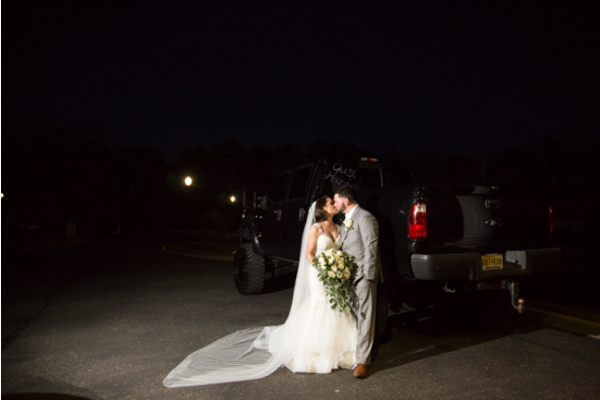 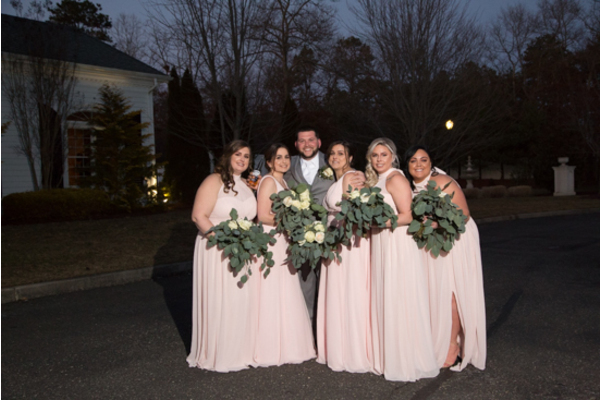 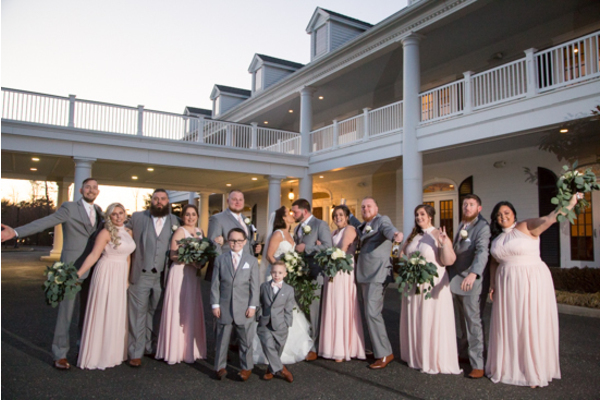 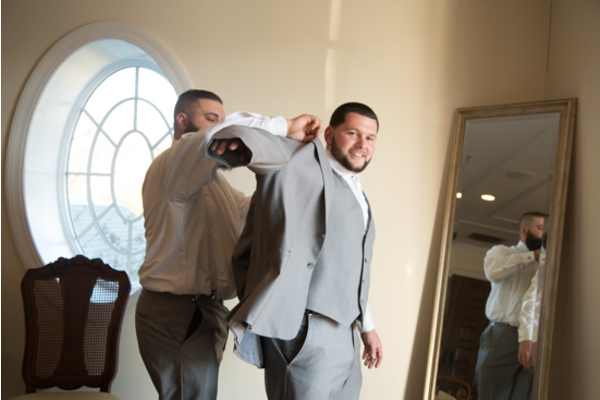 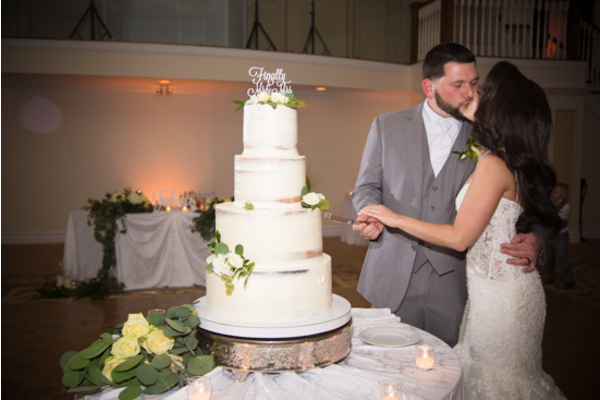 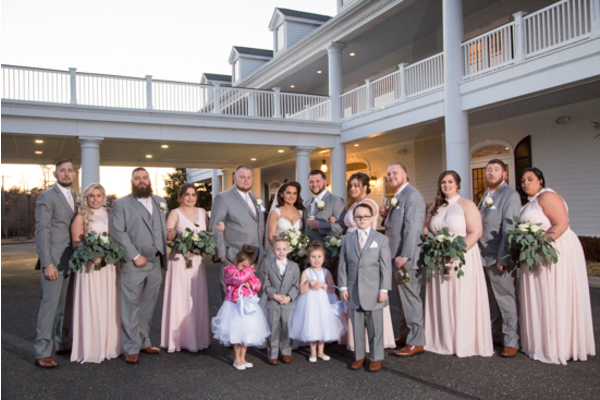 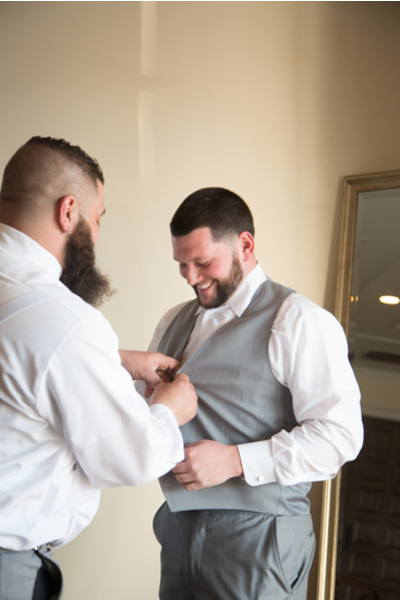 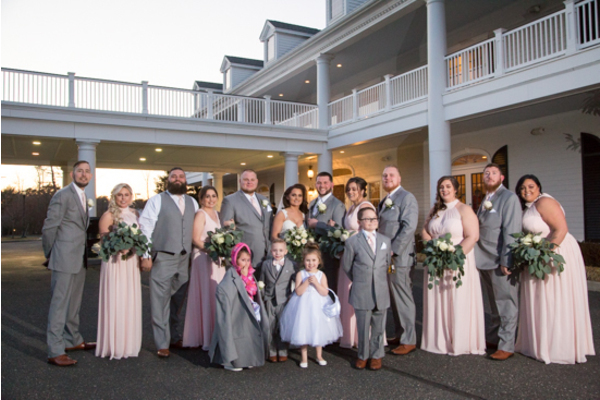 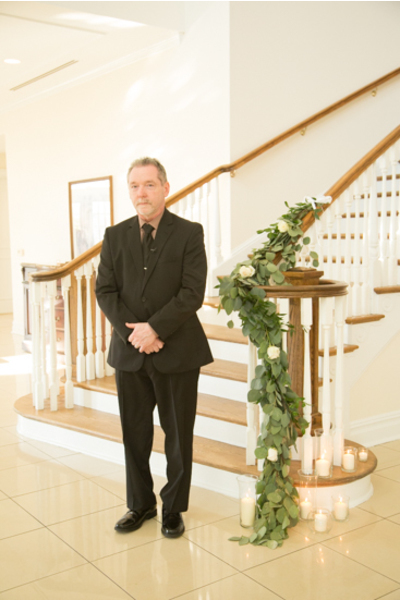 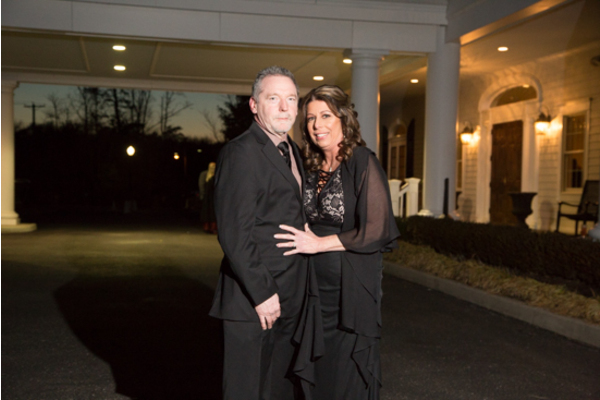 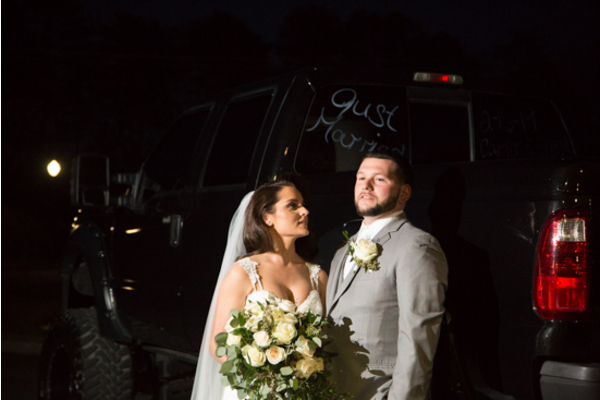 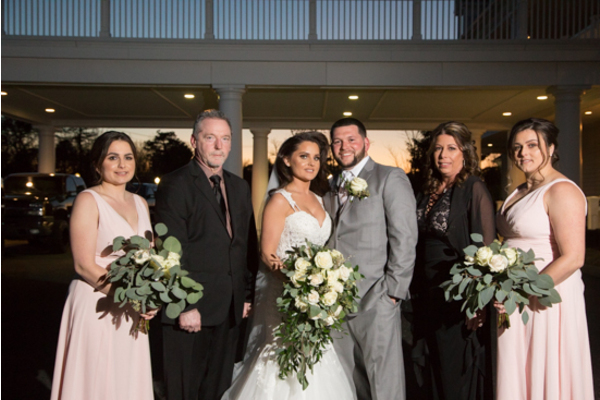 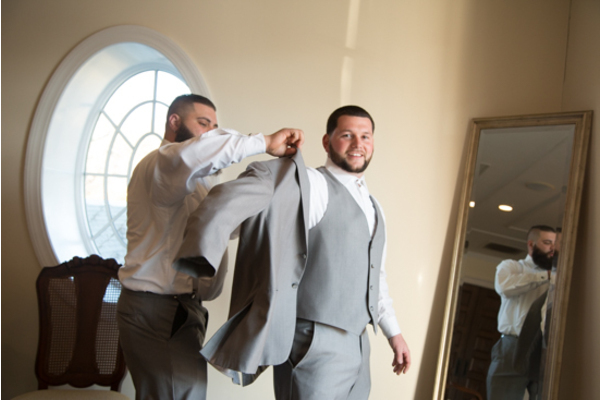 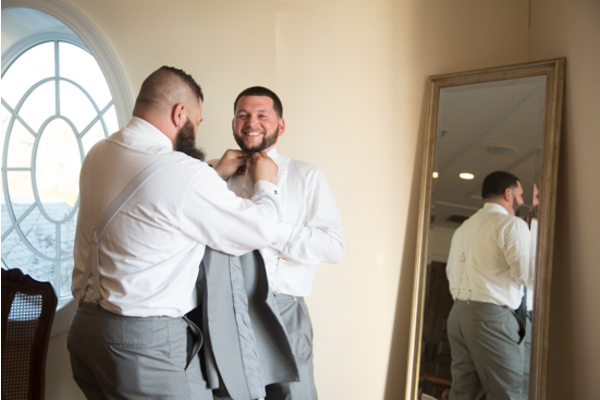 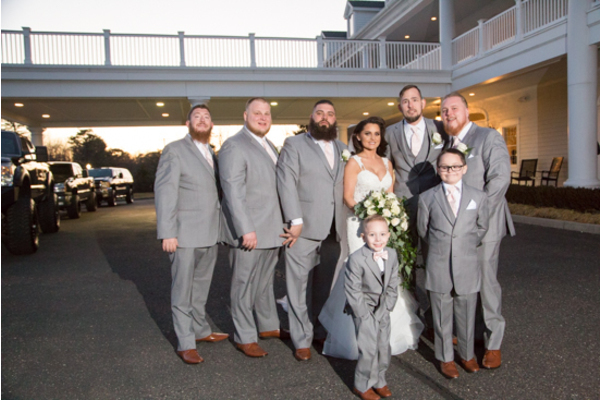 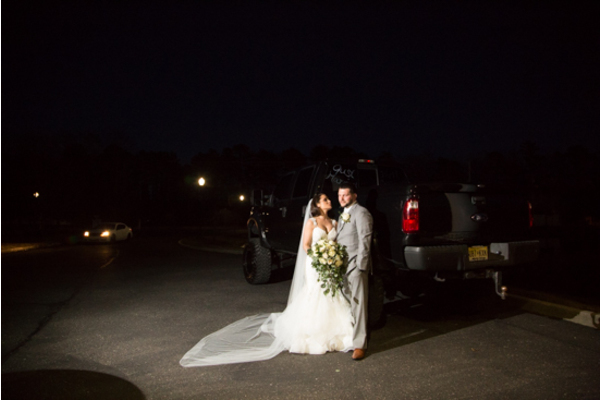 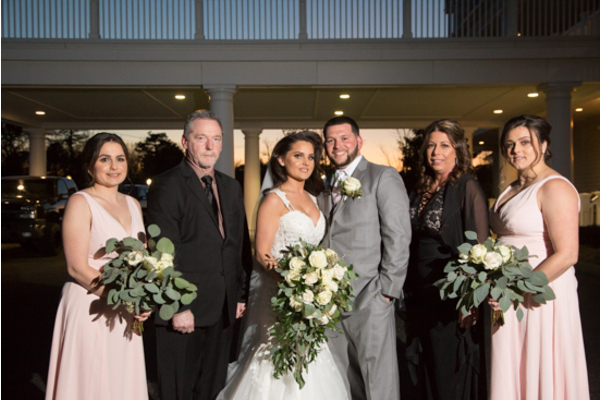 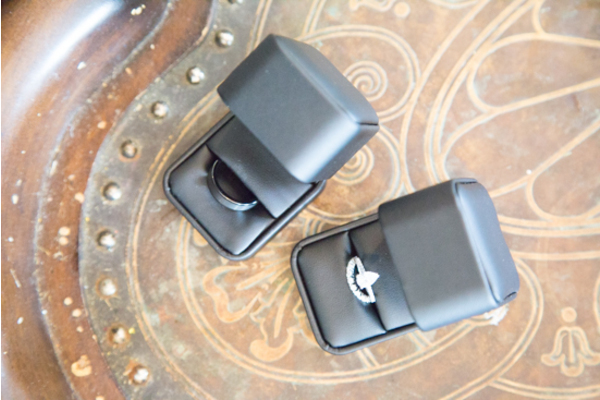 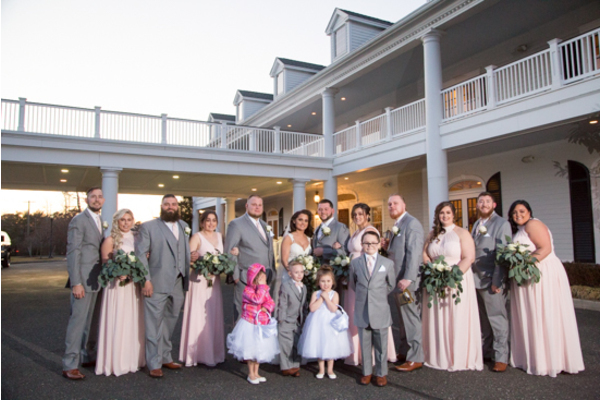 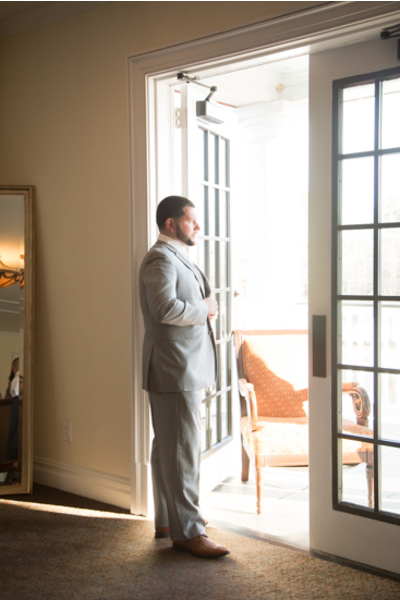 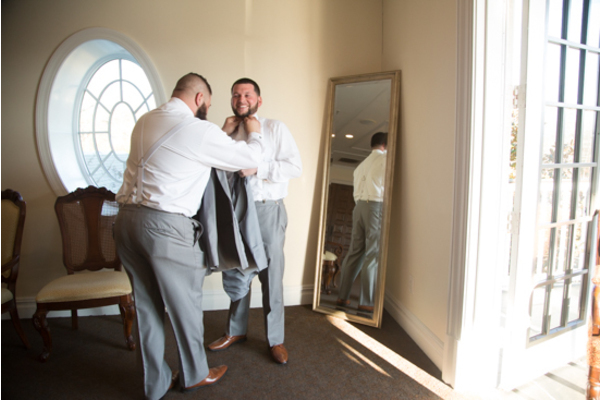 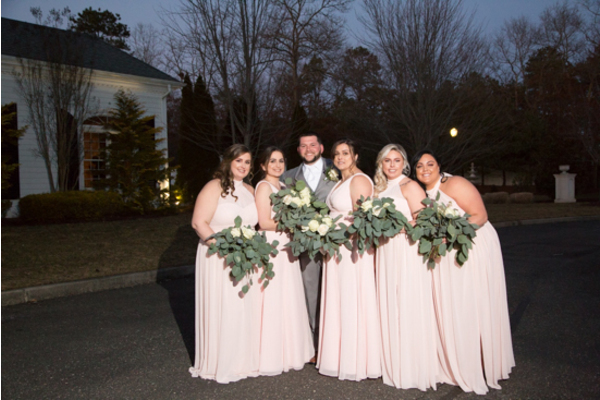 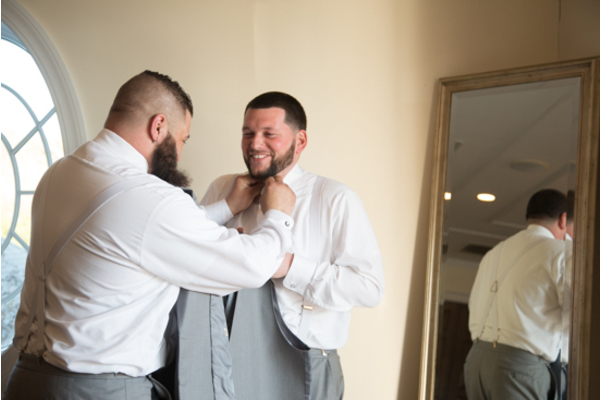 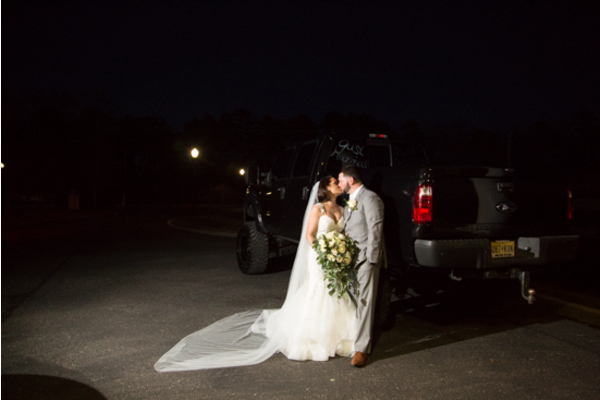 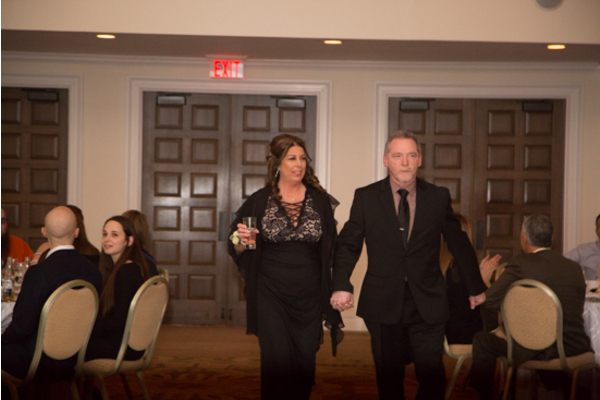 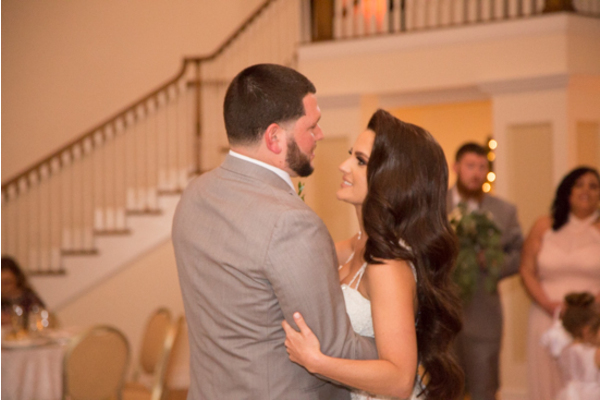 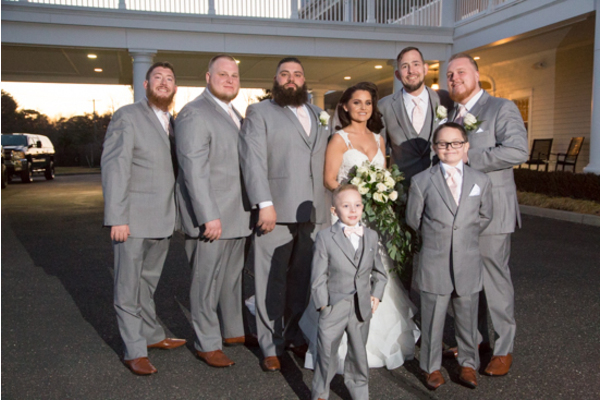 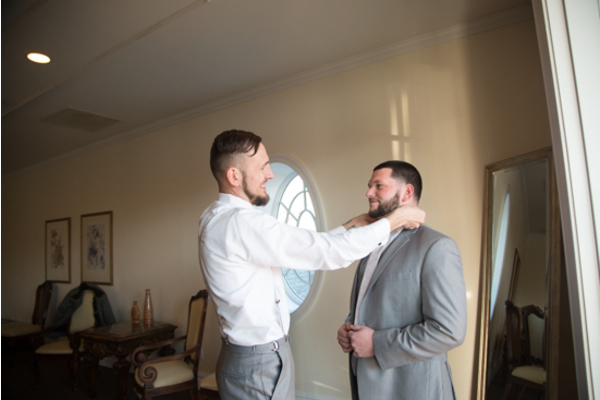 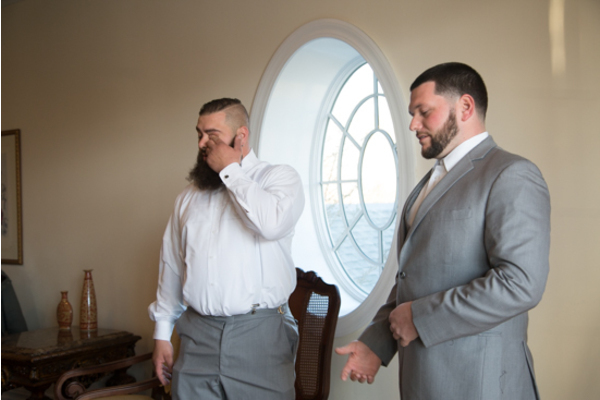 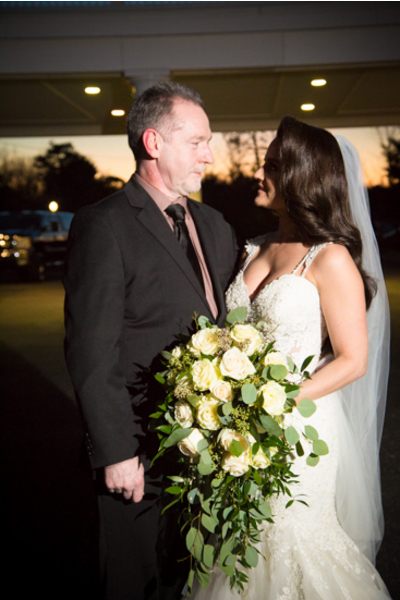 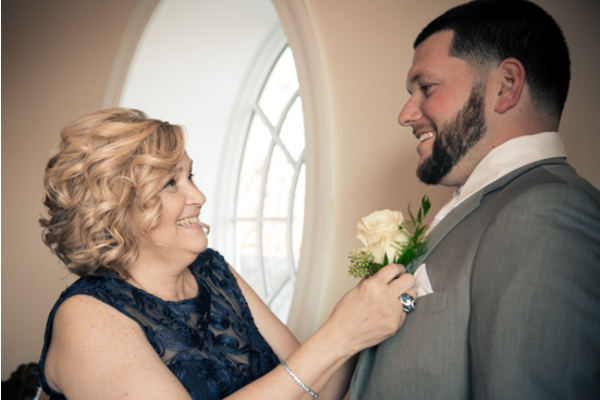 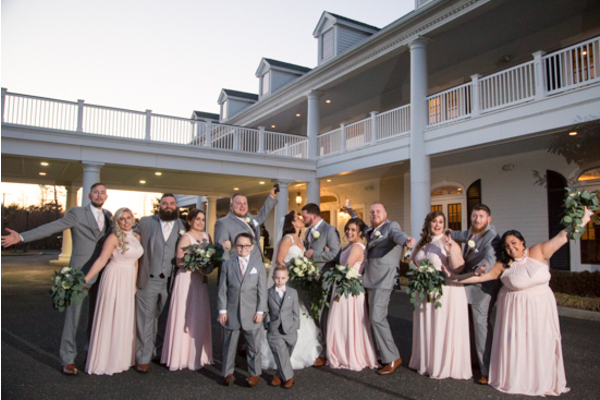 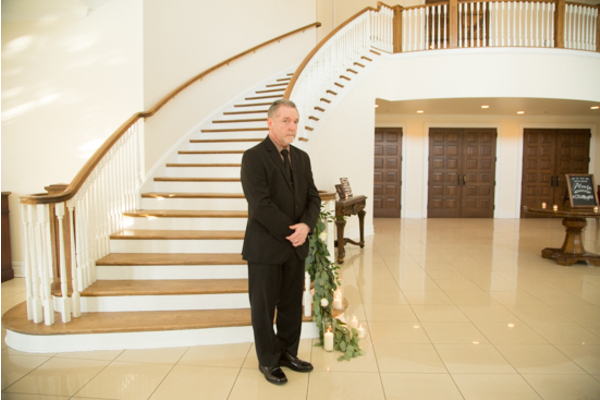 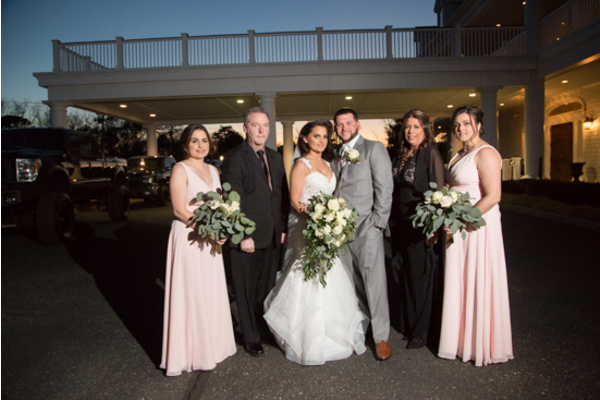 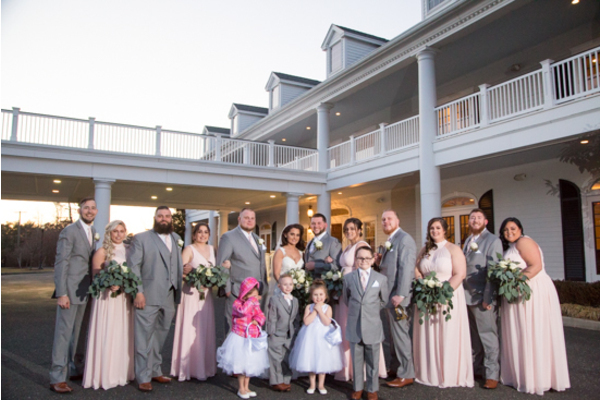 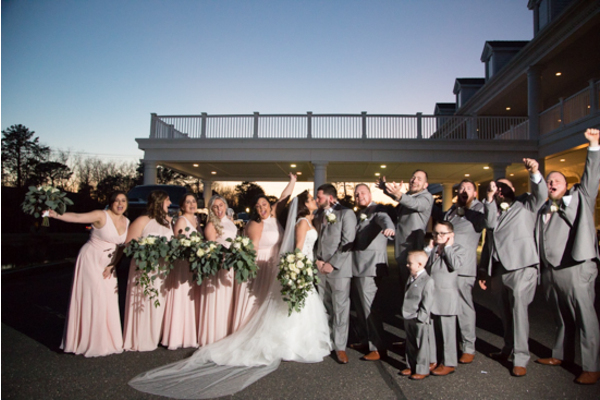 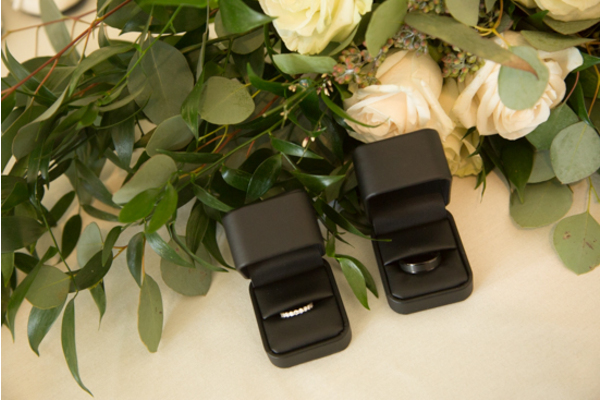 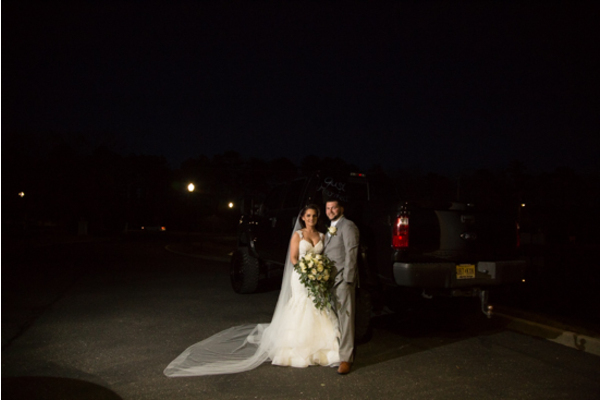 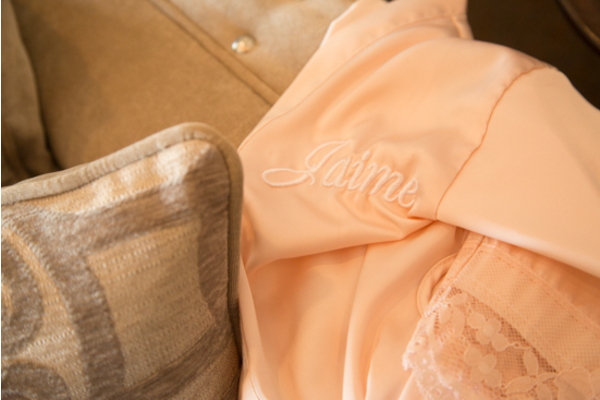 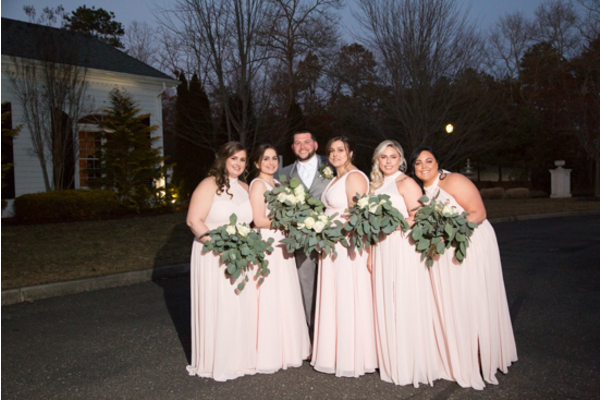 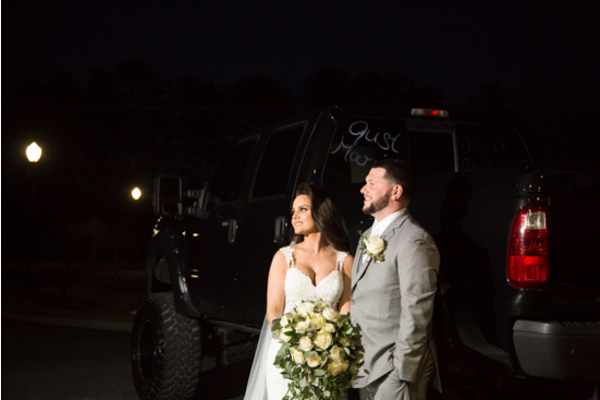 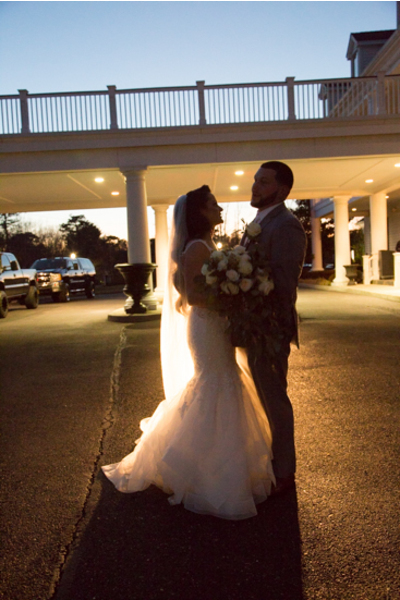 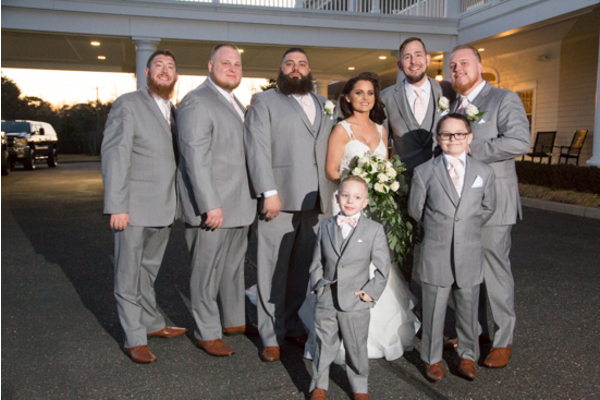 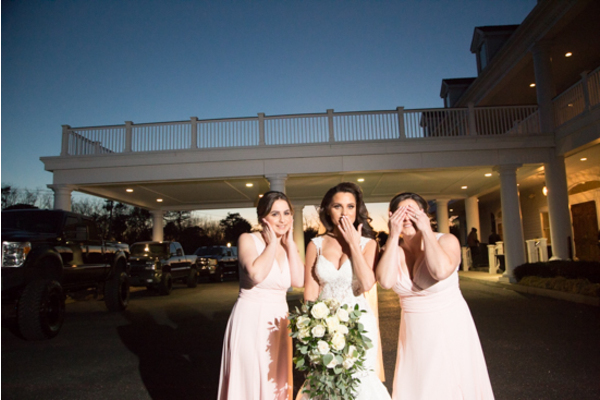 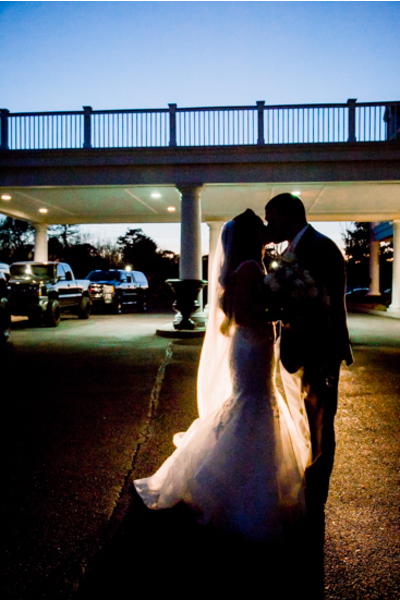 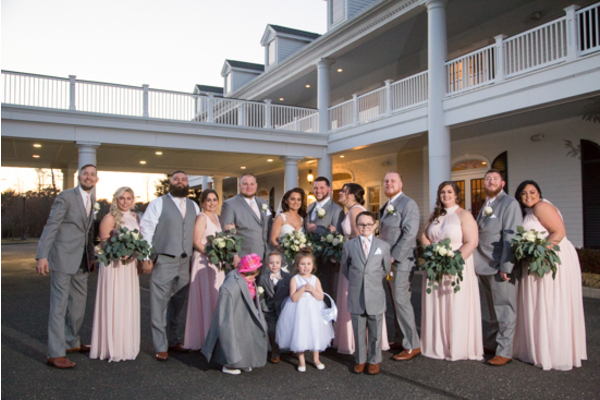 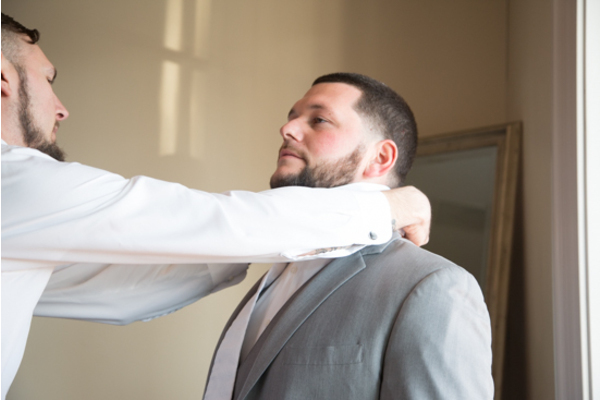 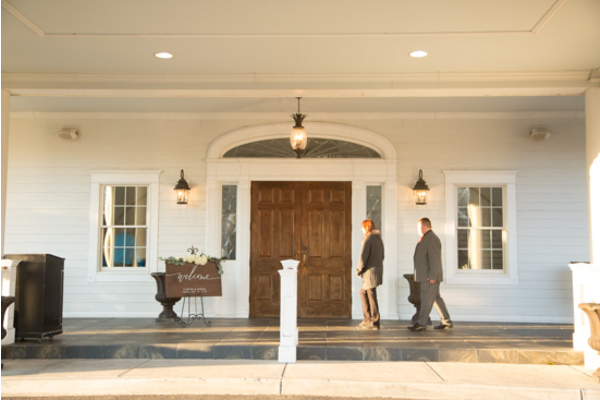 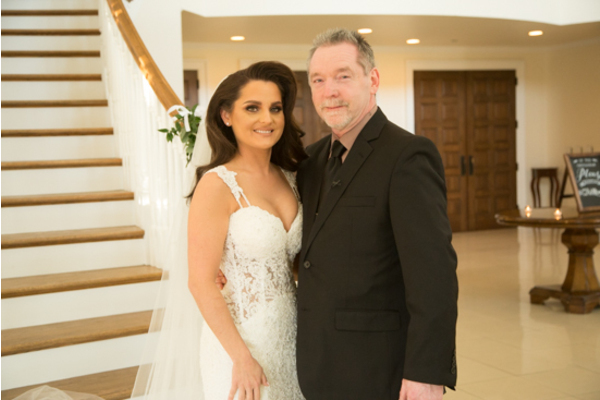 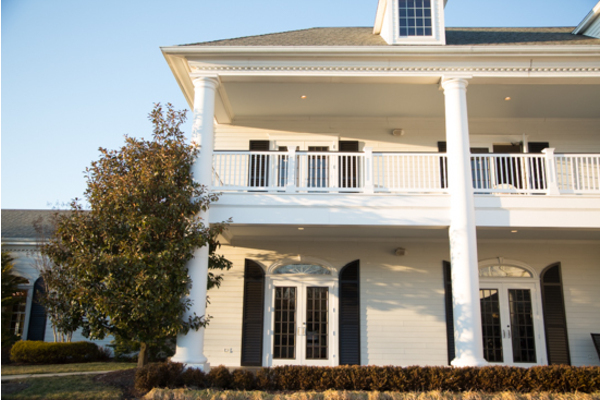 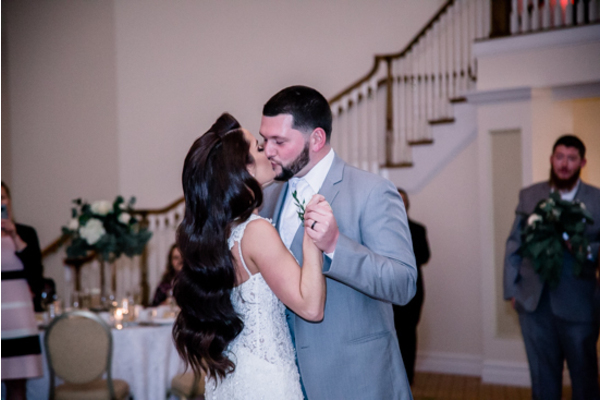 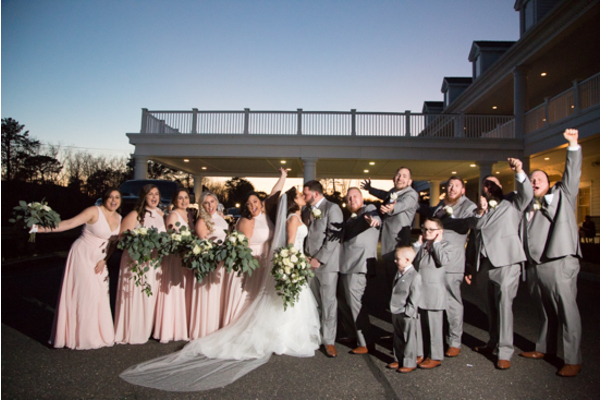 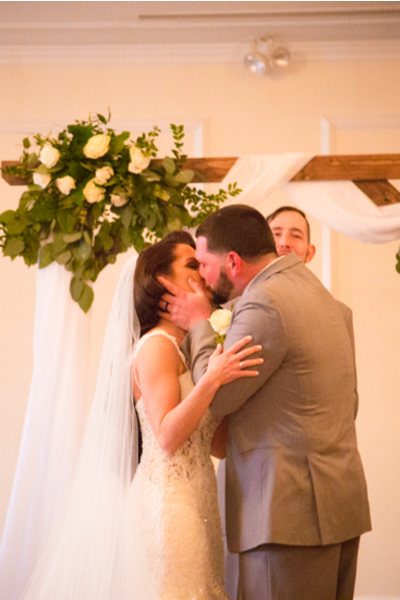 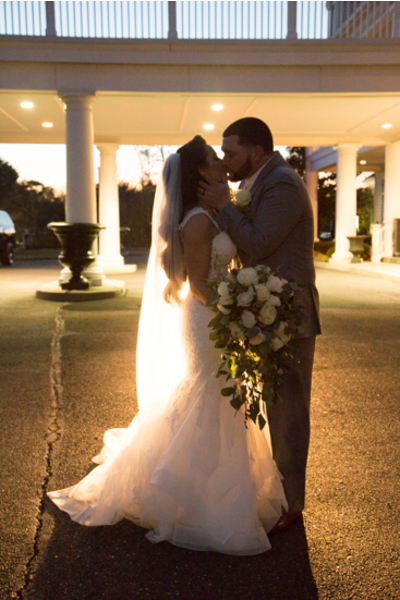 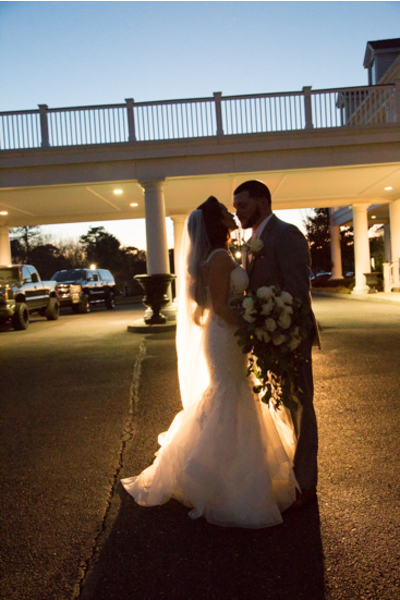 The lovely couple celebrated their wedding just two days after Valentine’s Day at The Carriage House in Galloway, NJ. 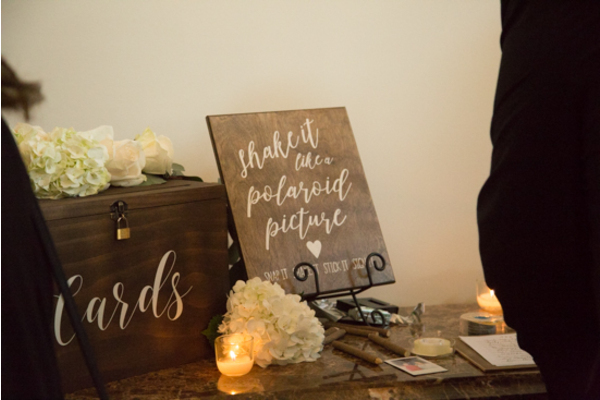 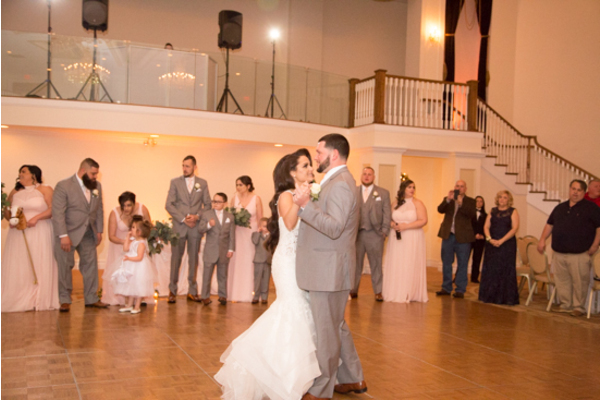 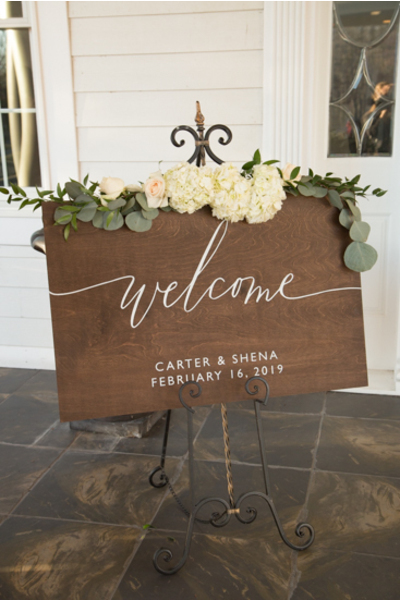 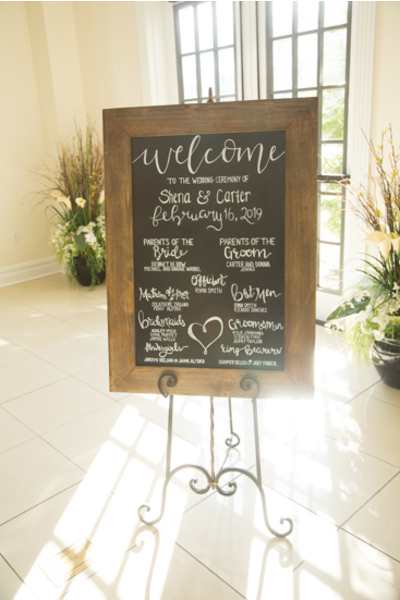 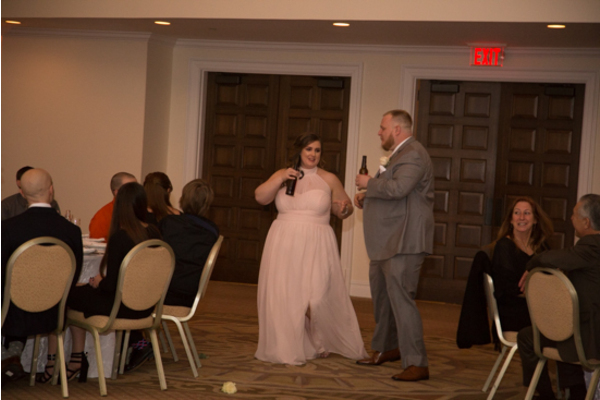 Shena and Carter took full advantage of all that we have to offer our couples at Enchanted Celebrations with photo, video, and DJ! 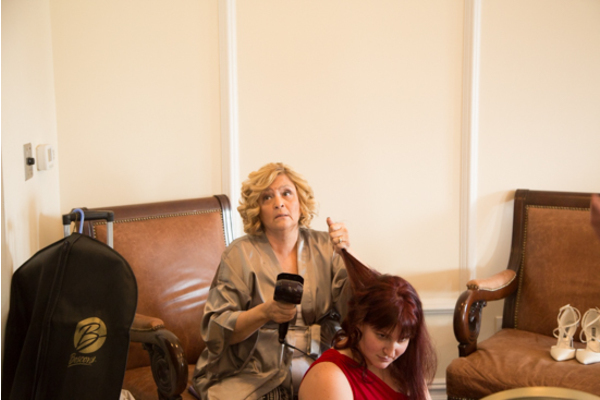 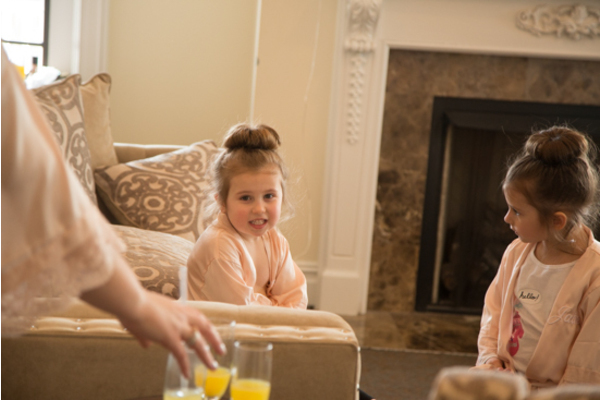 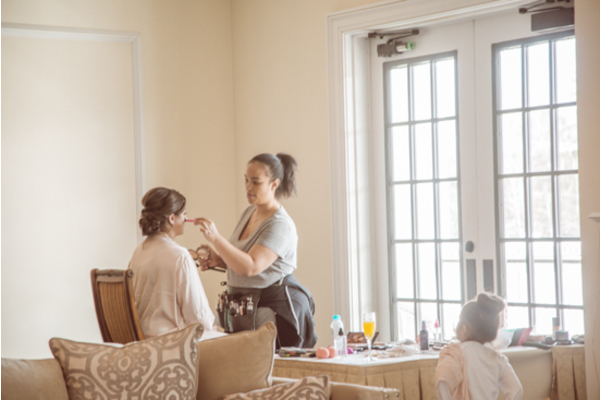 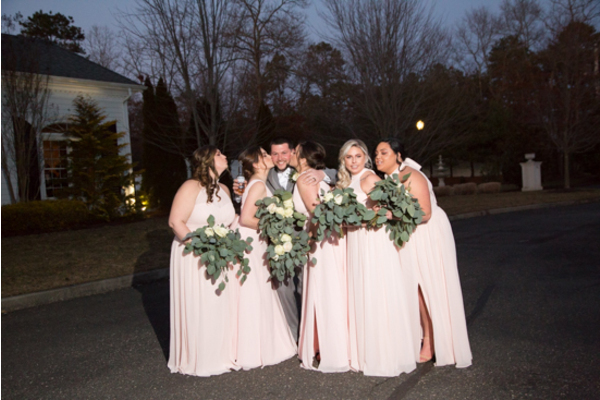 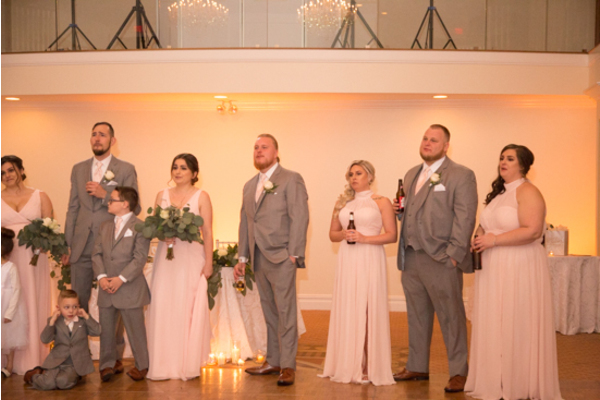 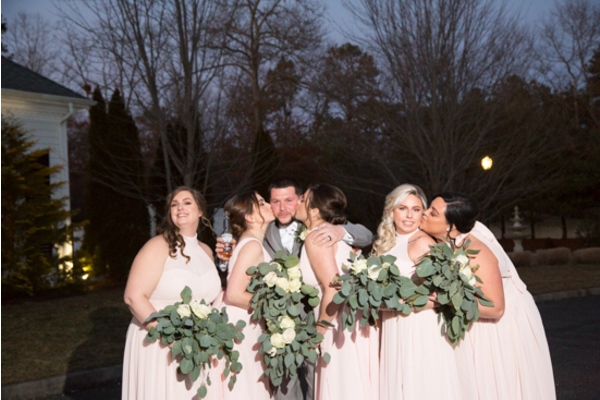 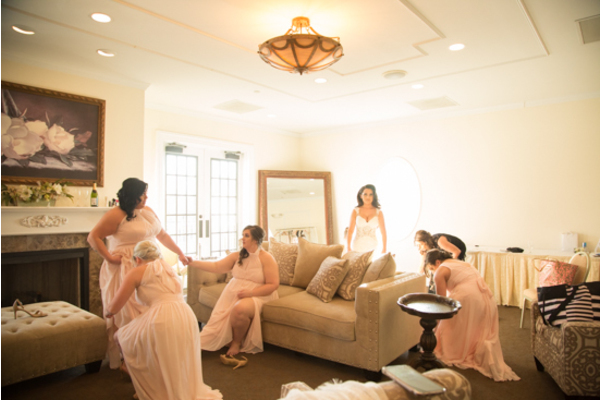 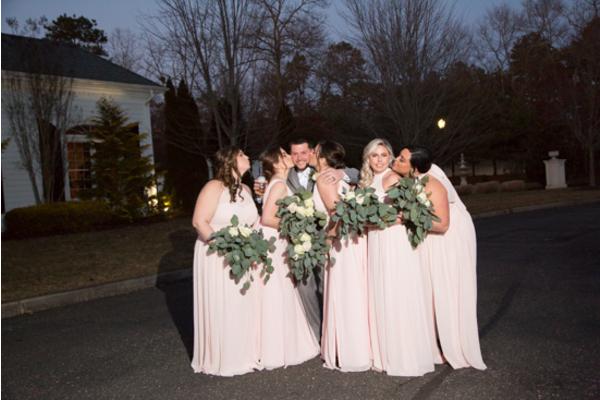 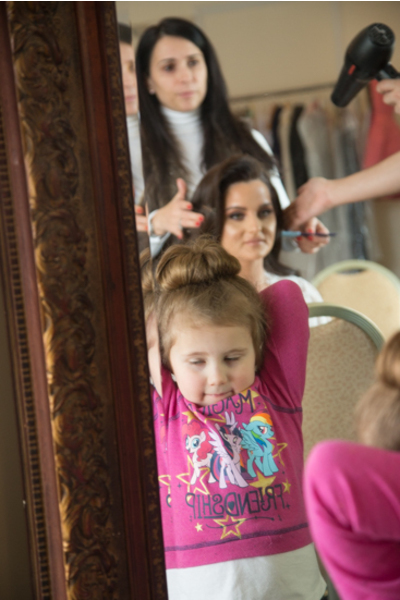 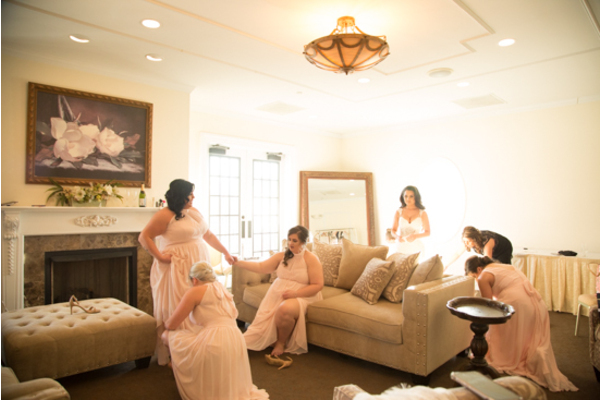 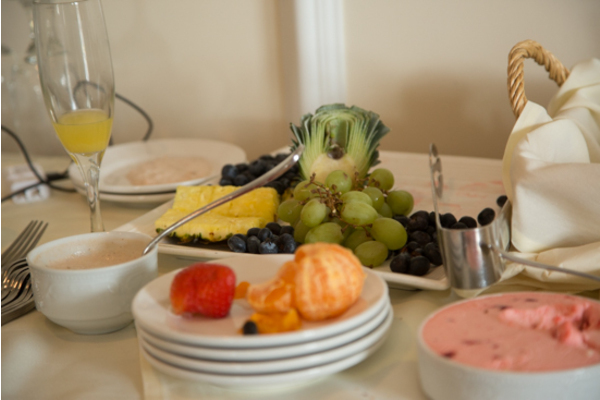 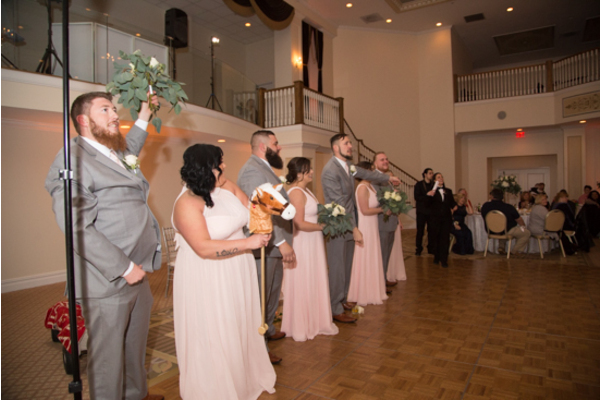 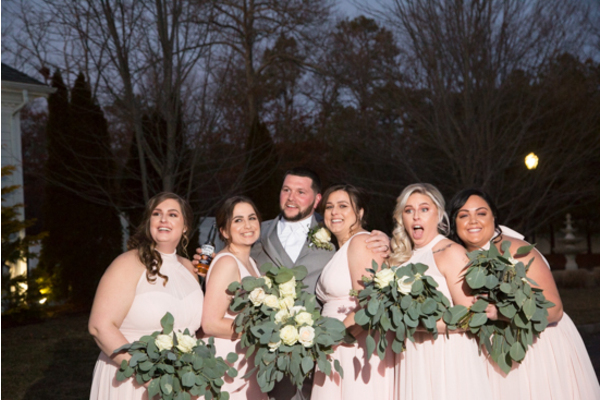 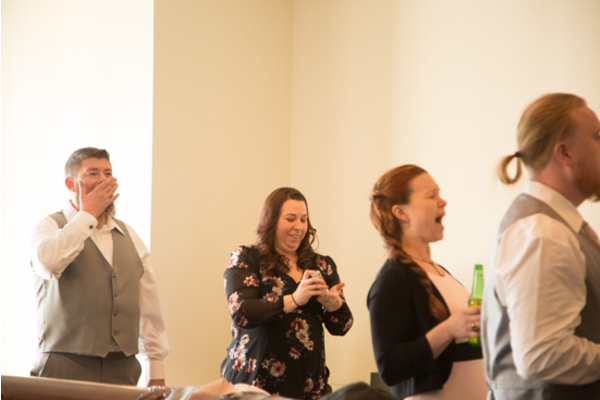 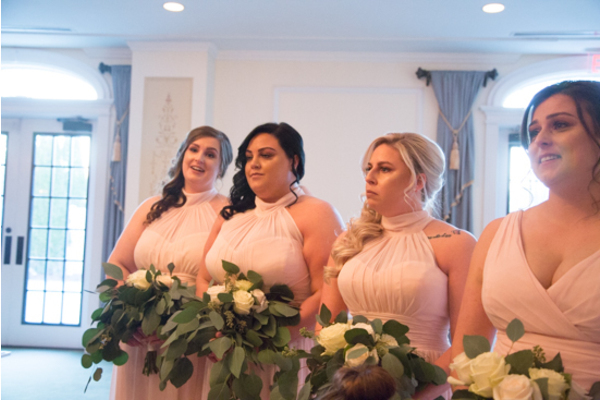 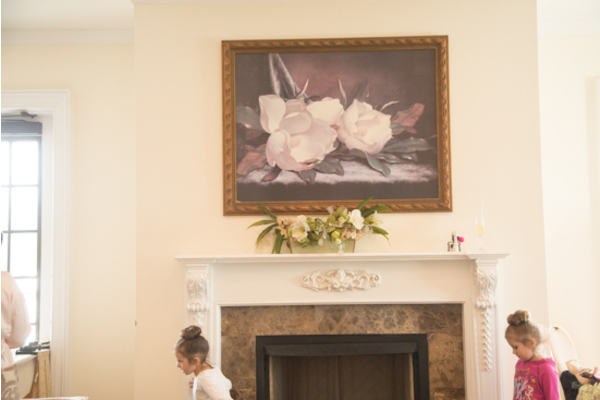 First, our NJ Wedding Photographer made sure to capture the beautiful bridal party getting ready and sipping on delicious mimosas. 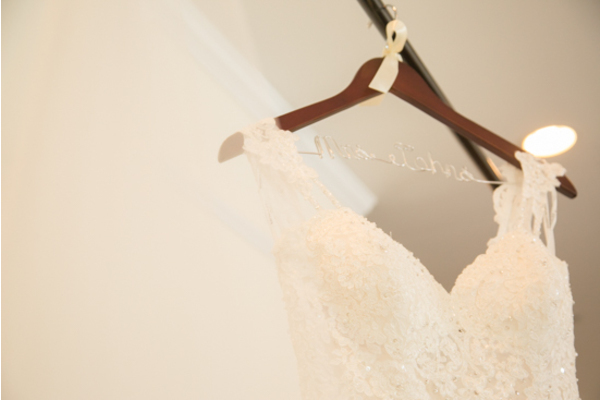 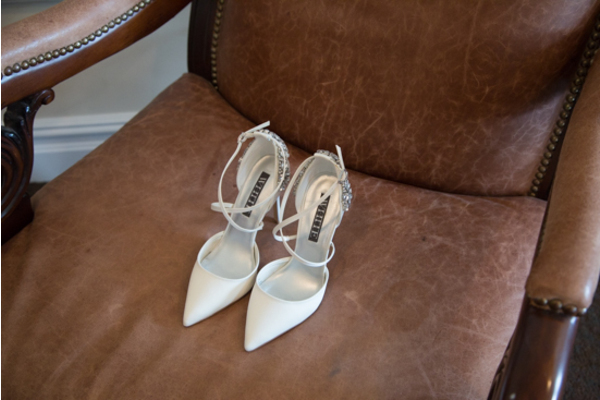 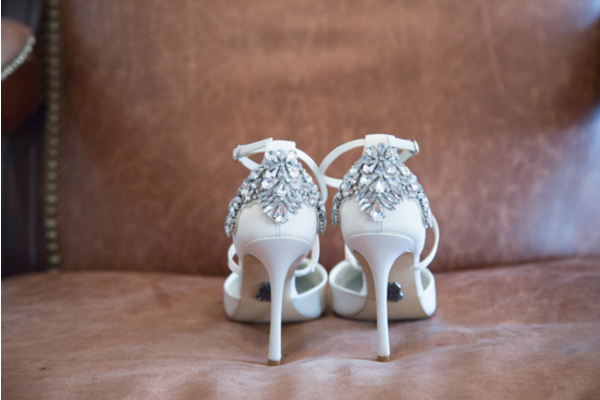 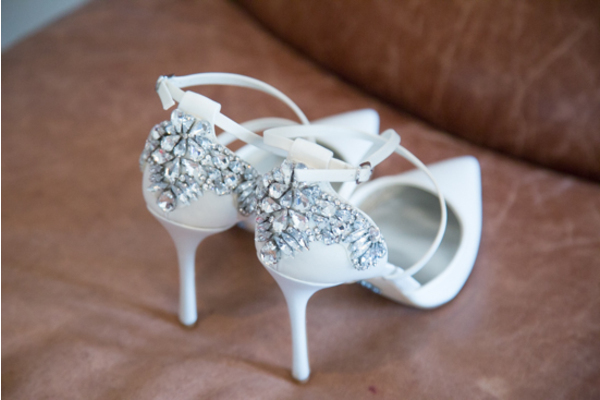 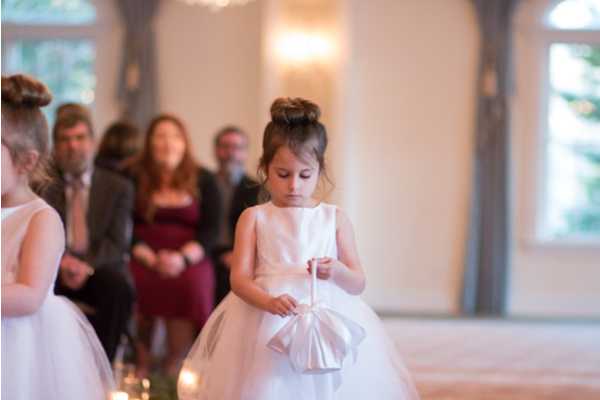 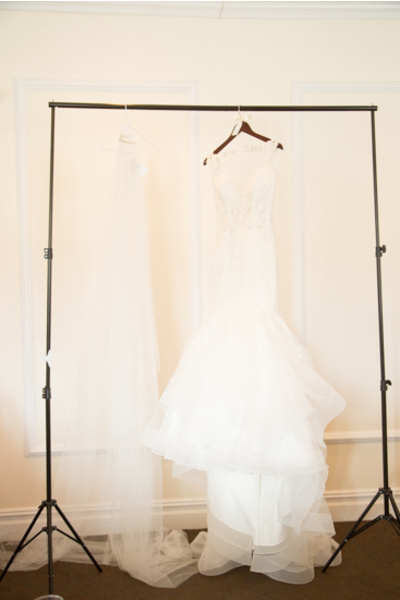 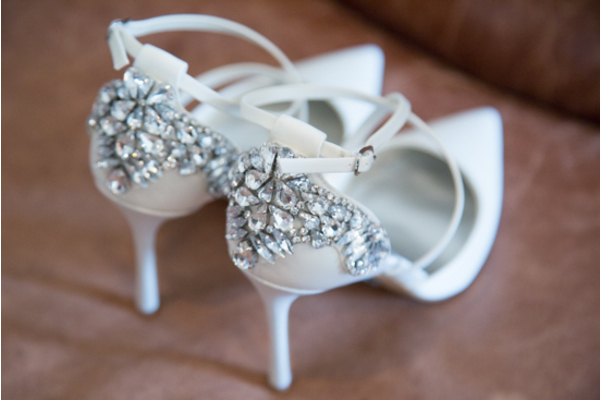 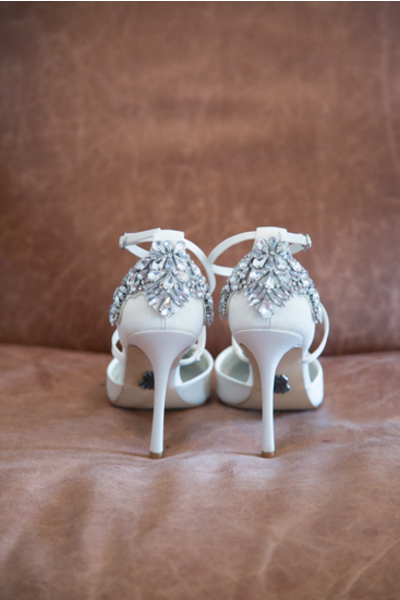 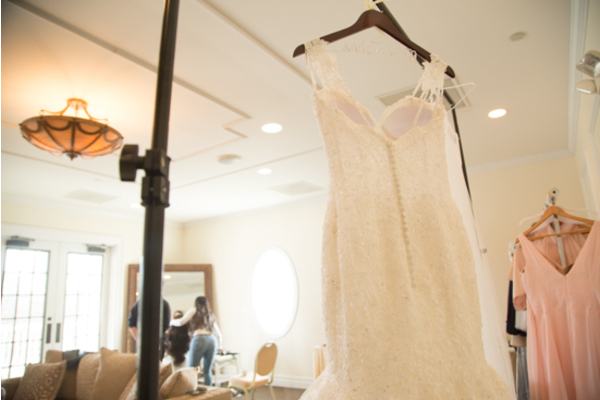 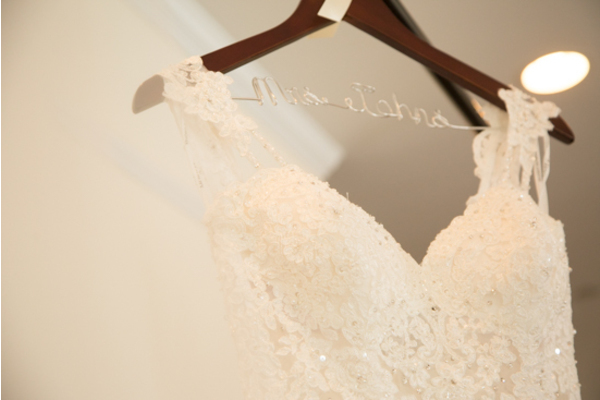 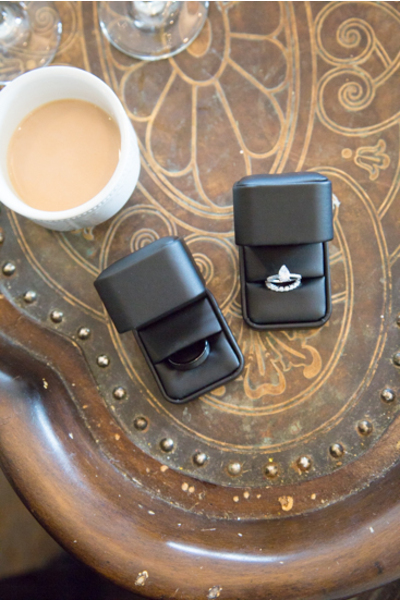 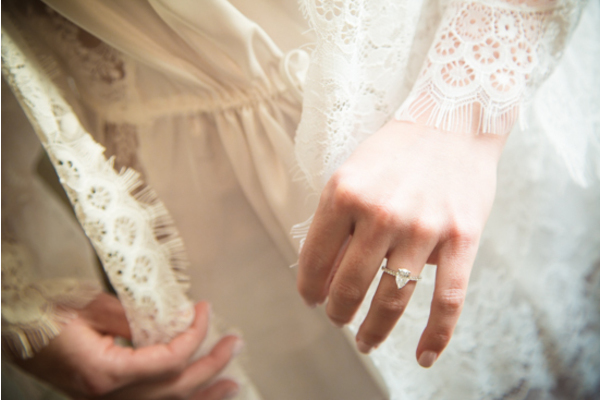 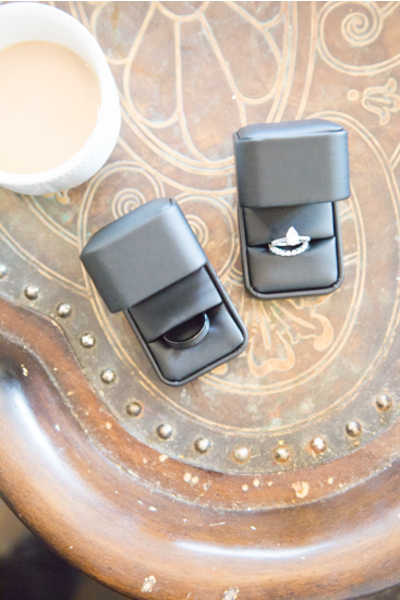 In addition, detail shots were photographed of Shena’s dress, perfume, jewelry, and sparkly shoes! 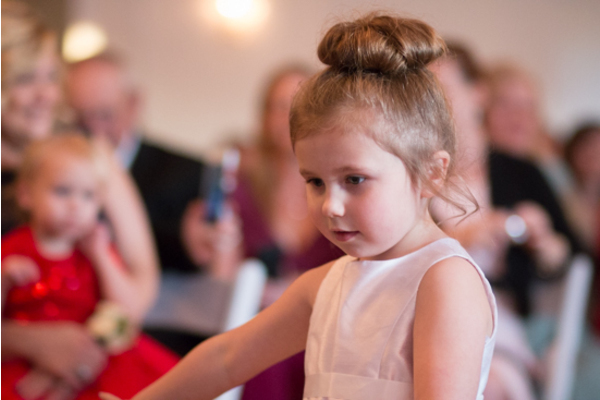 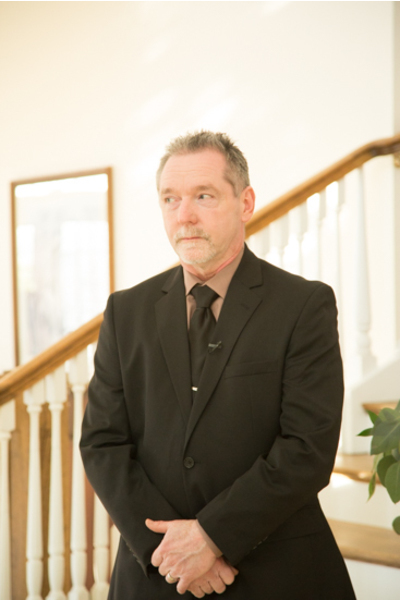 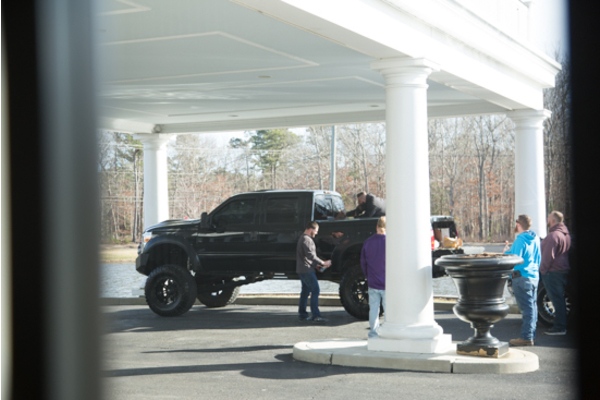 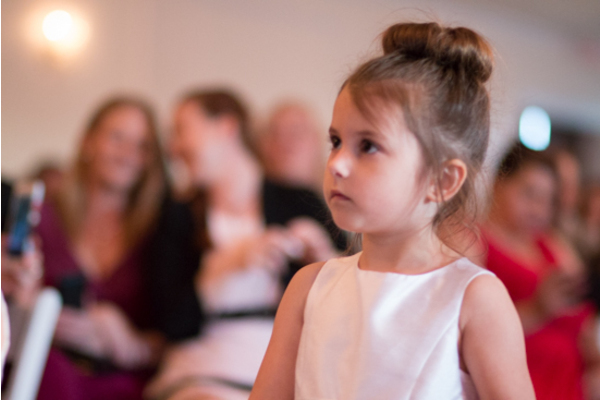 Later, Shena’s dad got his first look at his precious daughter all dressed up and ready to marry Carter. 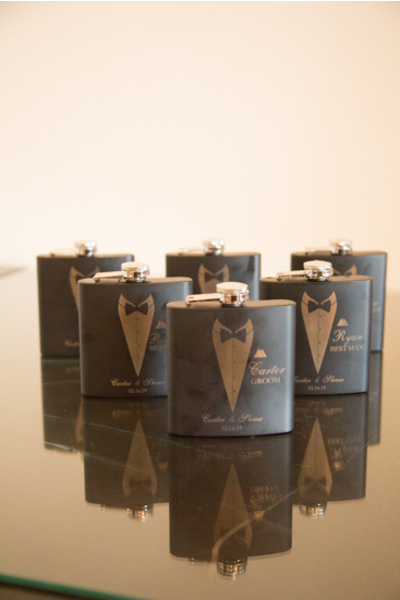 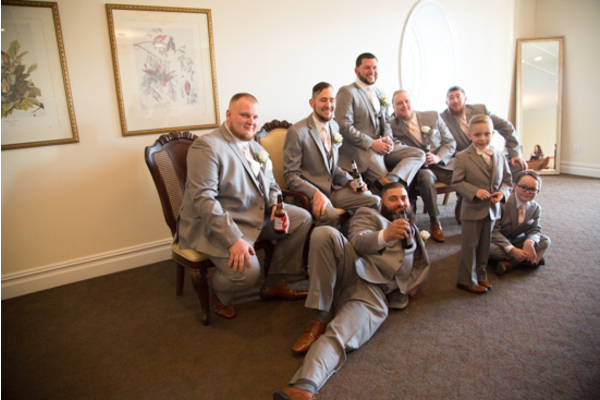 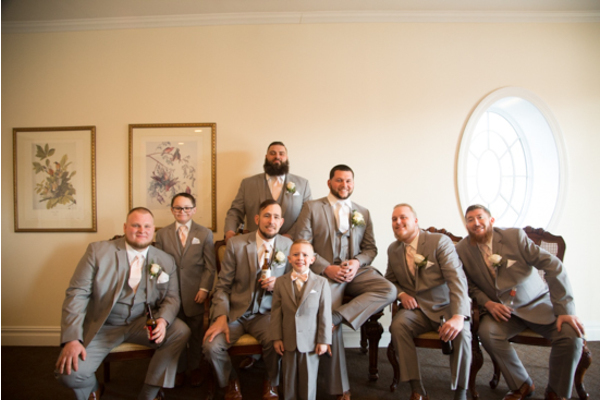 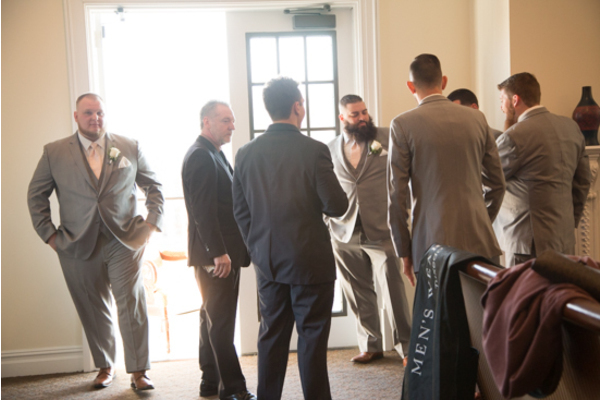 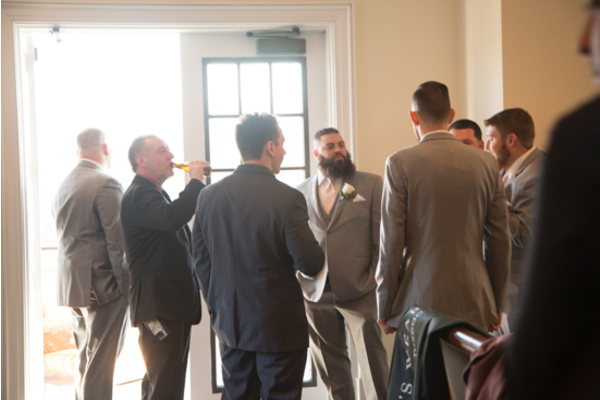 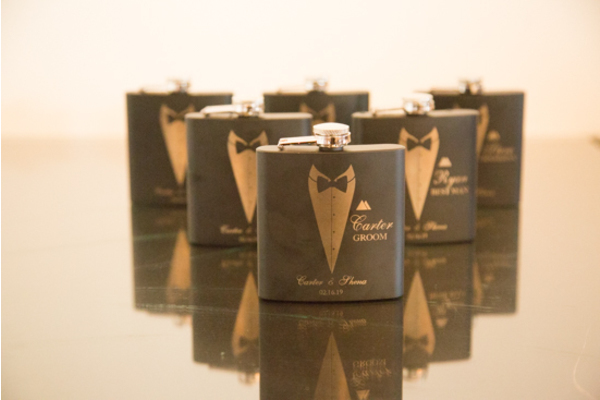 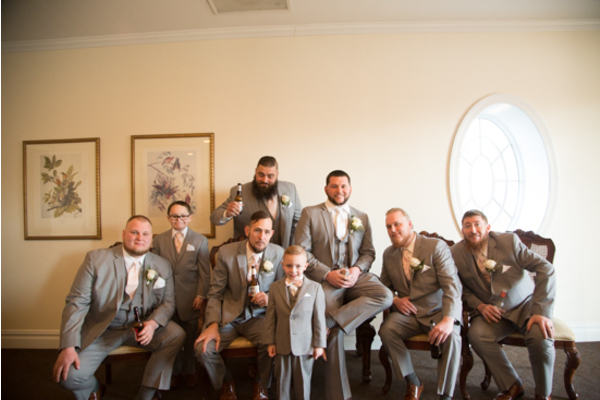 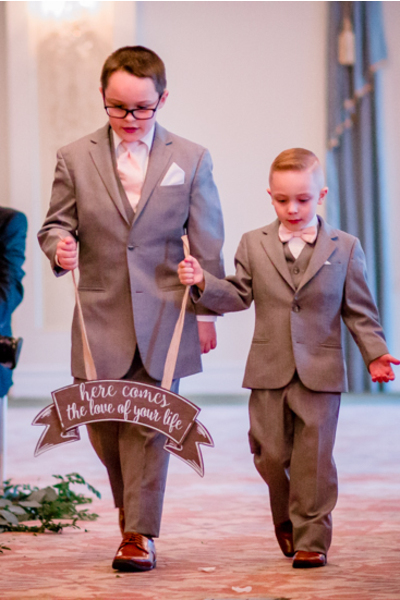 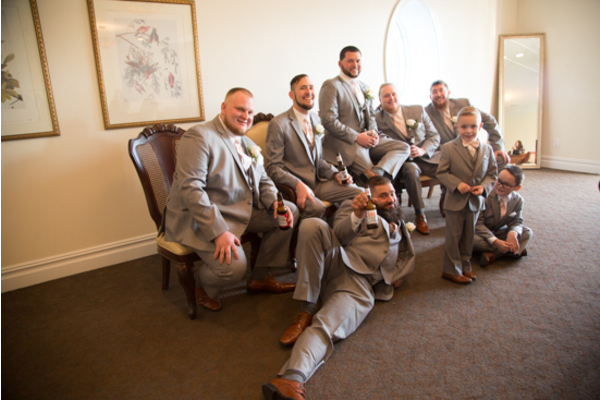 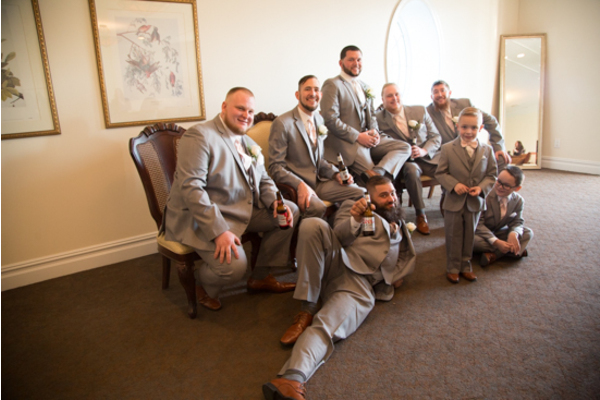 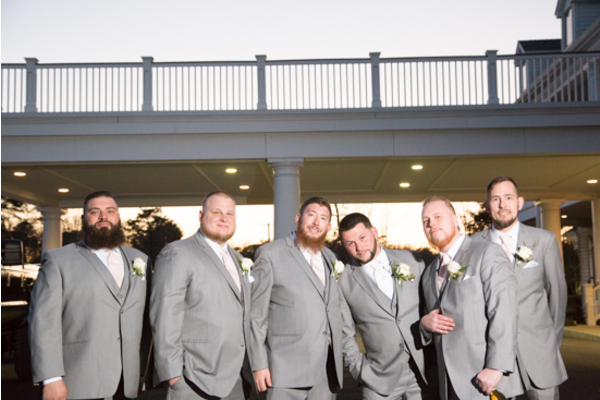 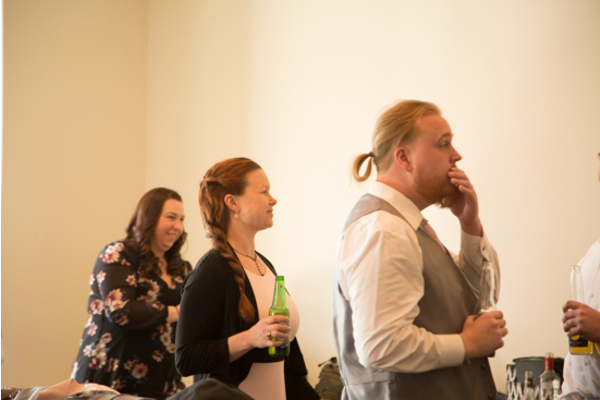 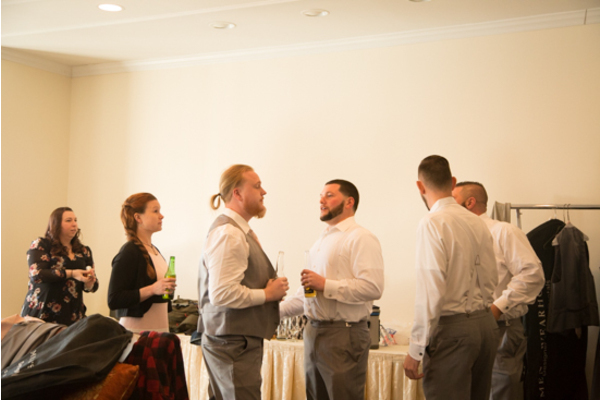 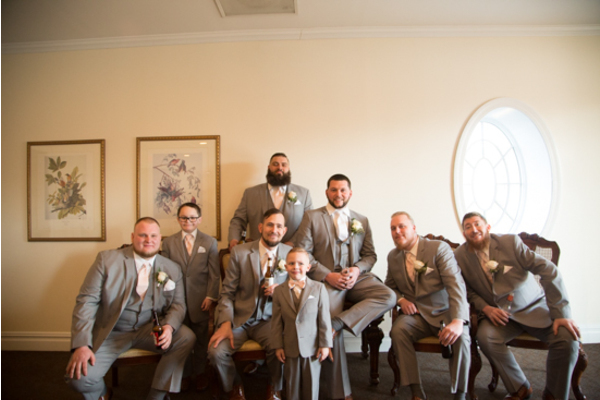 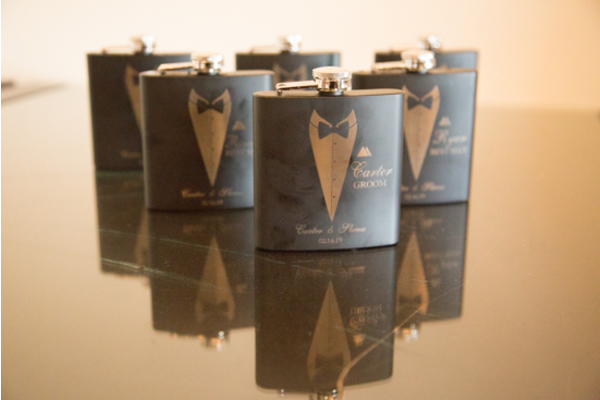 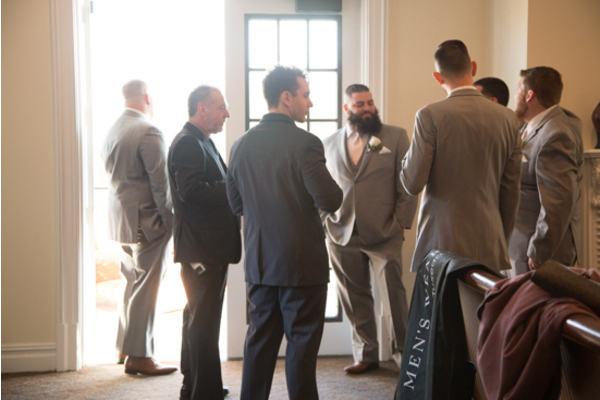 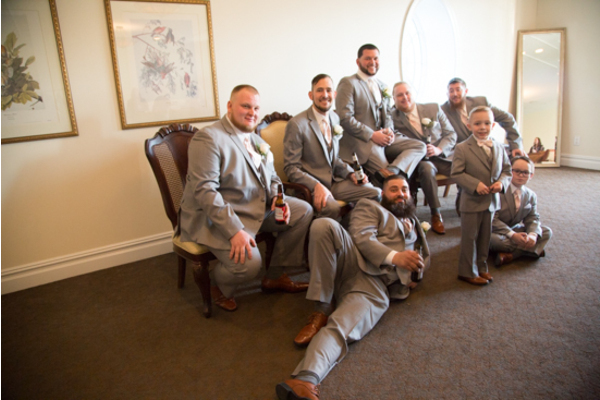 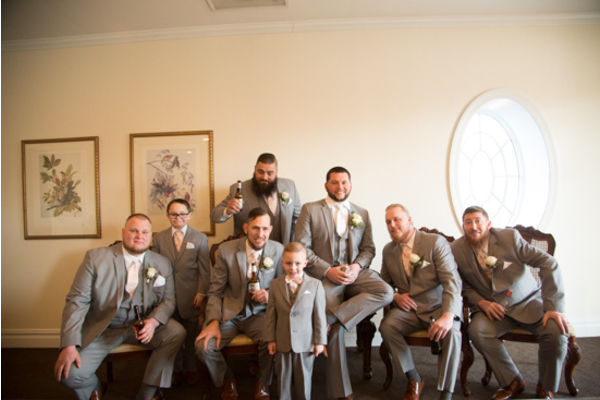 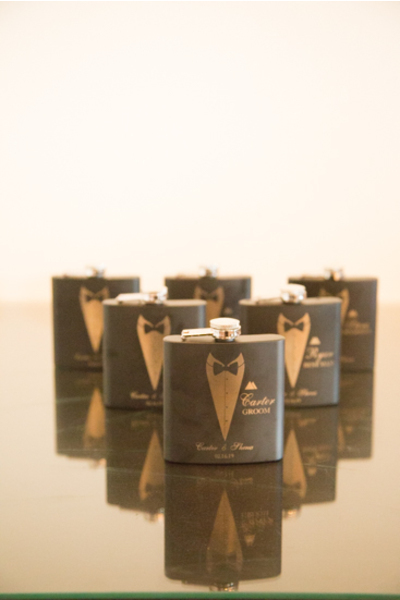 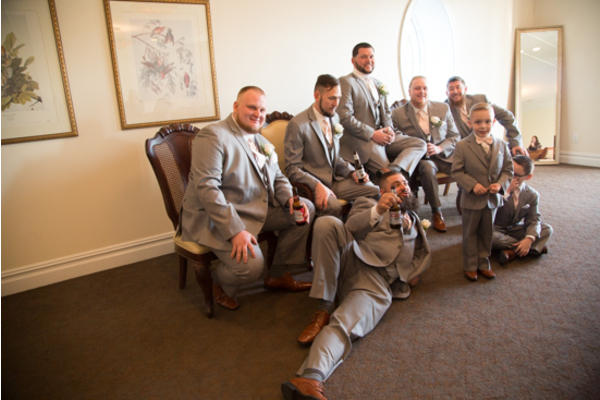 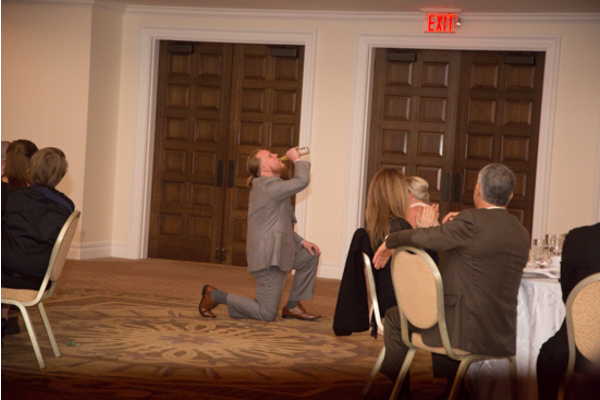 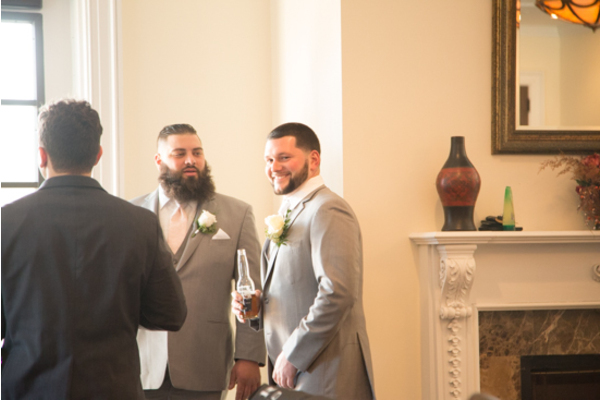 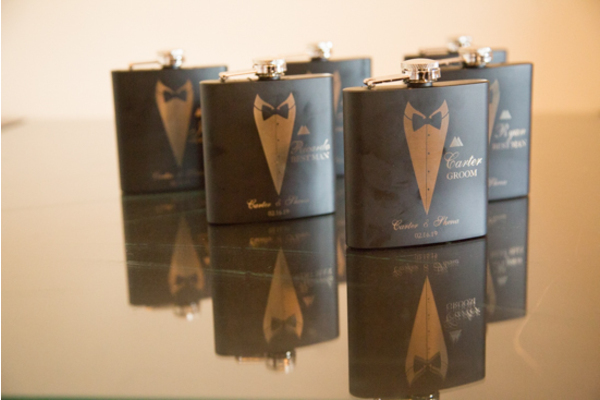 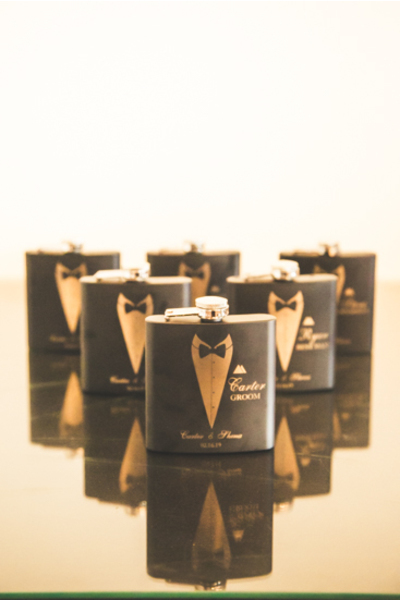 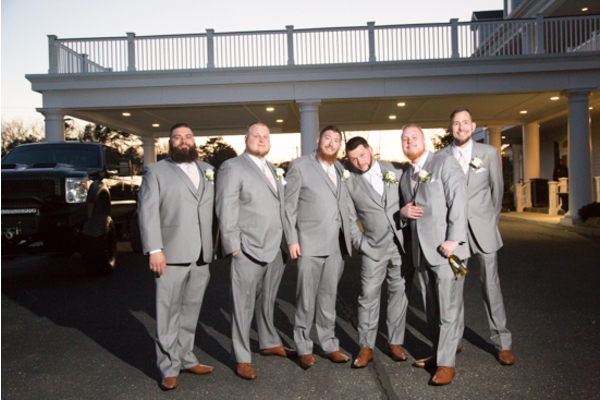 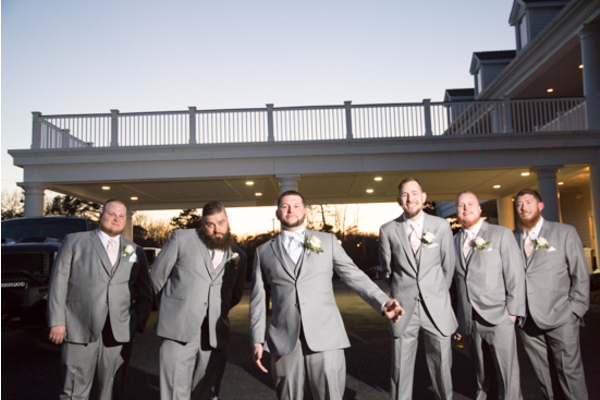 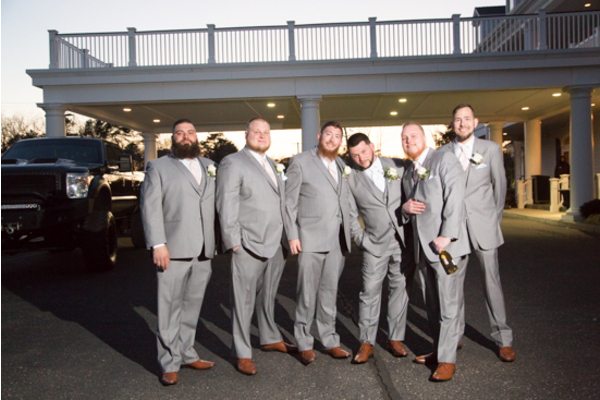 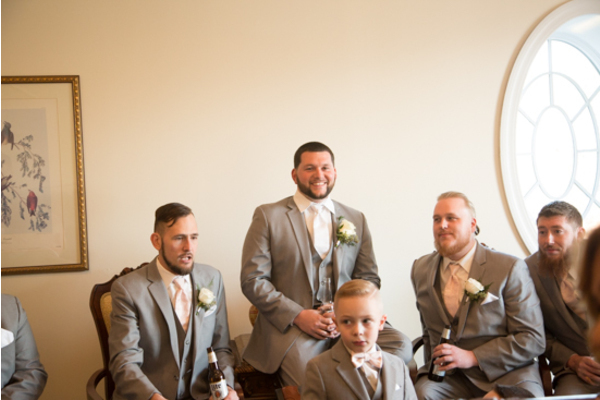 Meanwhile, the groomsmen put on their suits and enjoyed drinks from their themed flasks. 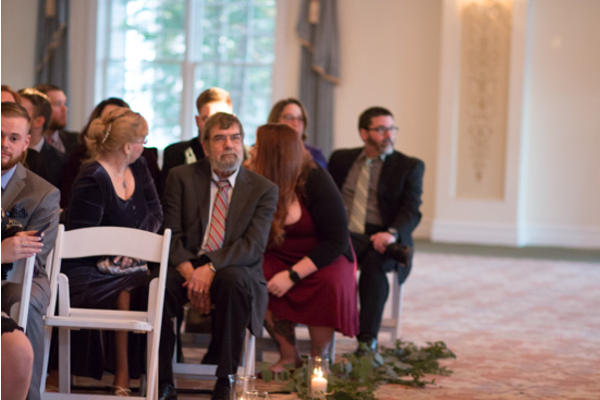 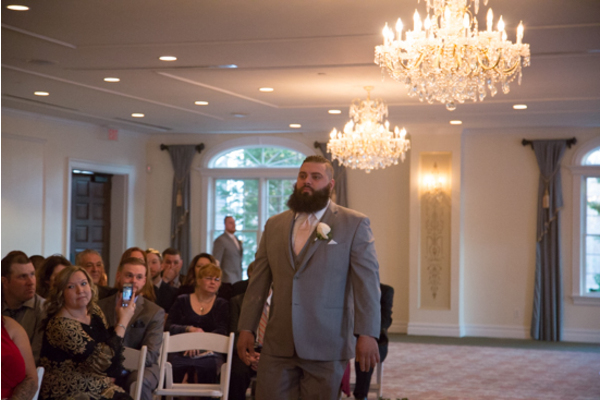 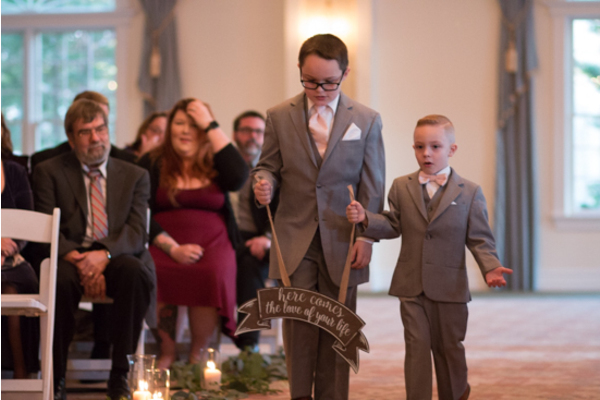 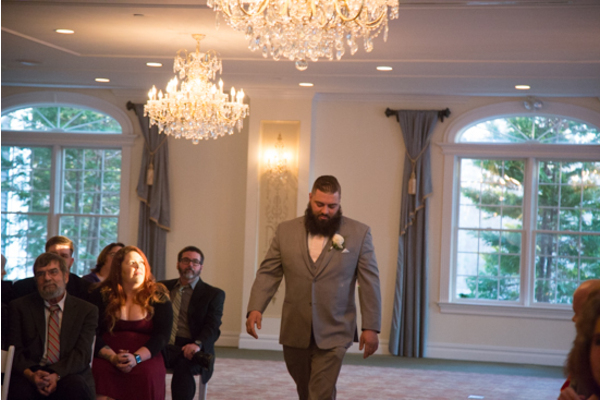 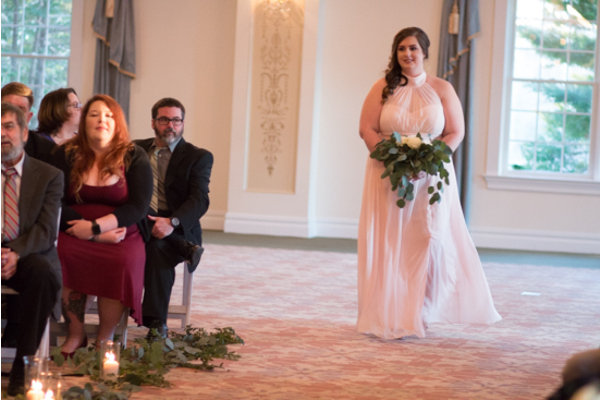 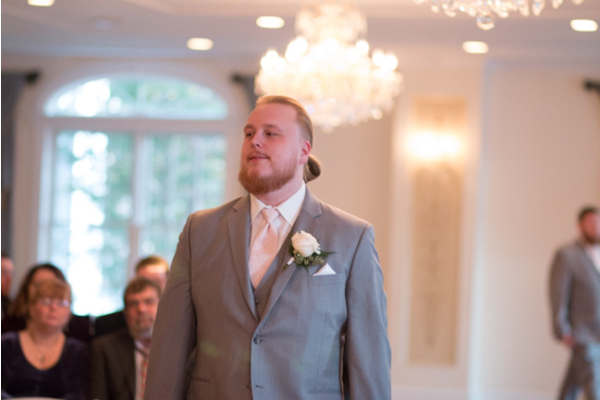 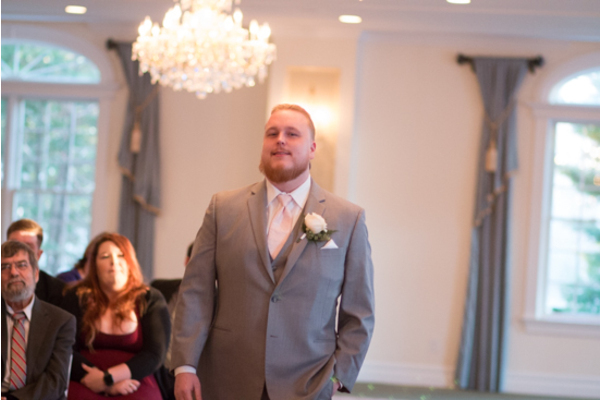 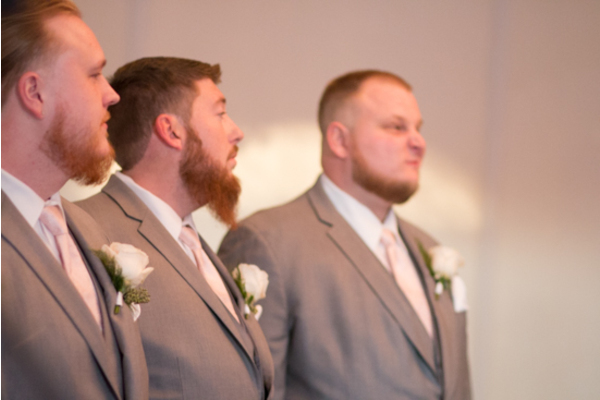 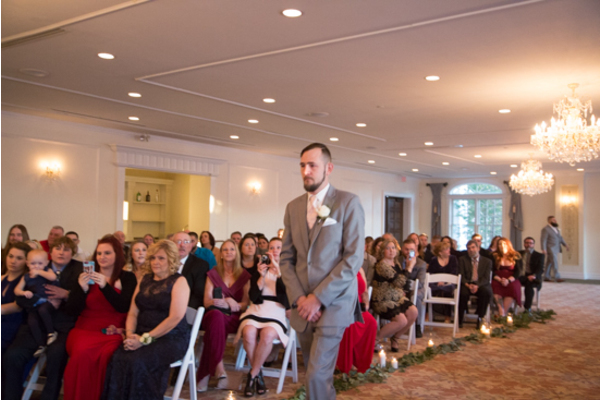 Next up, it was ceremony time! 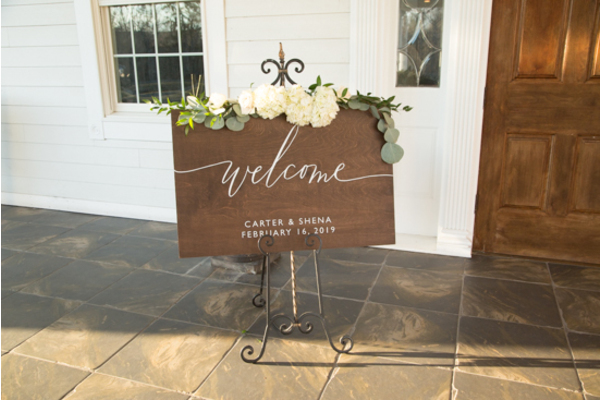 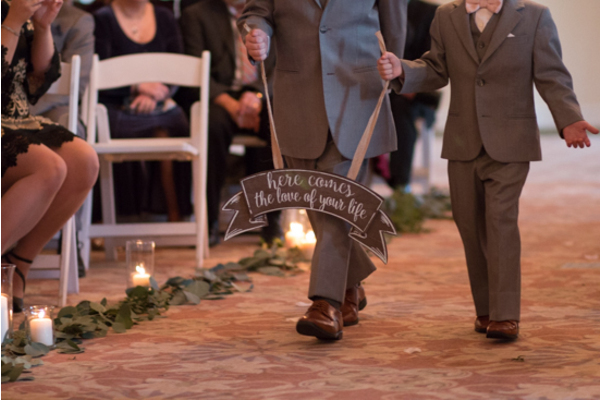 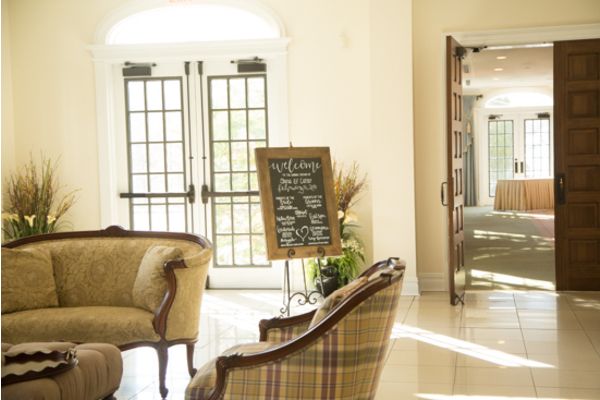 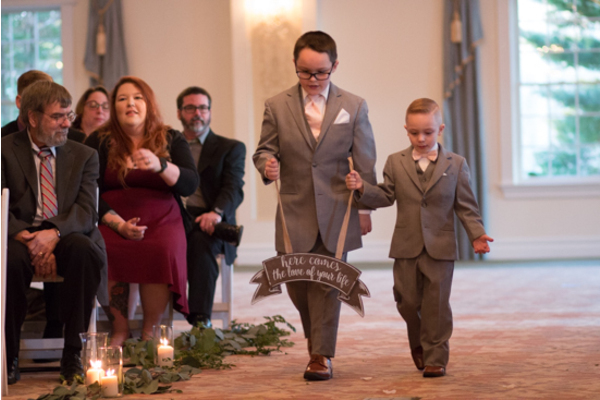 Happy guests were led in by a rustic “Welcome” sign and beautiful white chairs. 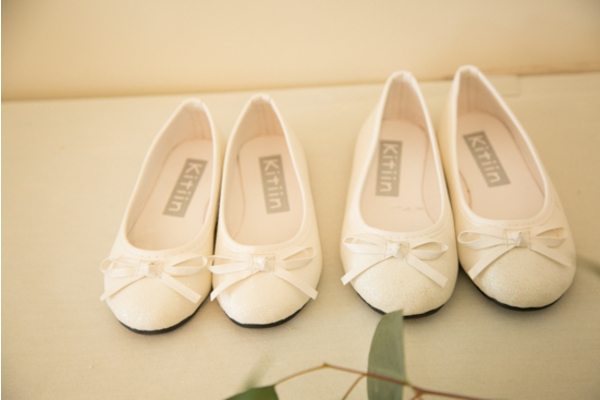 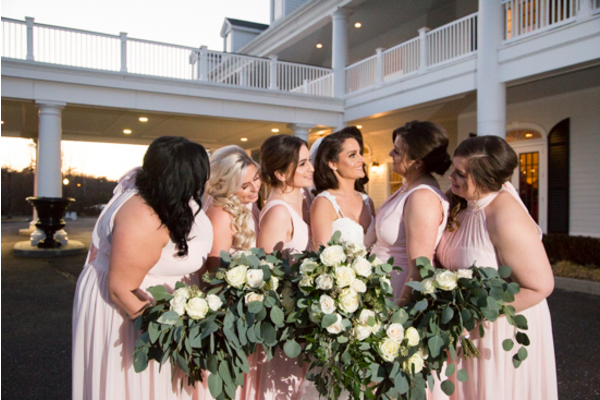 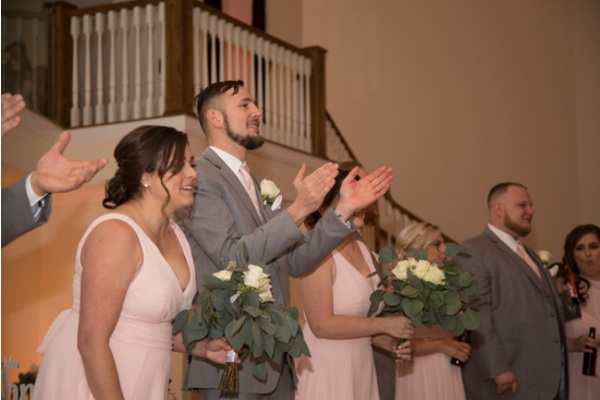 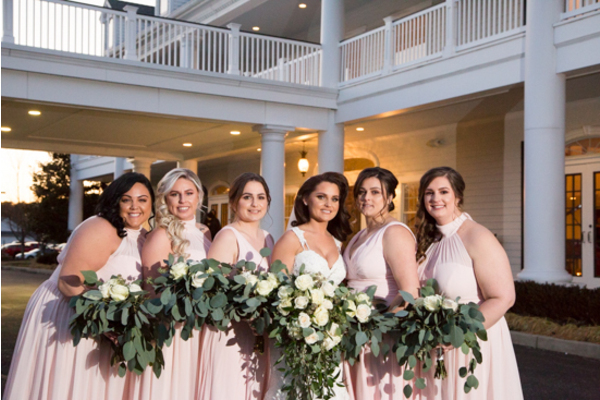 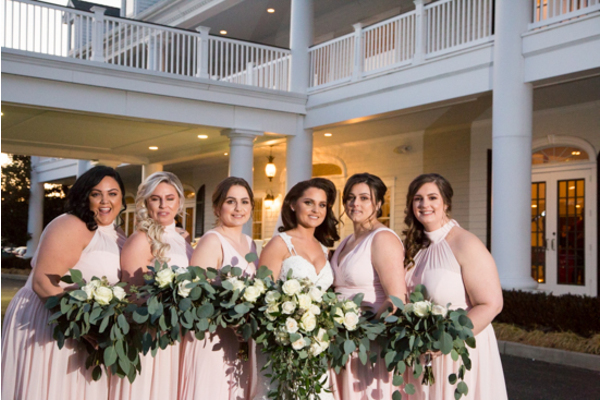 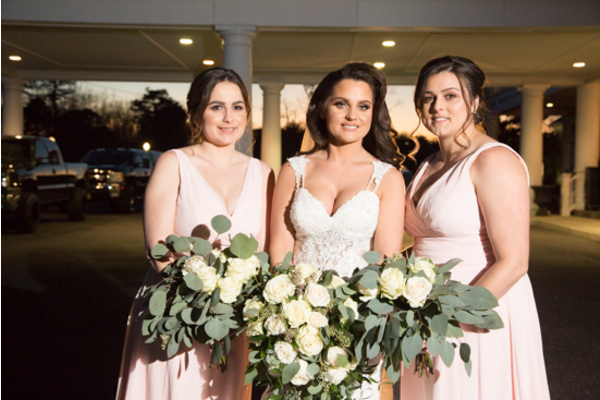 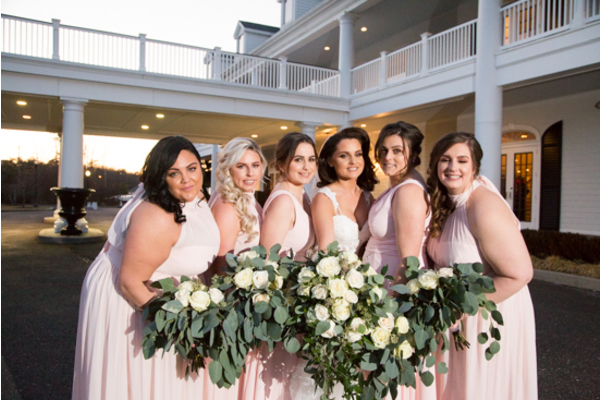 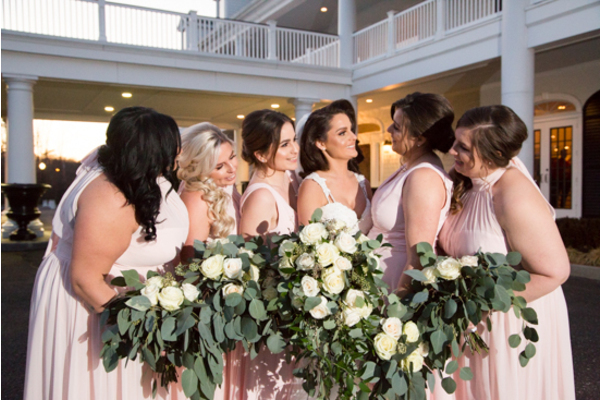 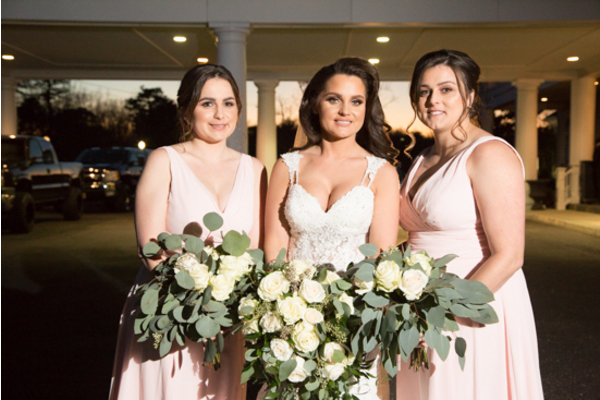 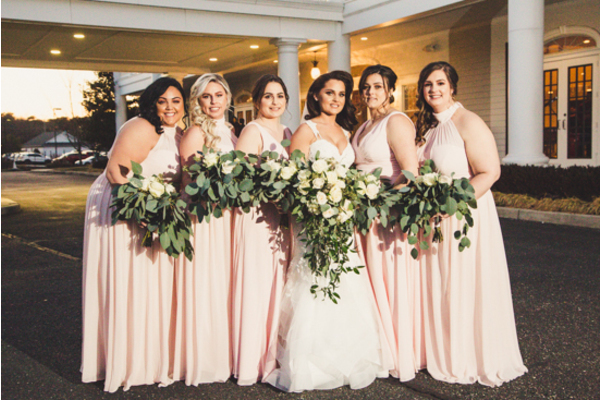 Up at the alter, the bridesmaids were holding their gorgeous ivory flowers and wearing a pale pink color. 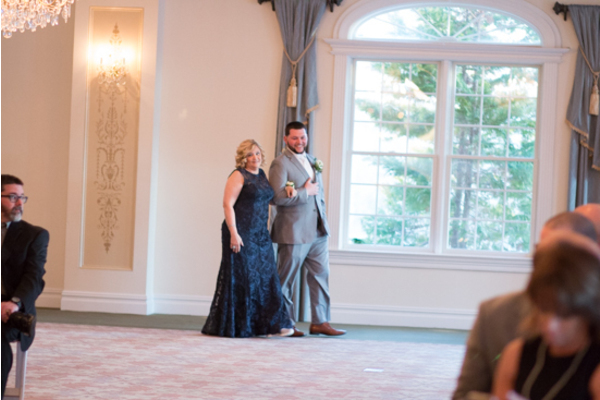 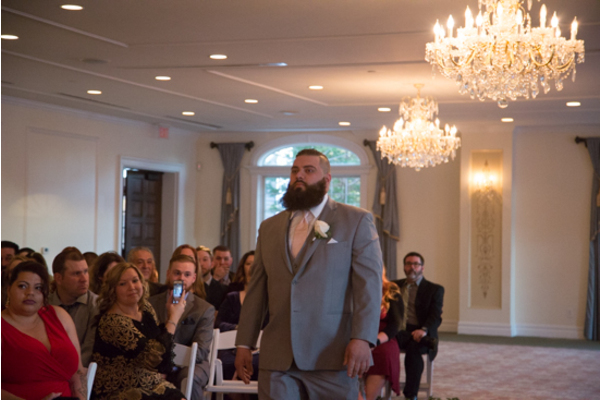 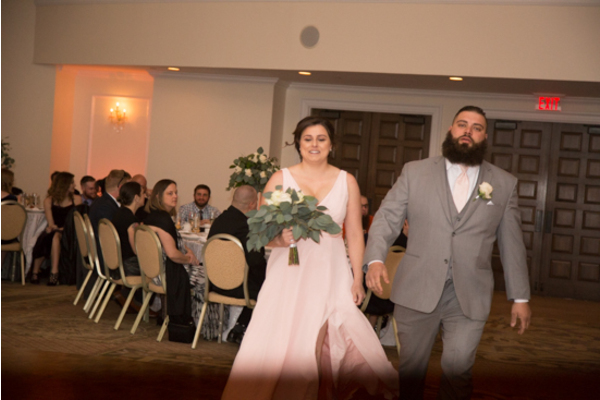 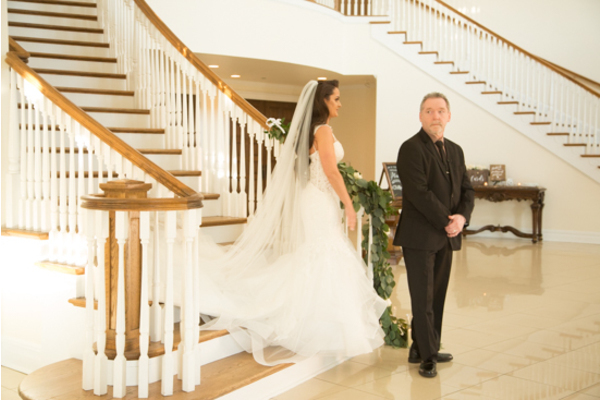 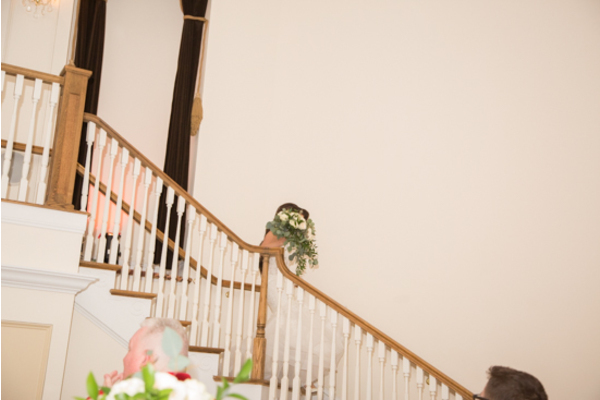 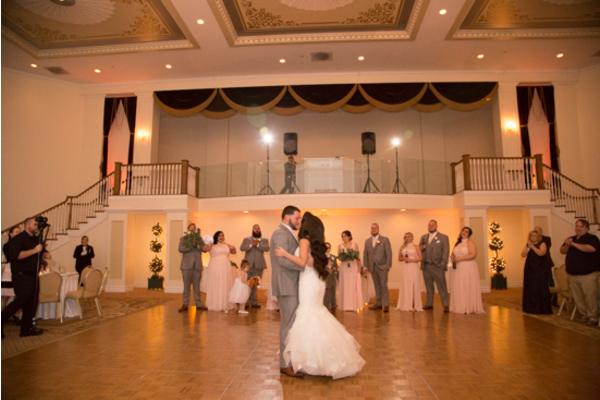 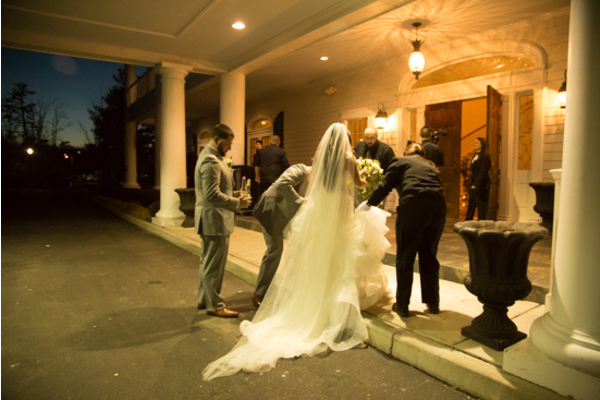 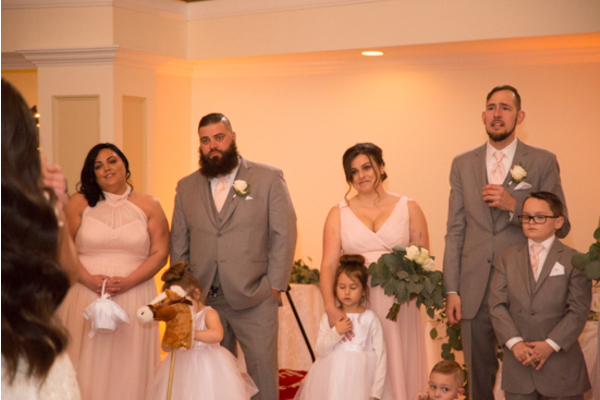 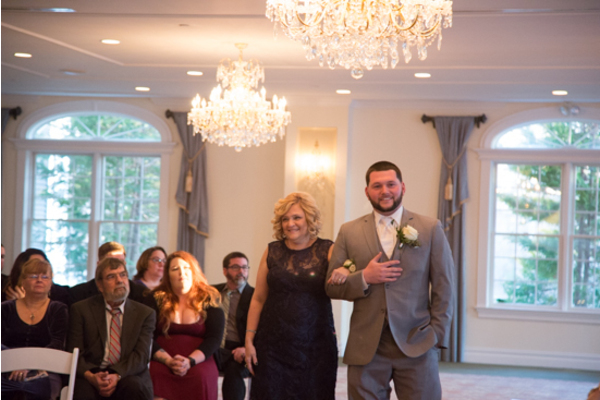 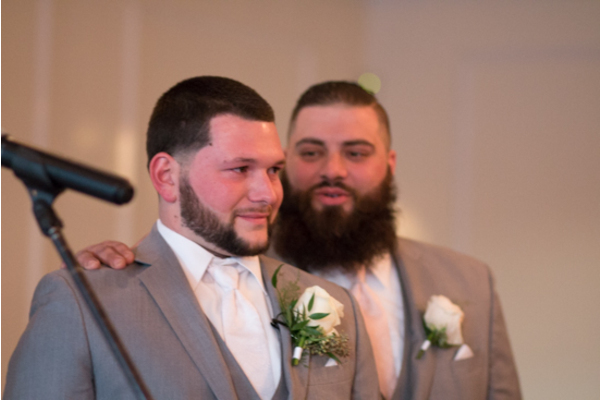 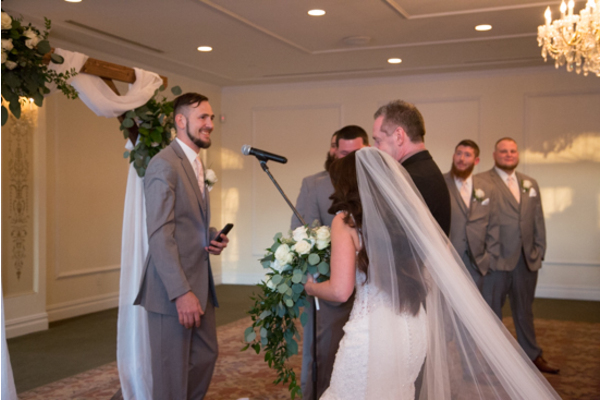 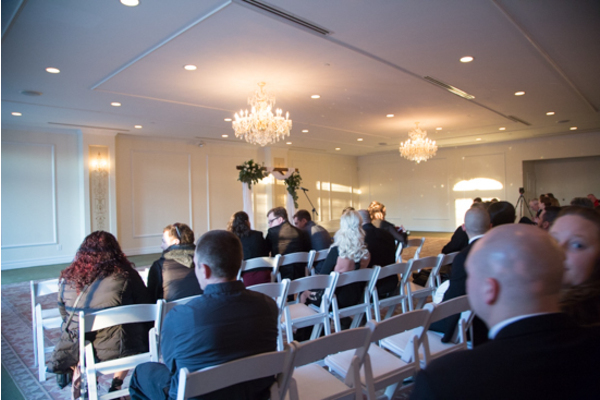 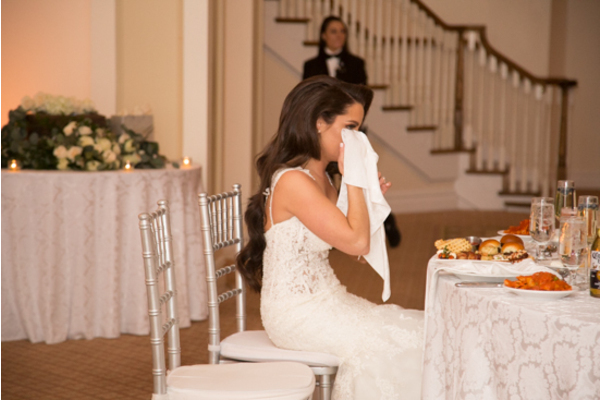 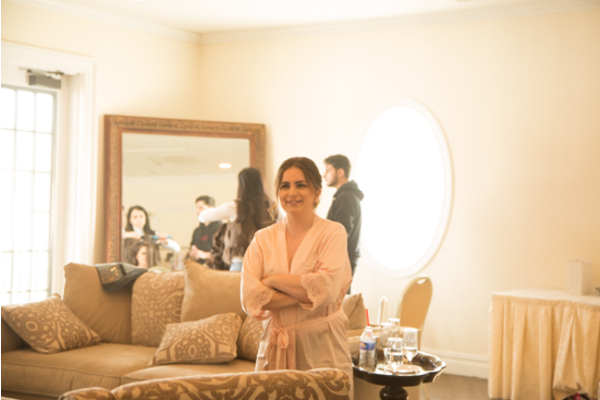 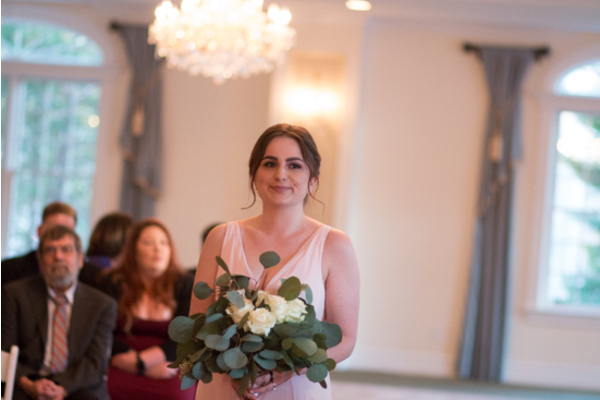 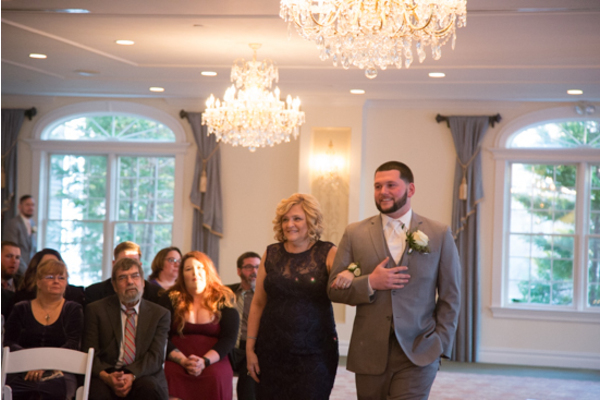 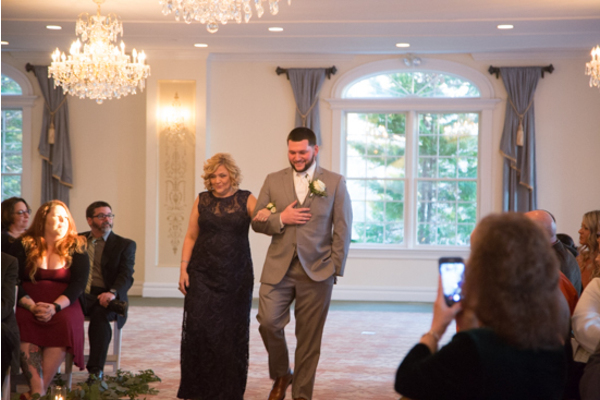 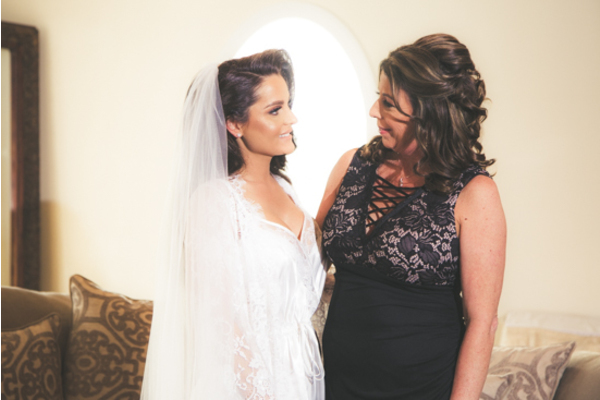 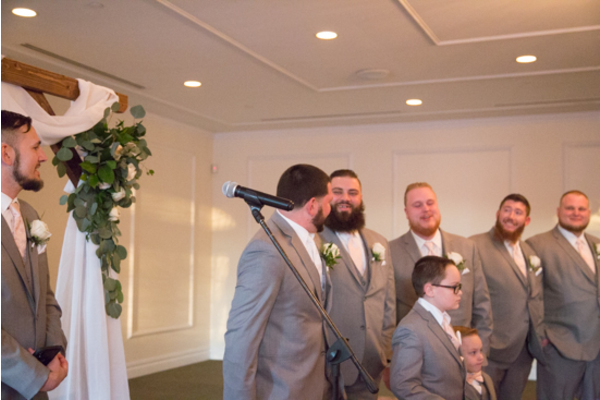 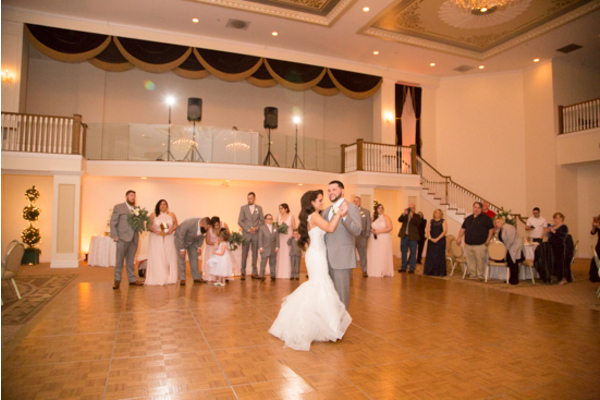 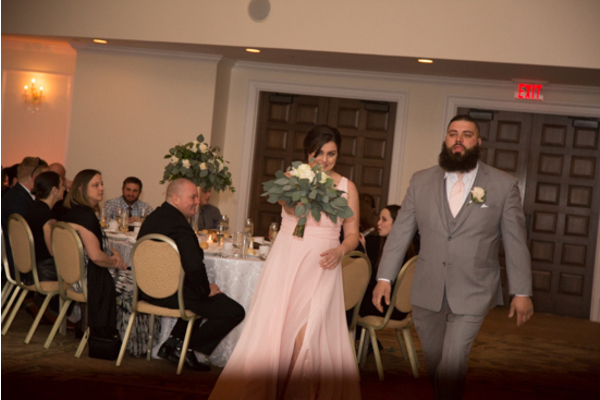 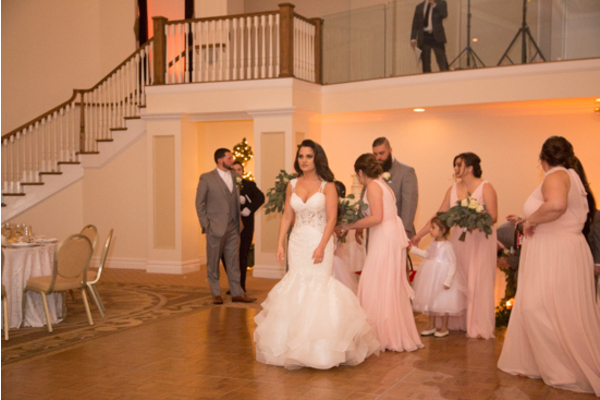 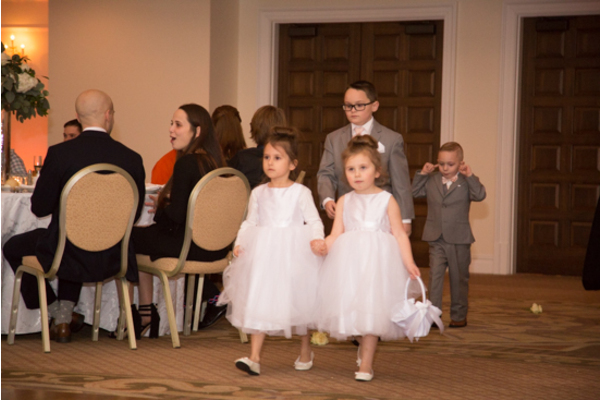 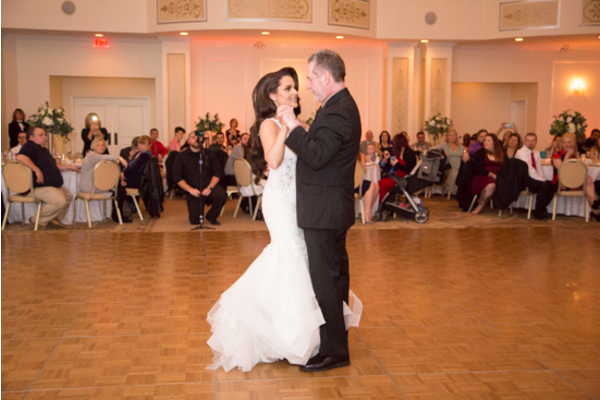 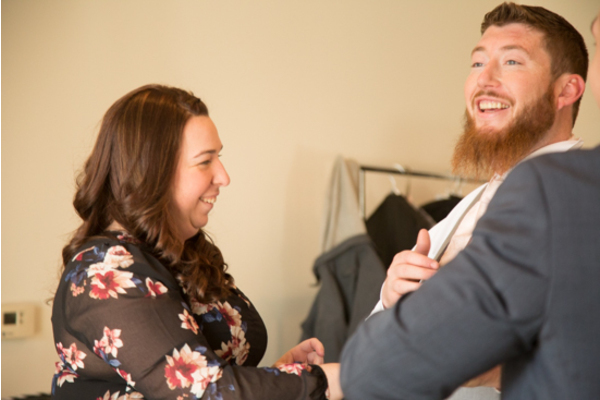 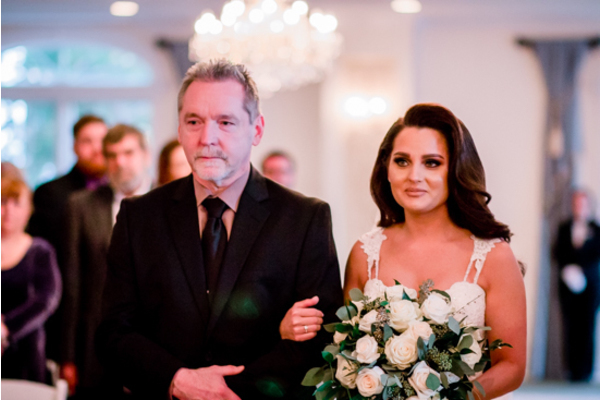 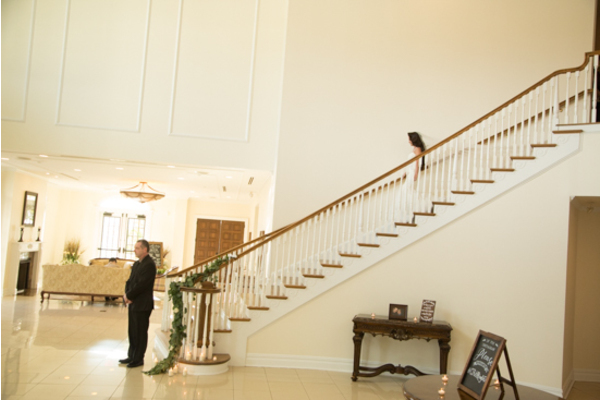 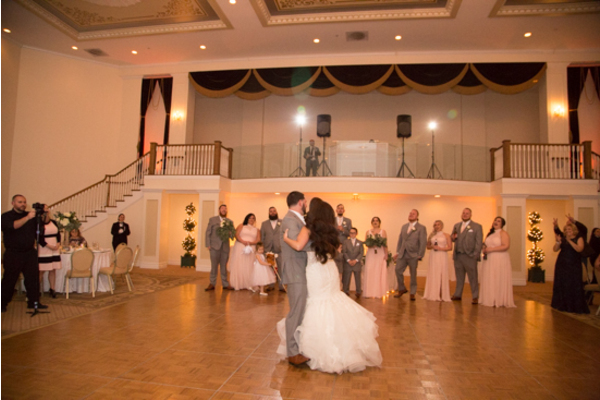 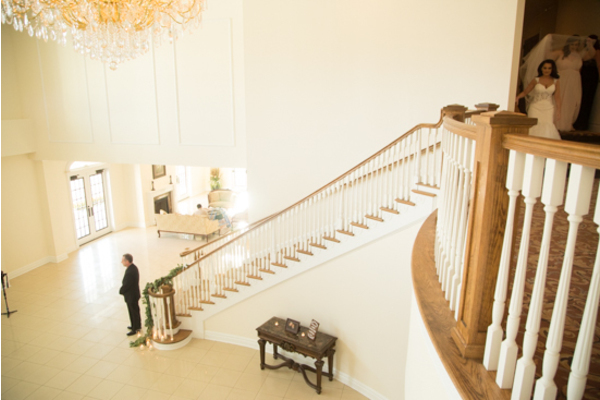 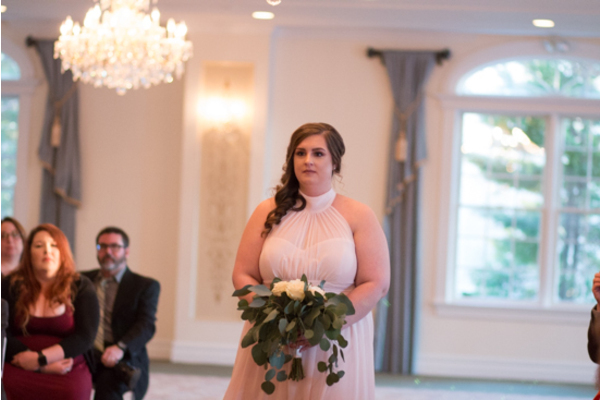 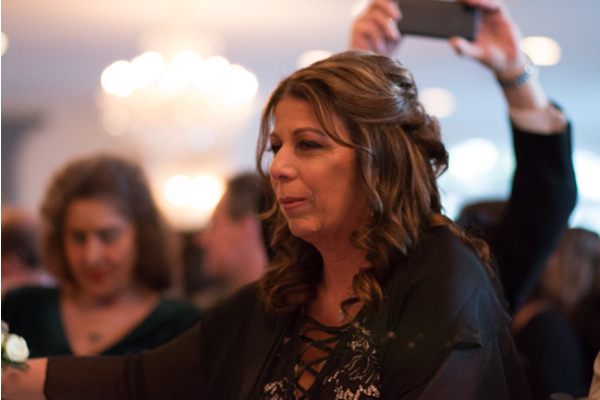 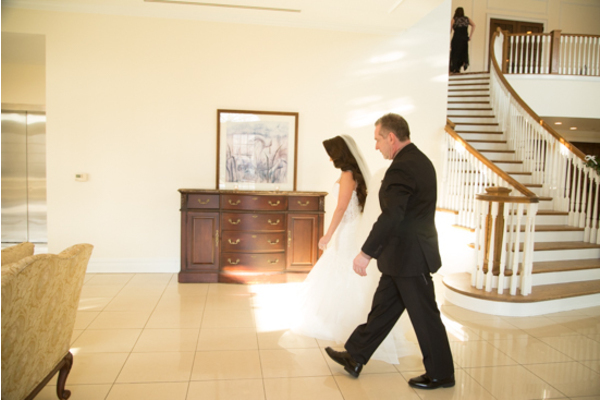 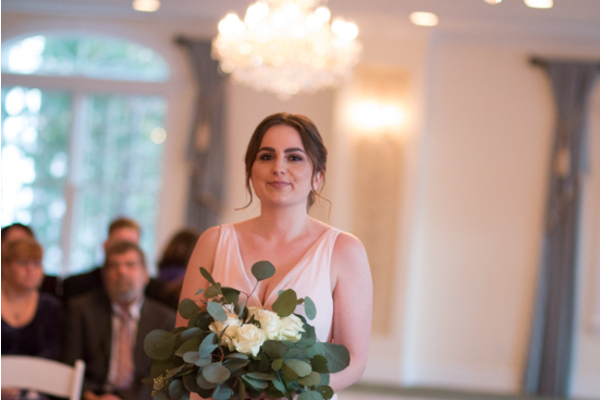 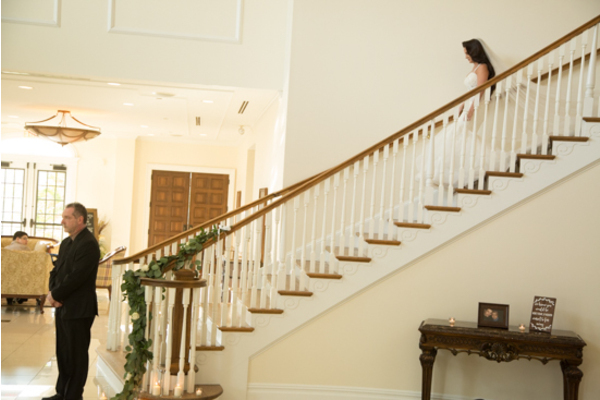 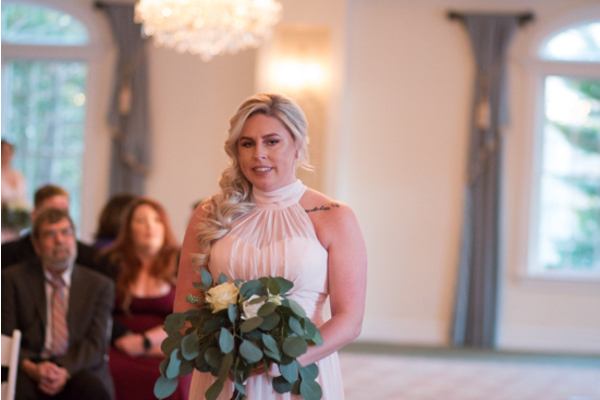 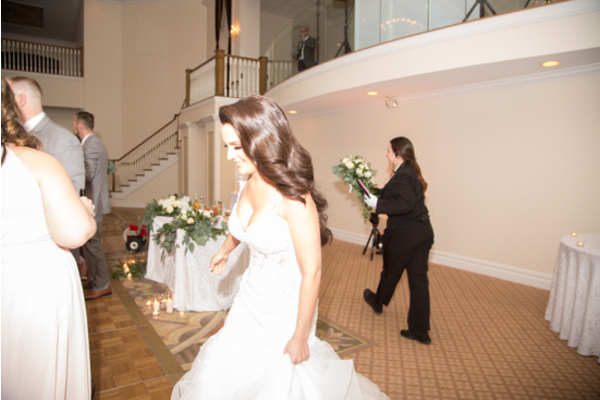 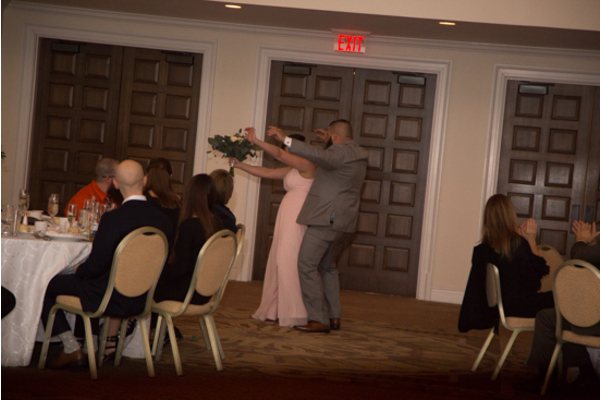 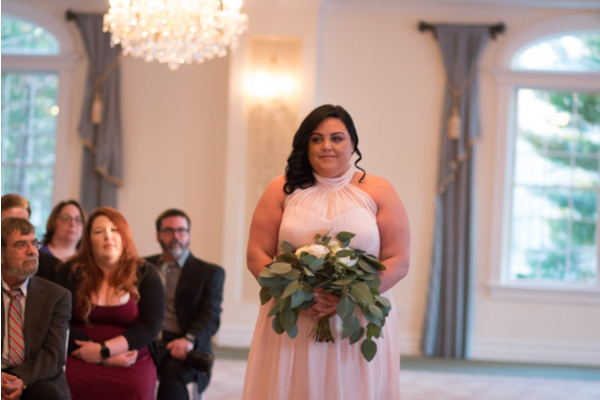 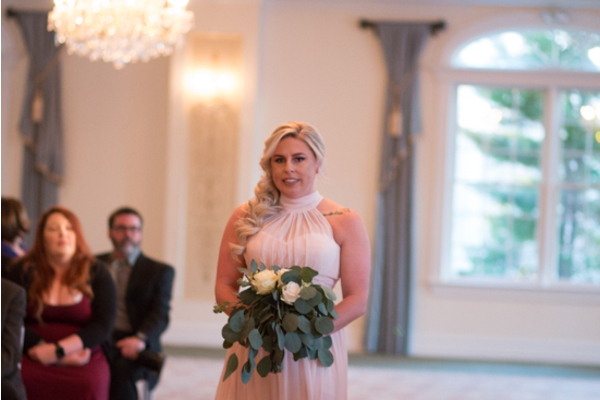 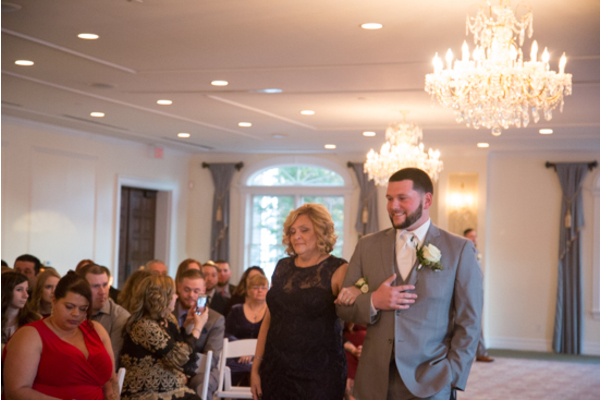 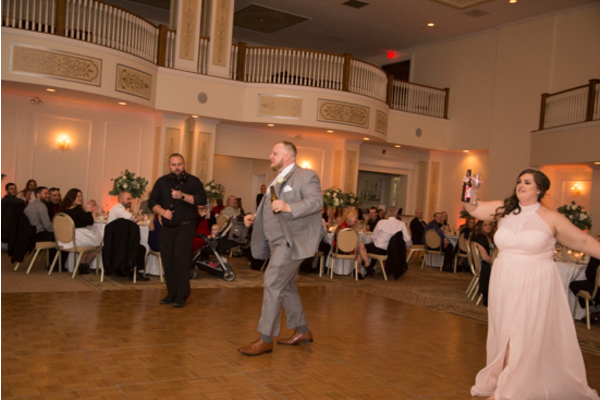 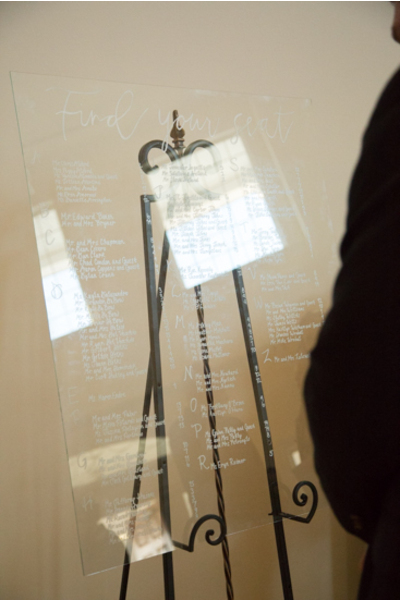 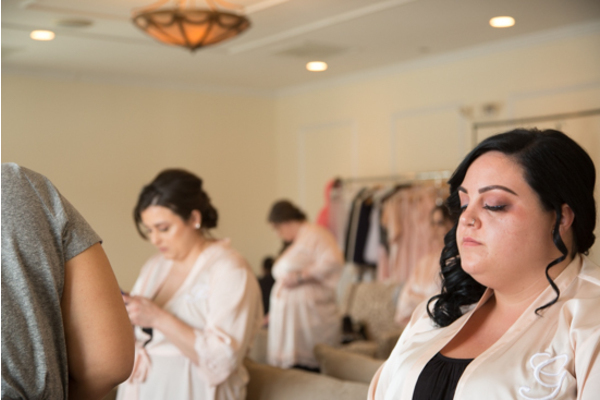 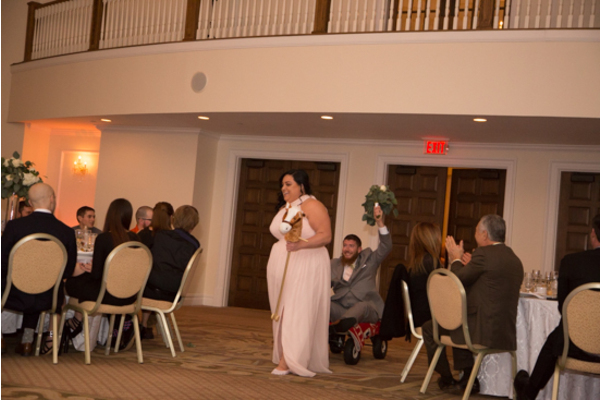 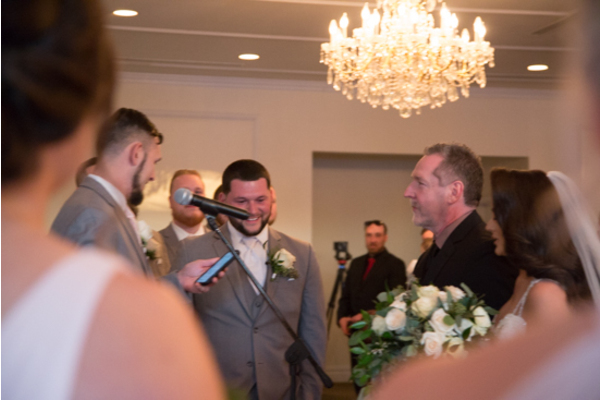 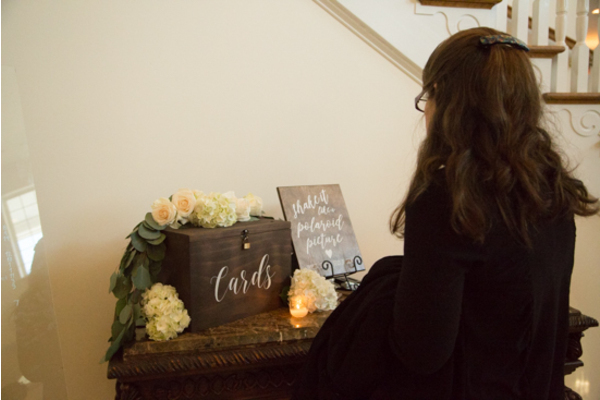 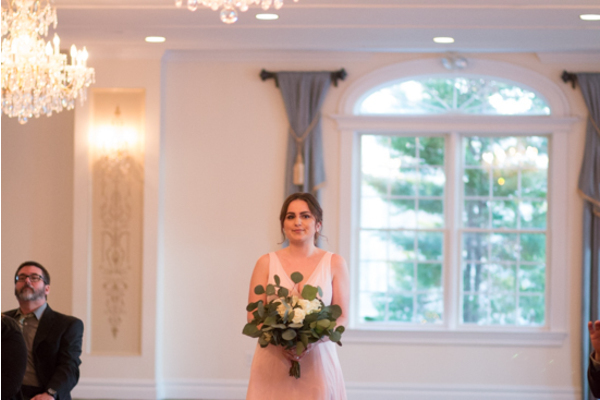 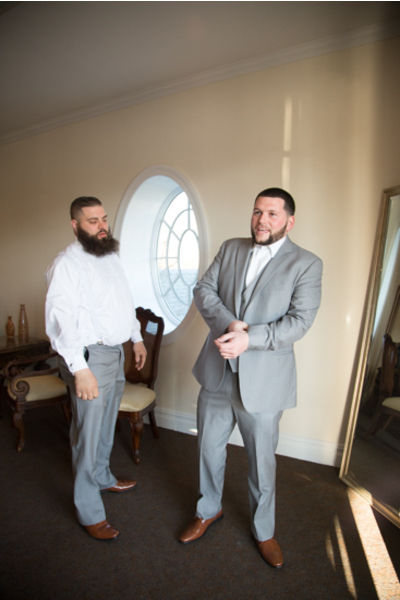 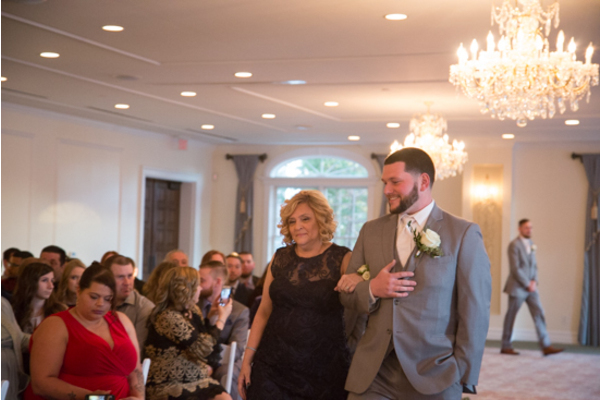 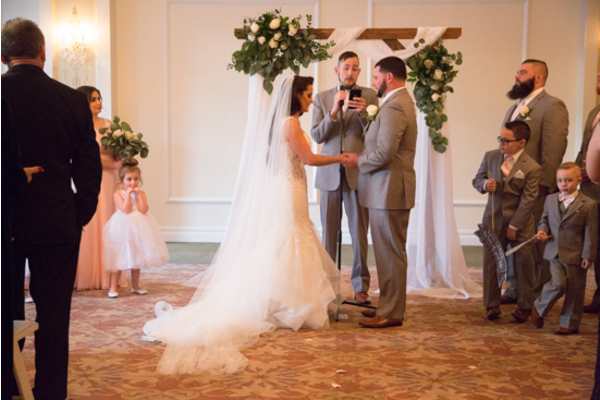 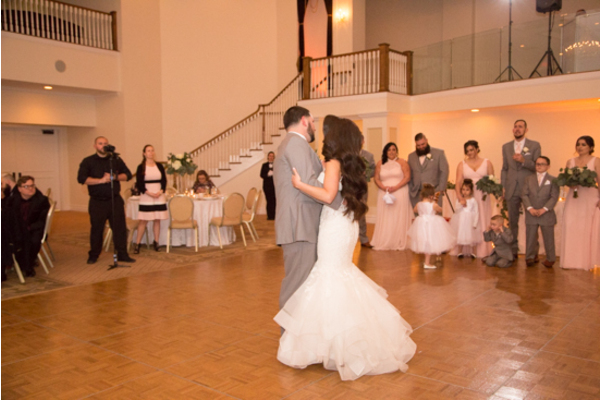 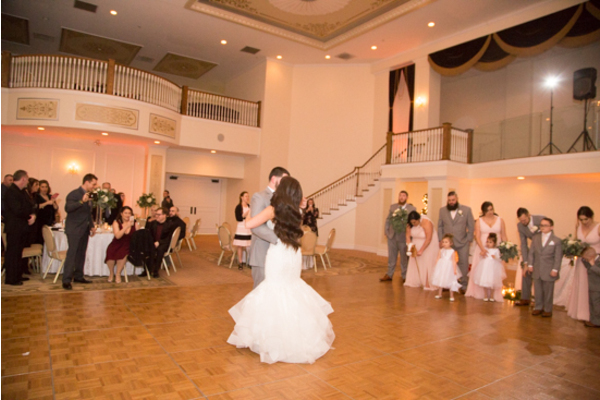 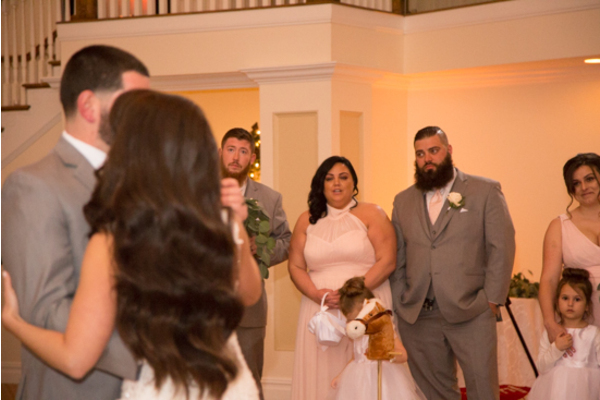 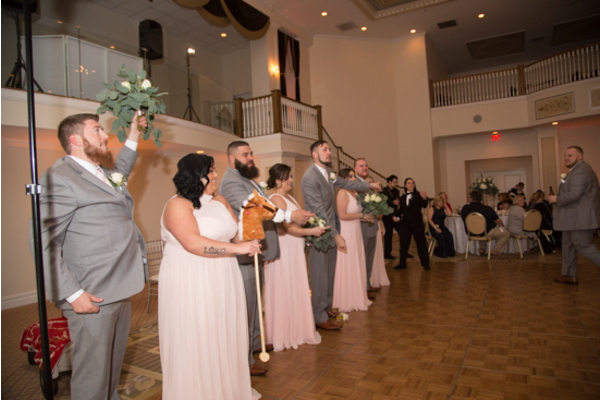 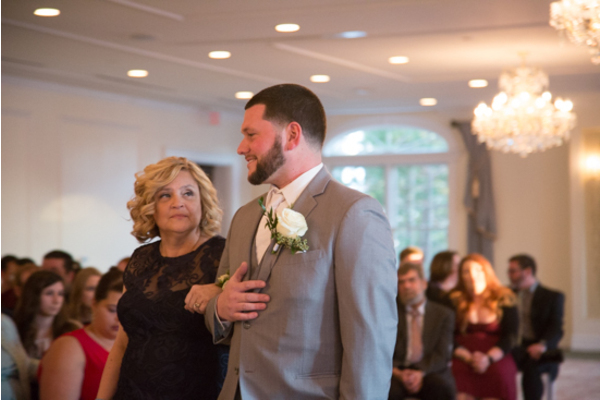 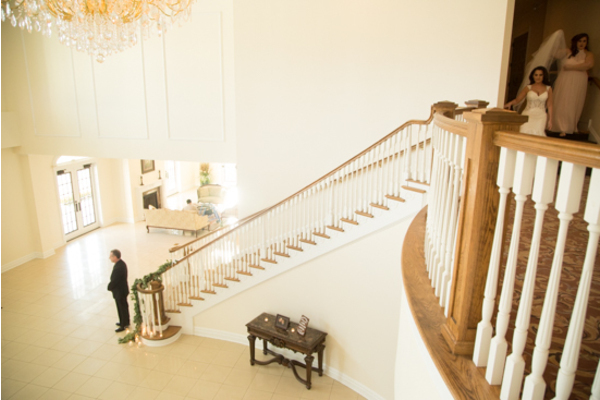 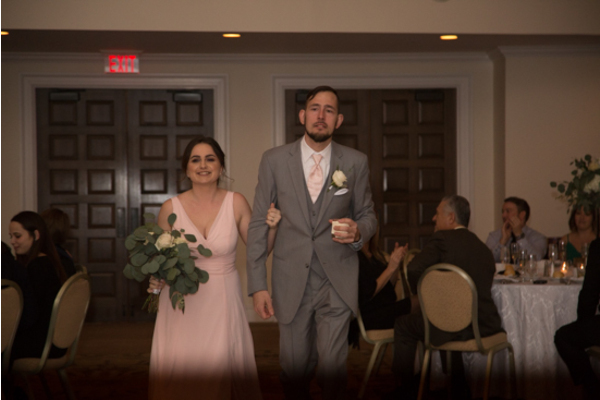 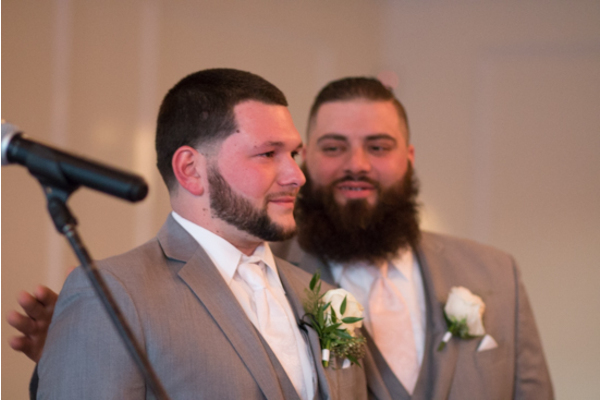 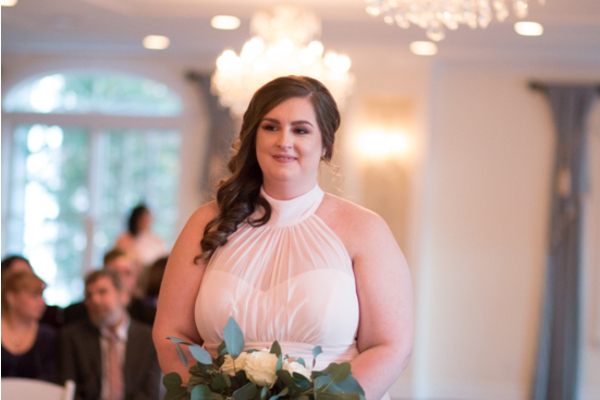 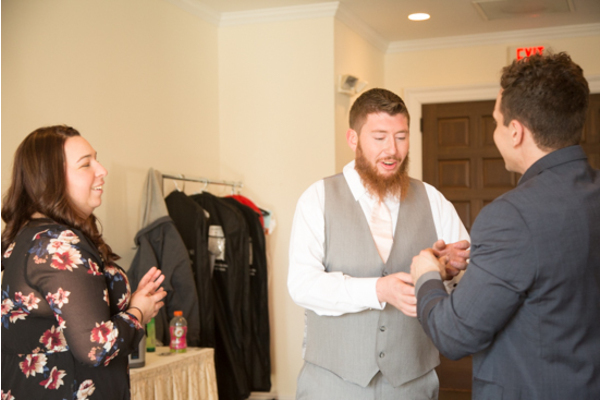 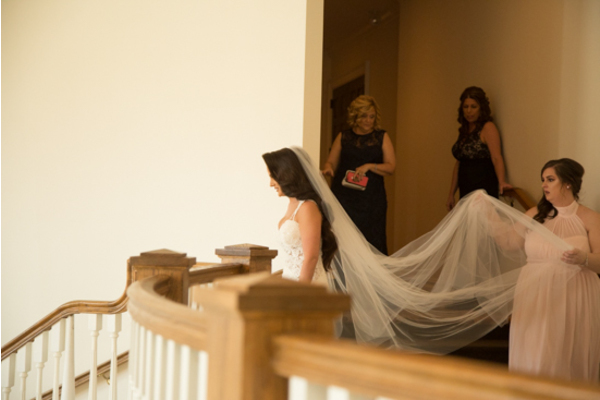 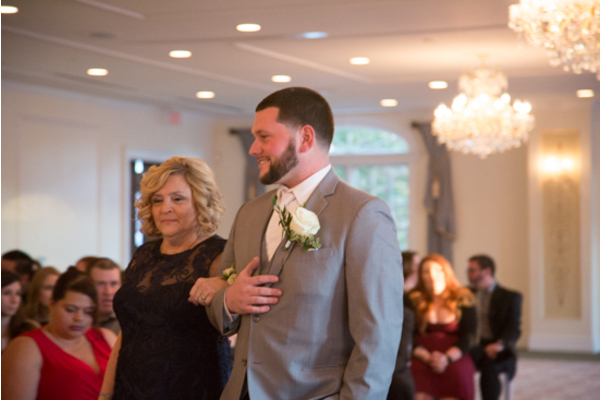 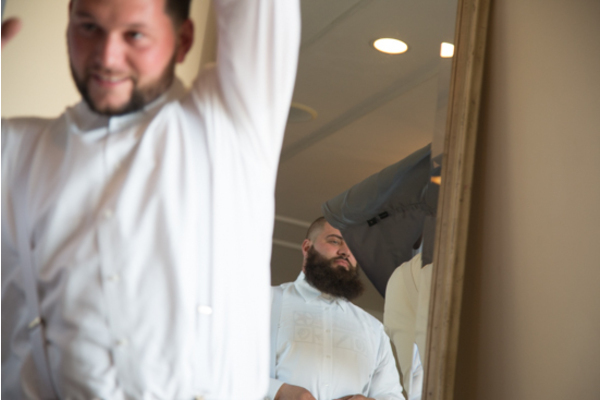 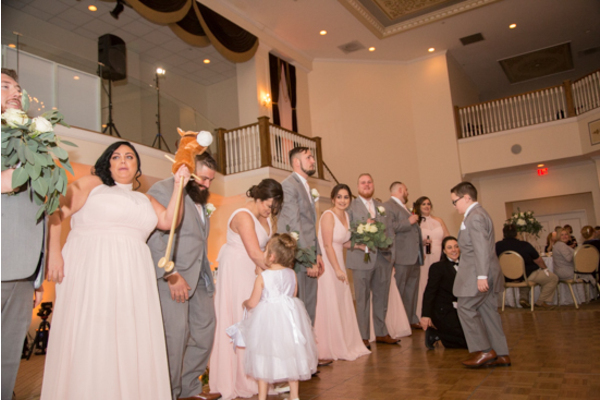 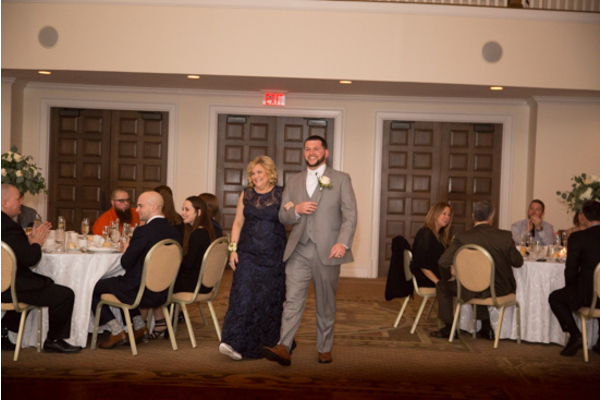 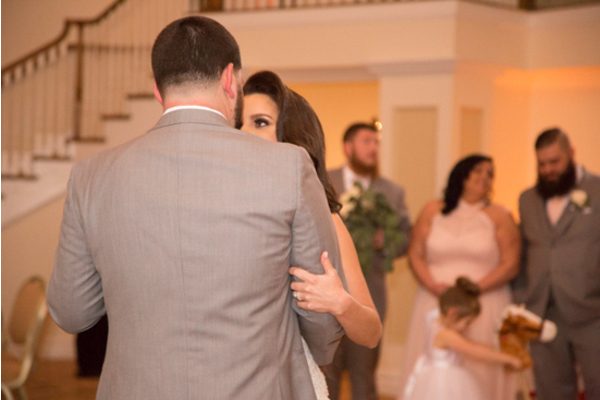 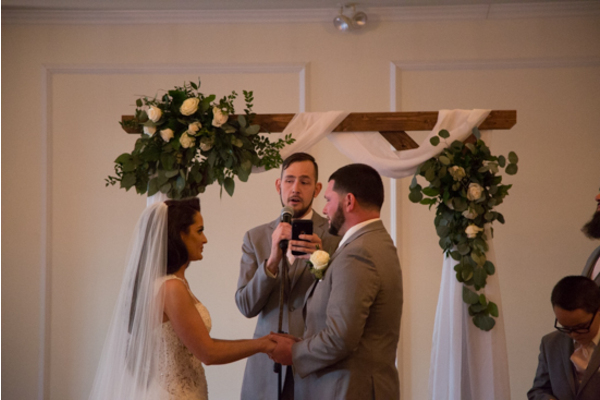 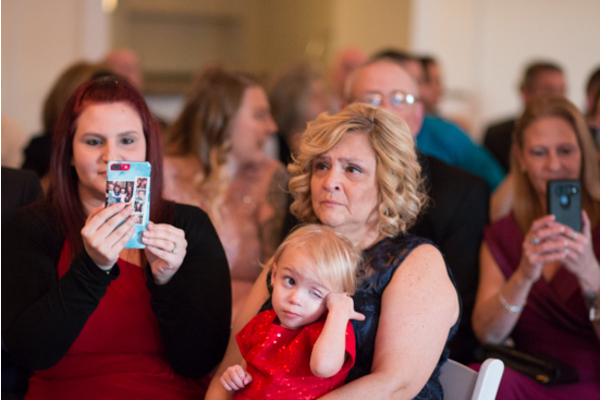 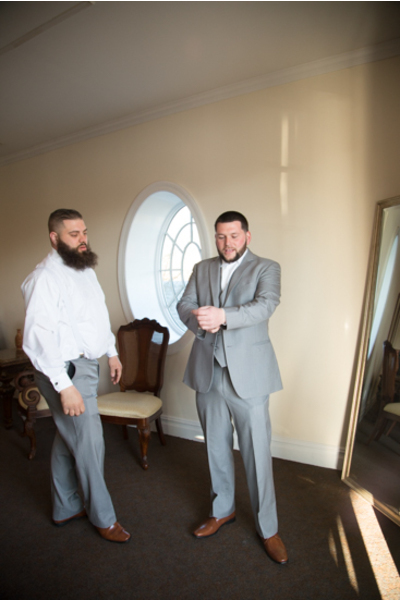 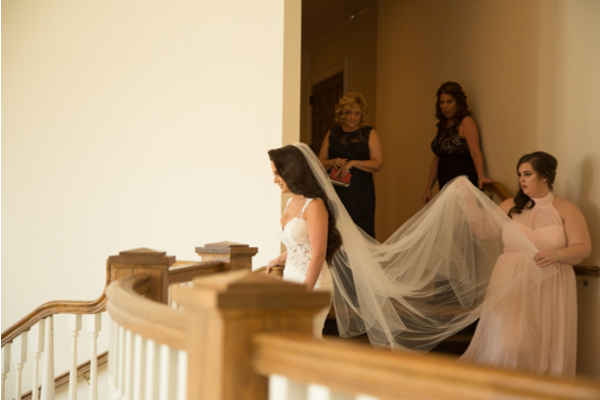 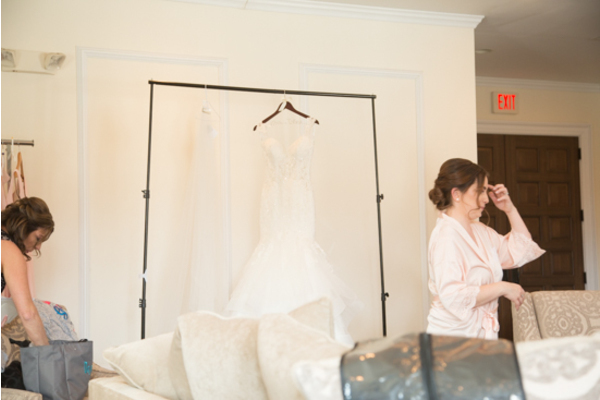 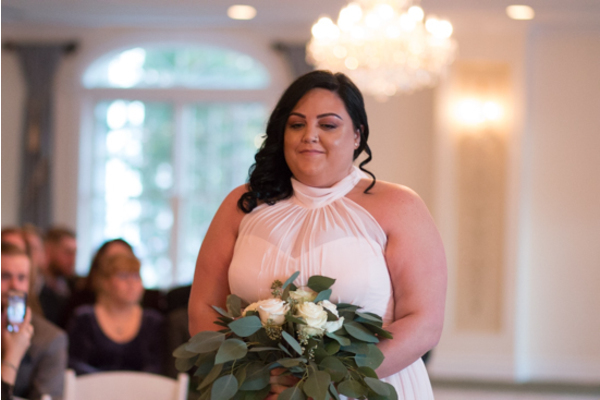 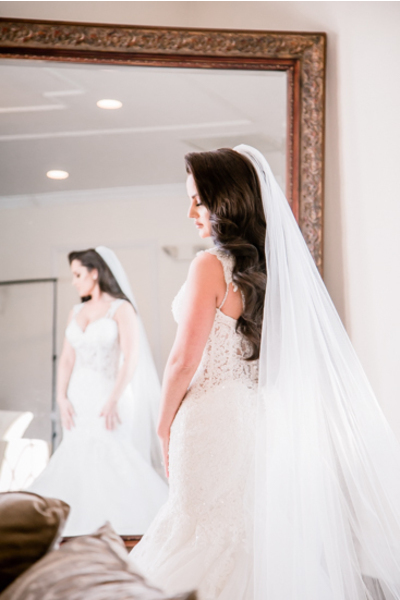 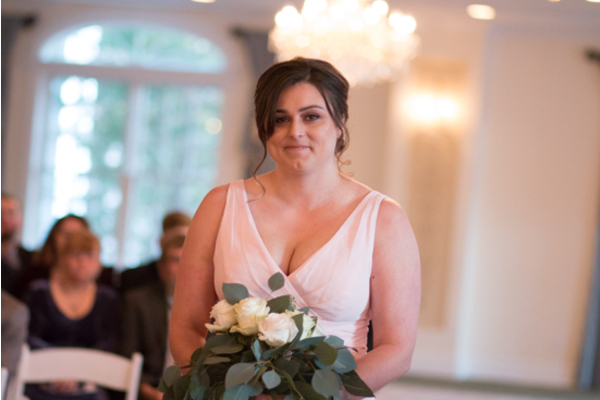 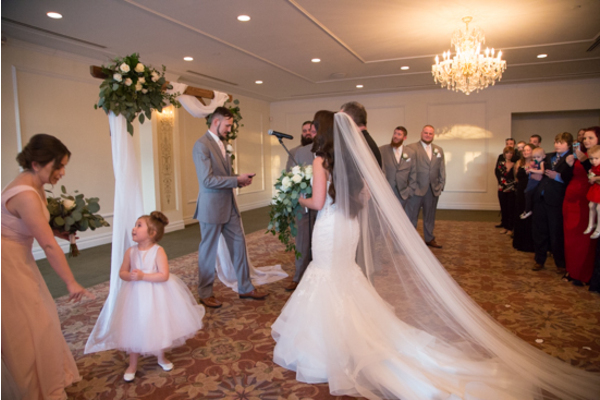 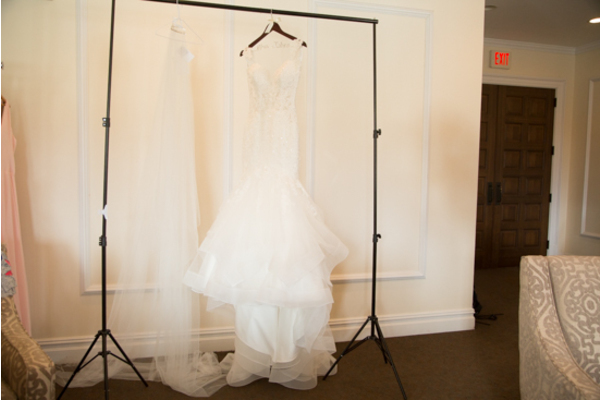 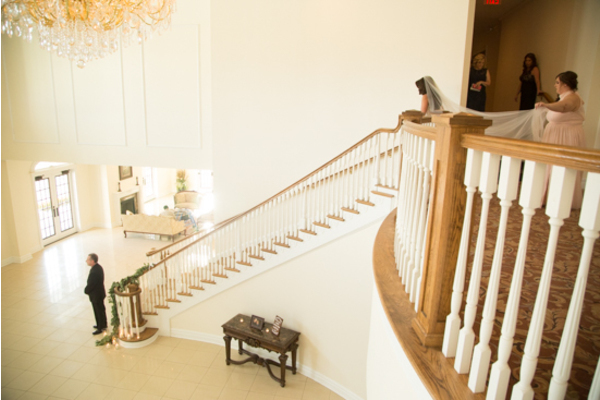 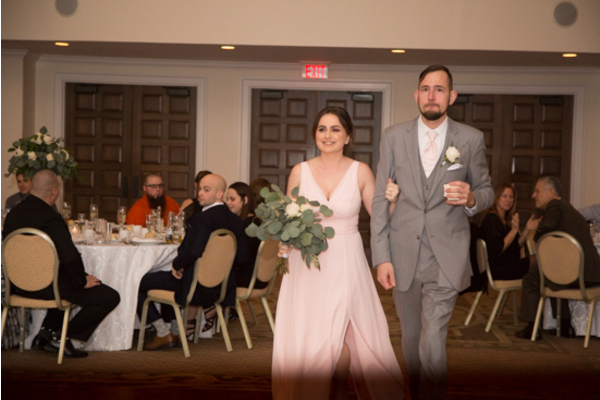 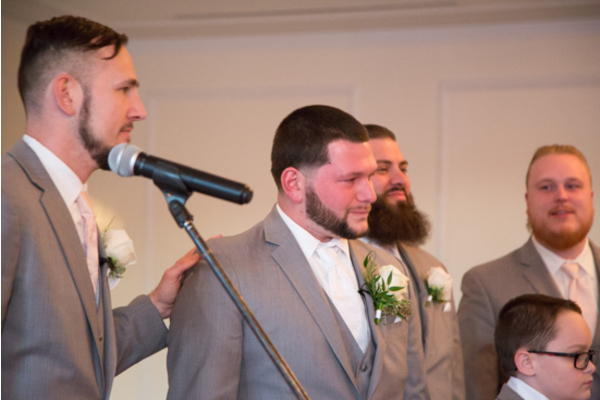 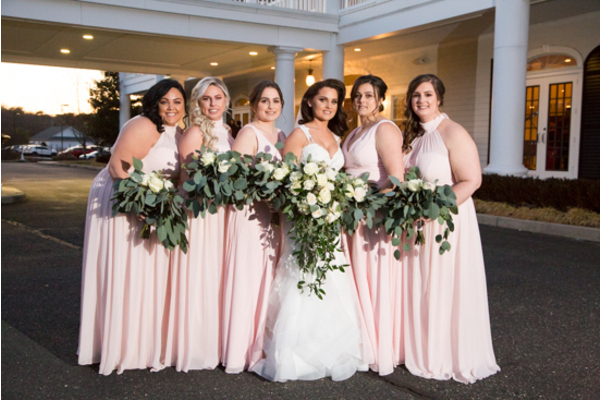 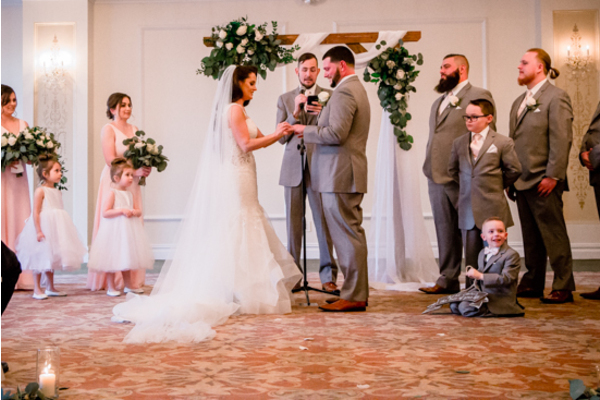 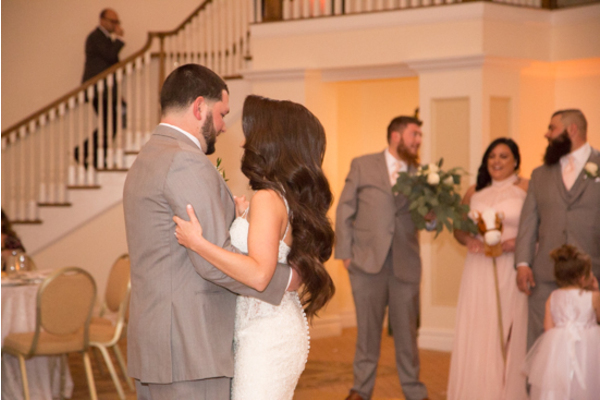 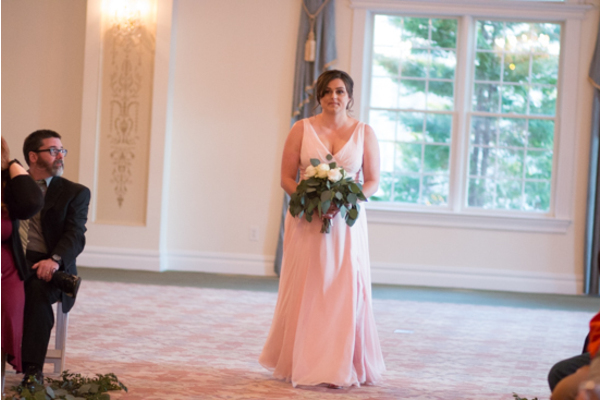 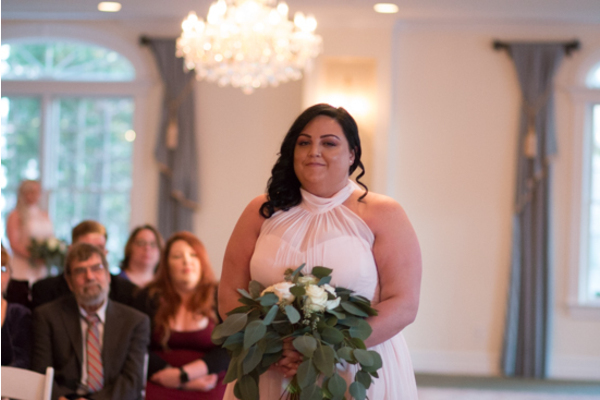 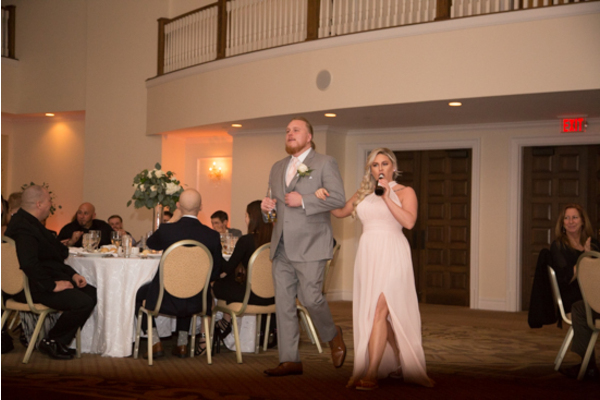 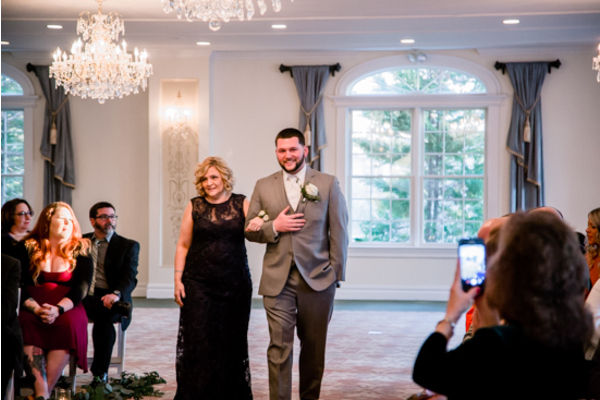 Behind the scenes of it all, our NJ Wedding Videographer documented Shena’s walk down the aisle all the way up until their final vows were spoken. 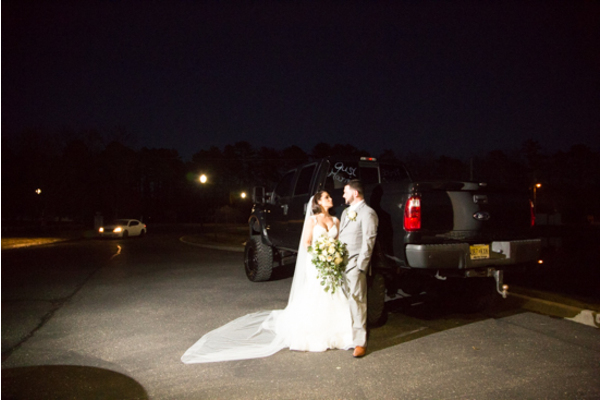 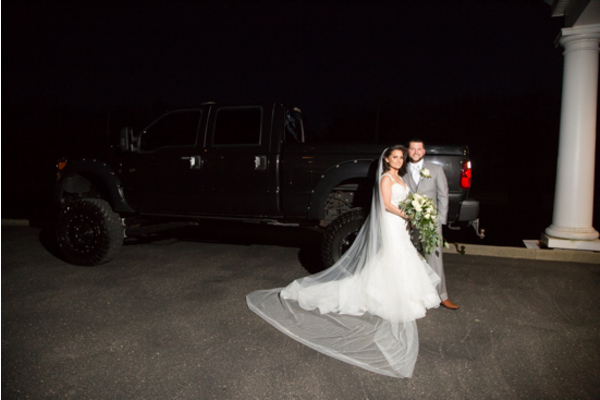 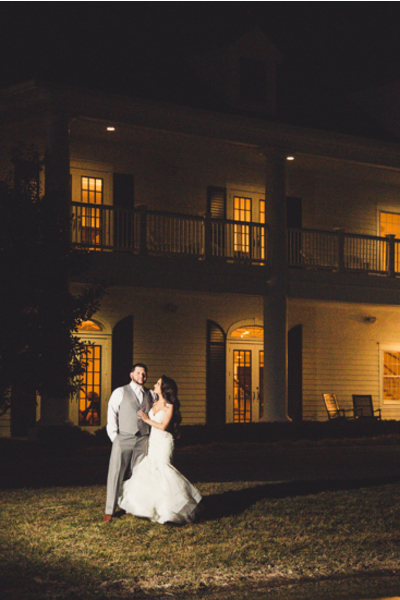 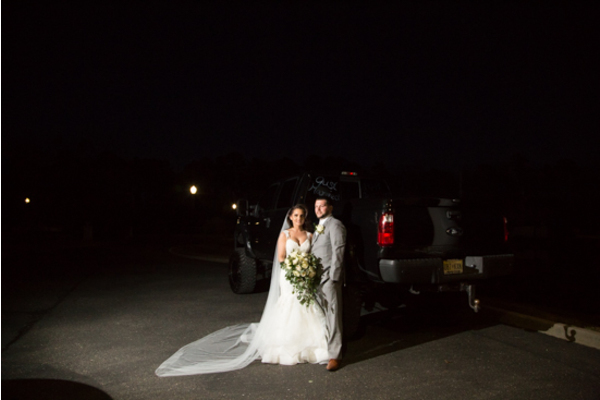 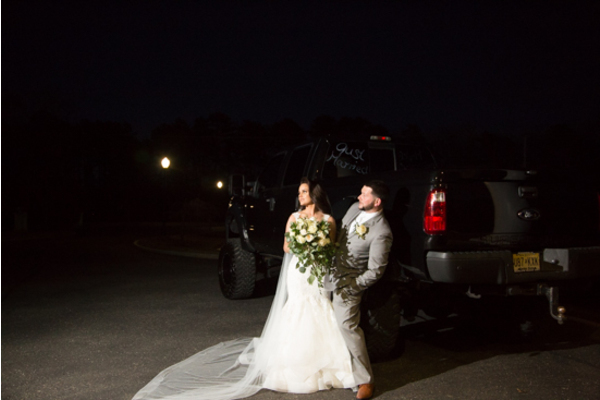 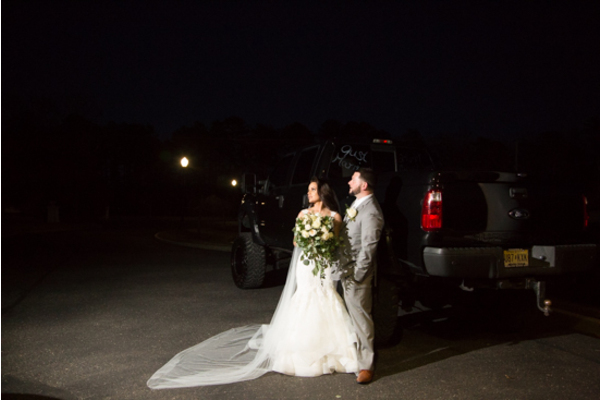 After they were finally married, the newlyweds ventured off for nighttime portraits before the reception! 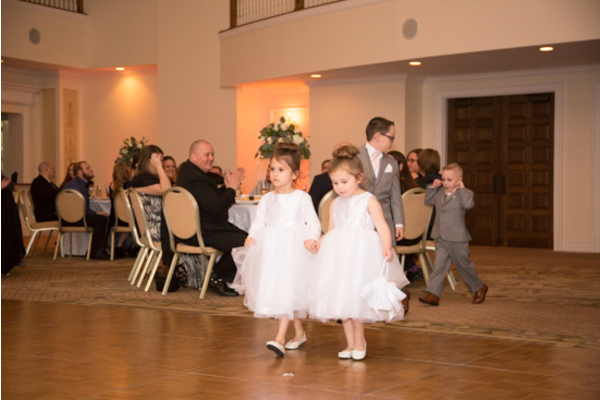 To end the night, Shena and Carter danced and celebrated surrounded by everyone they love! 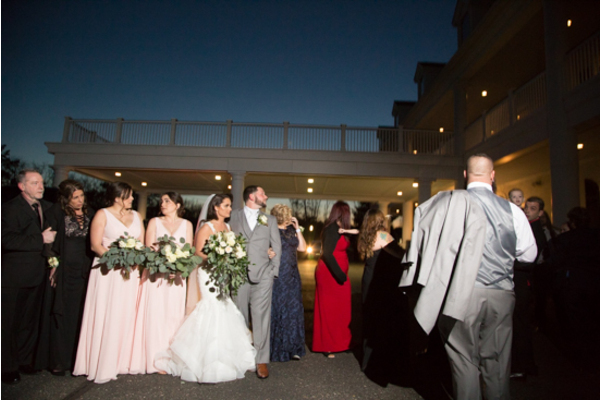 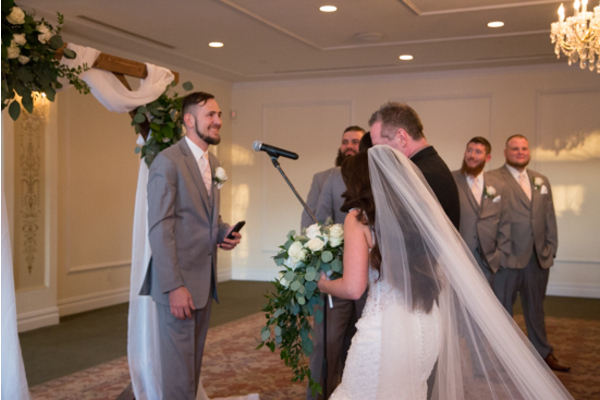 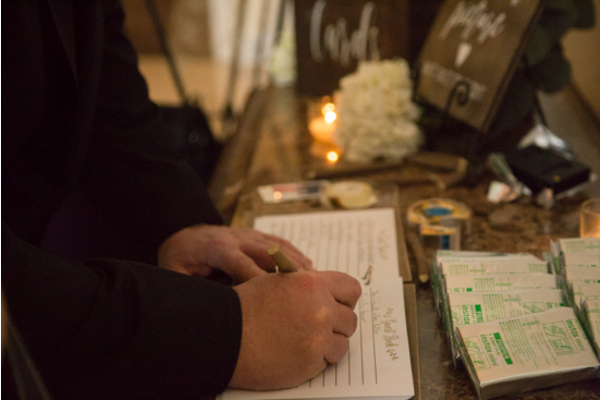 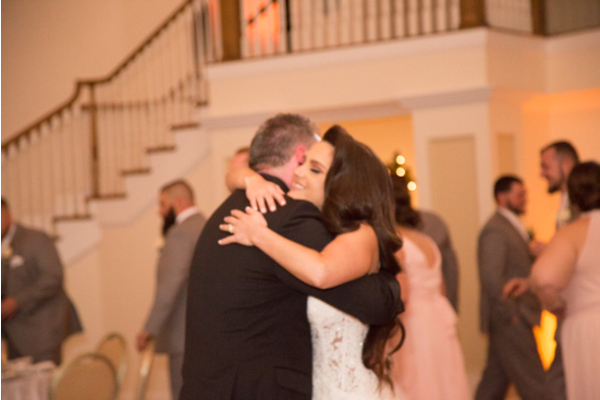 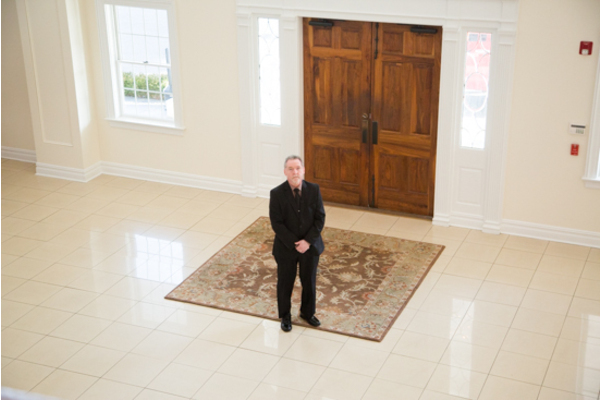 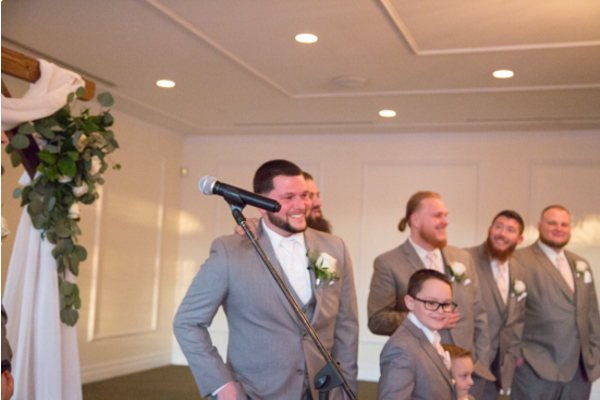 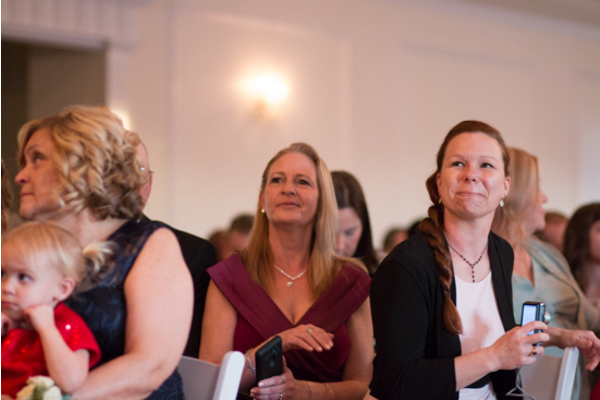 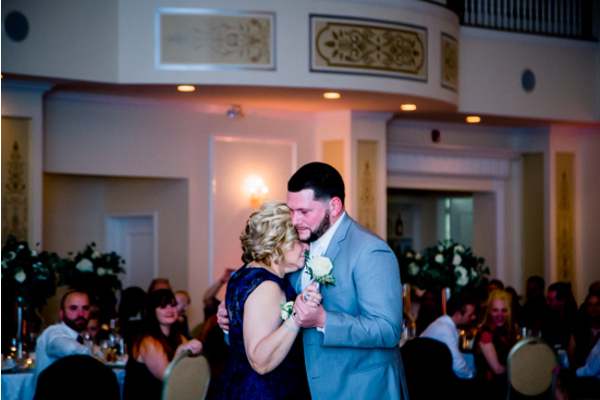 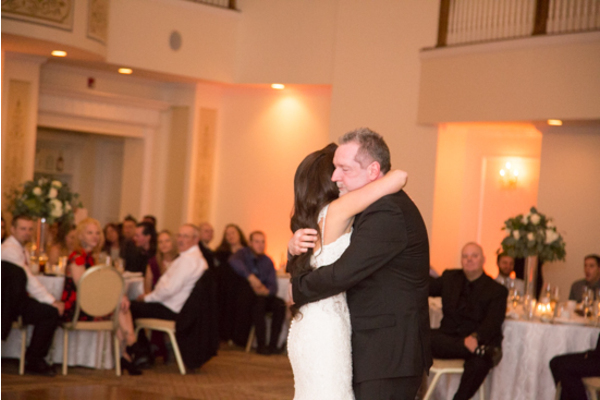 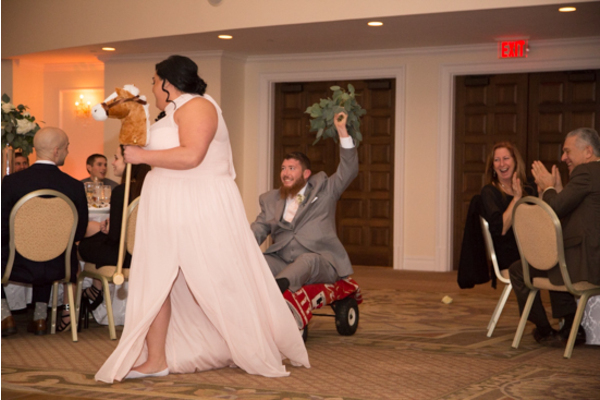 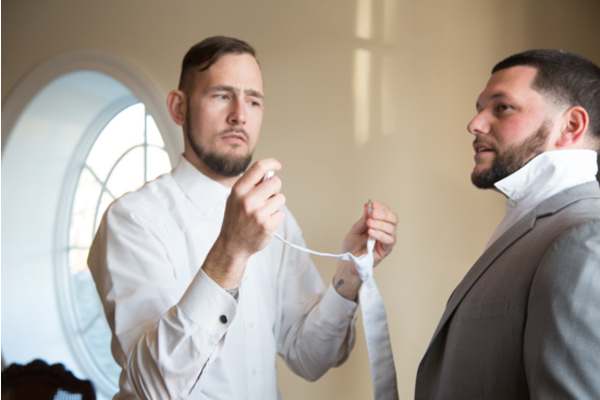 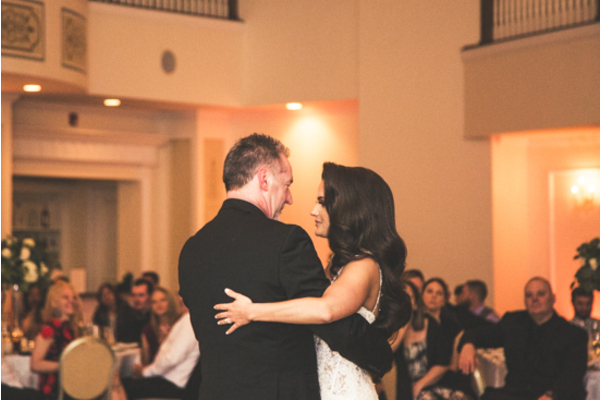 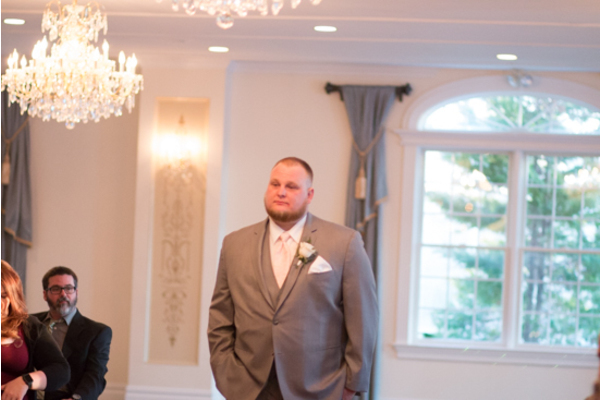 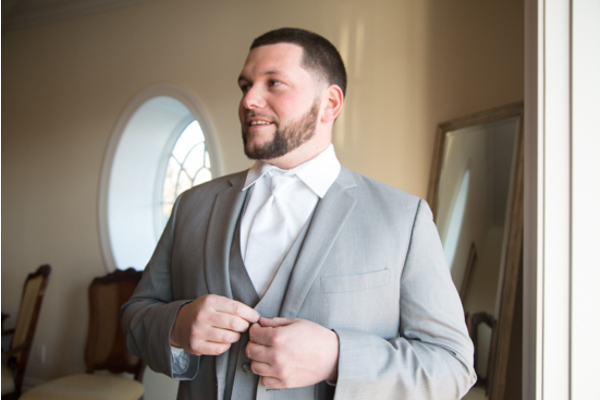 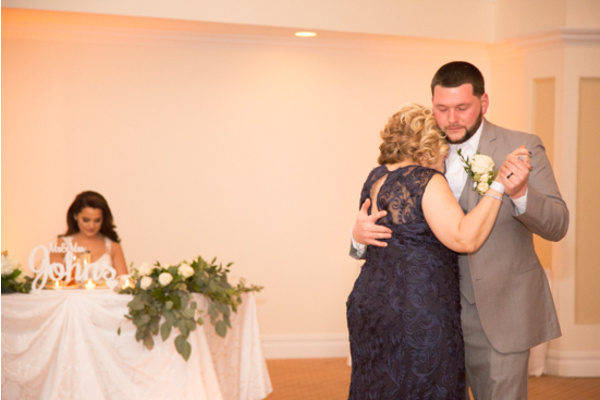 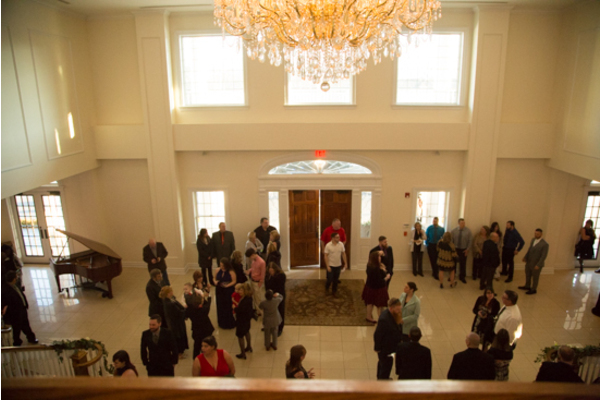 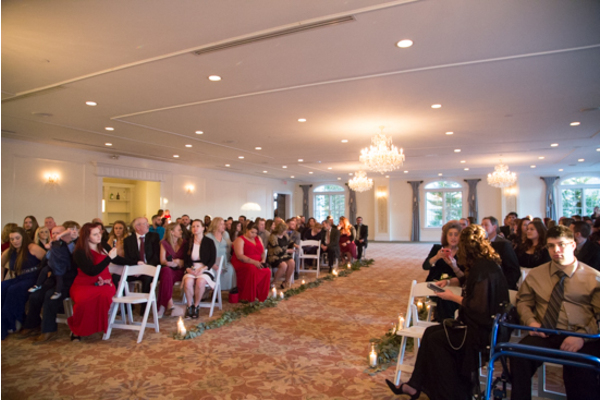 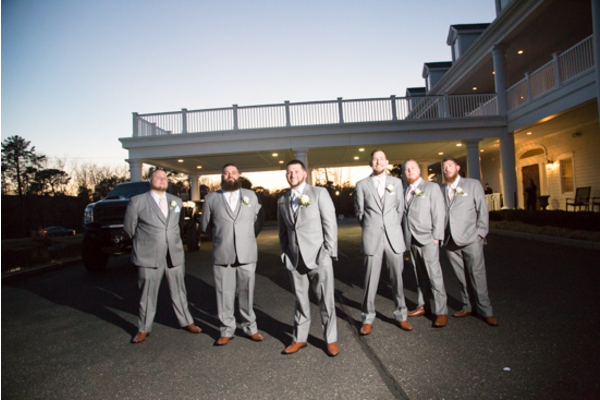 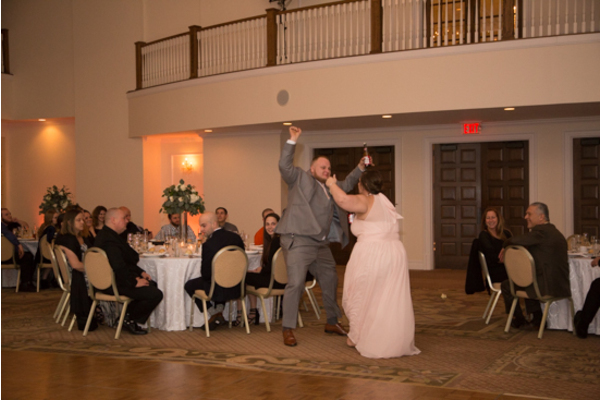 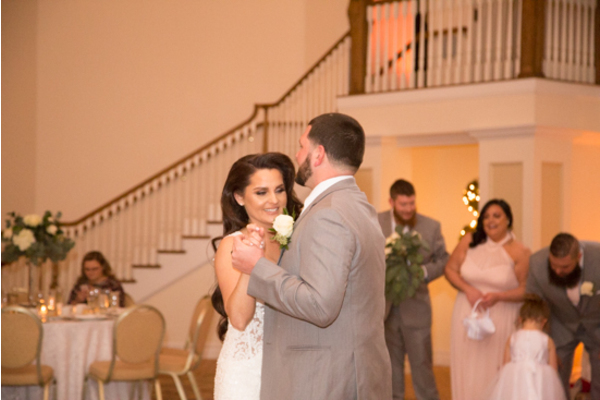 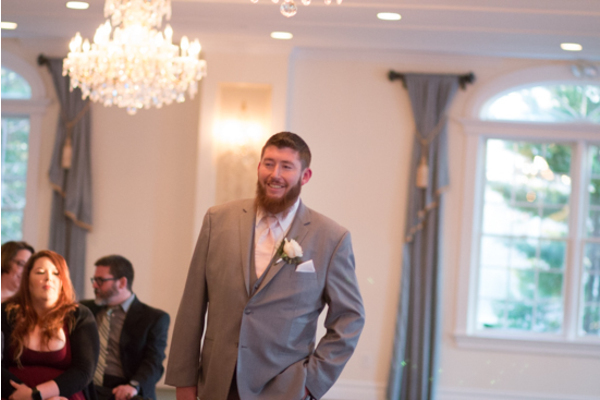 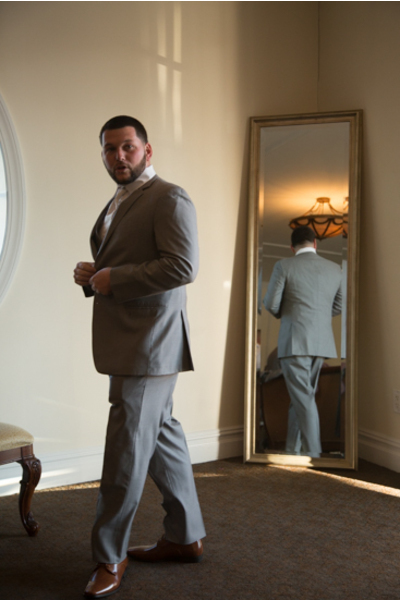 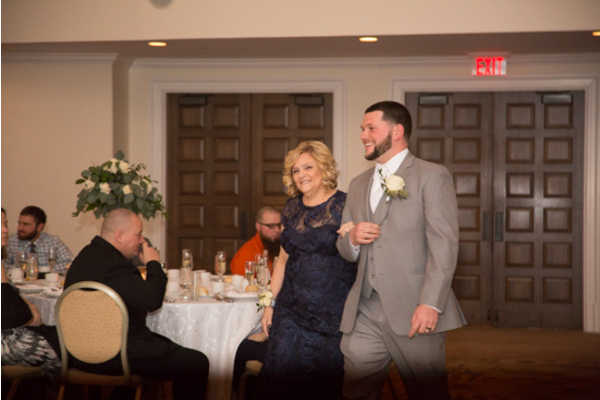 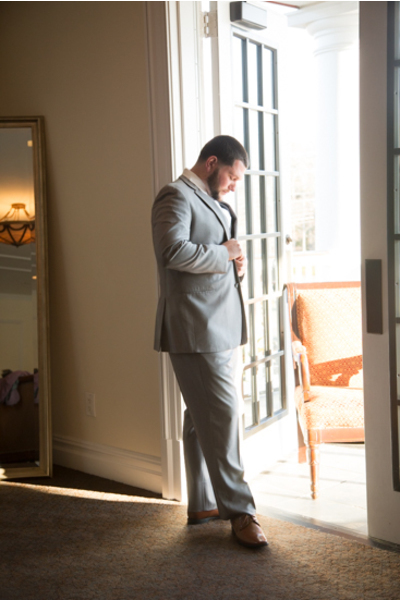 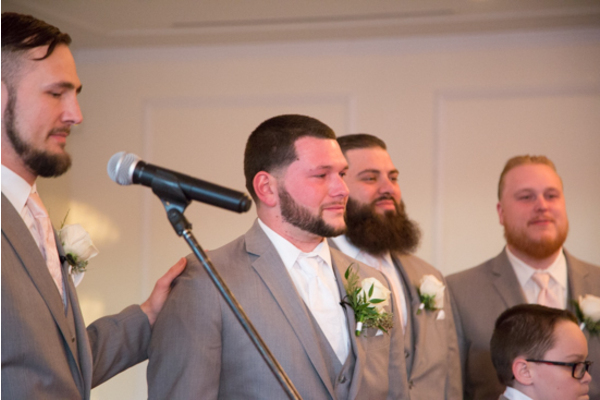 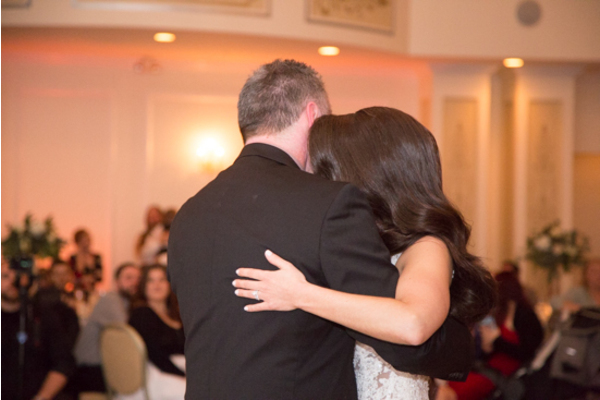 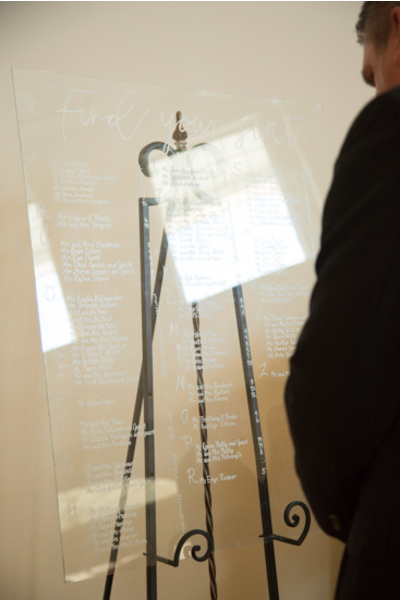 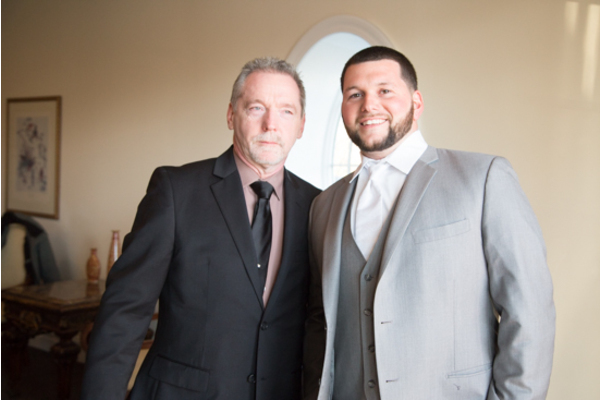 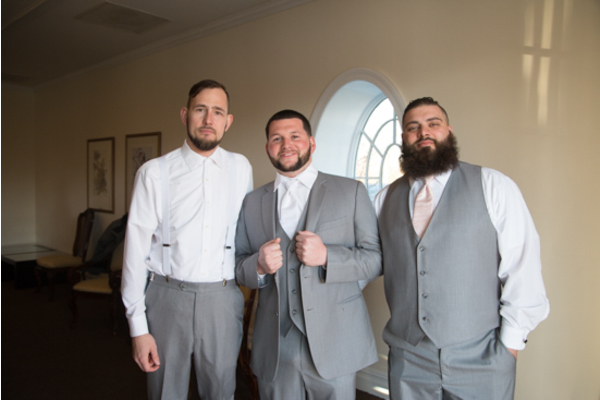 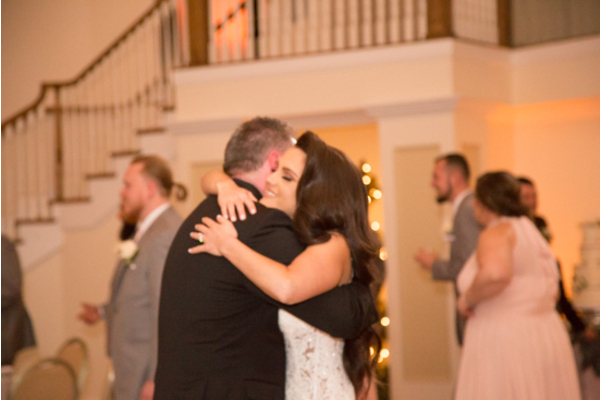 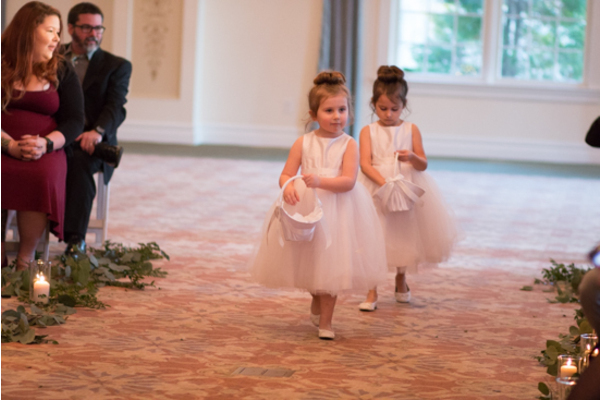 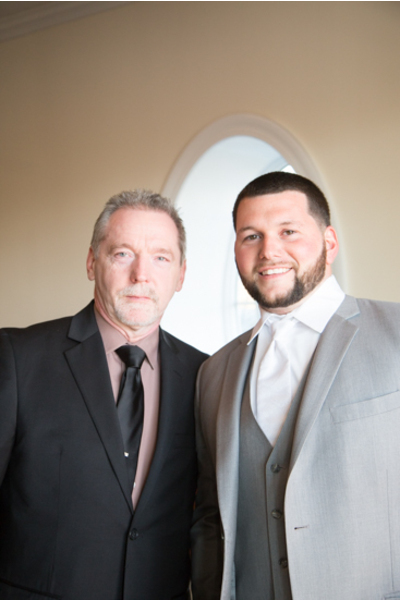 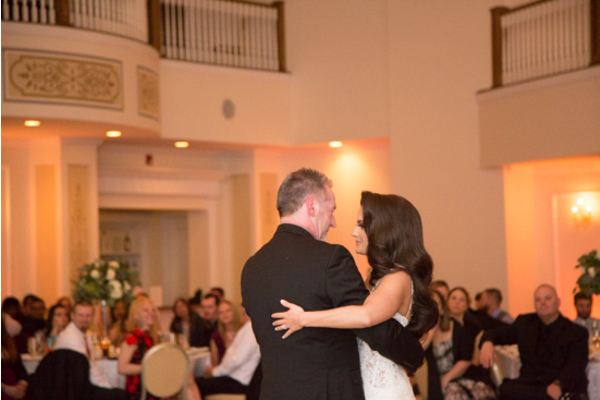 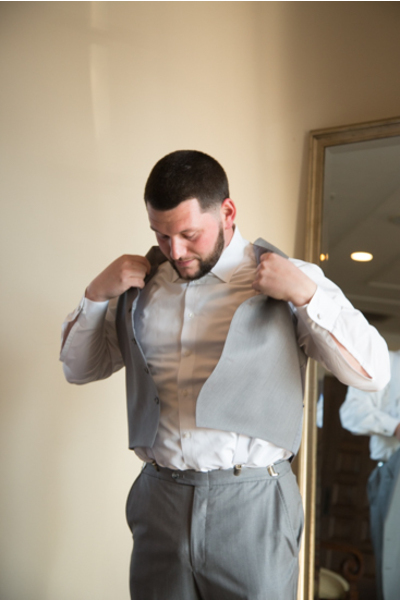 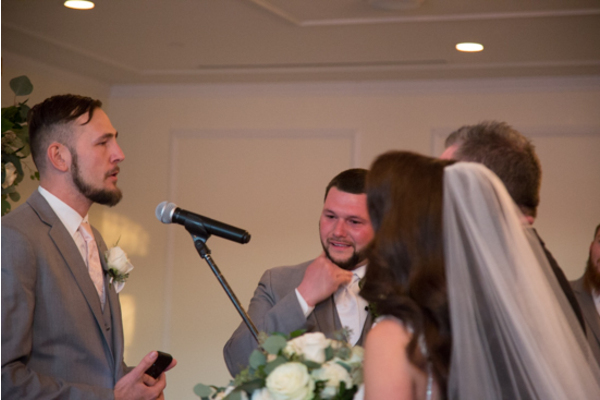 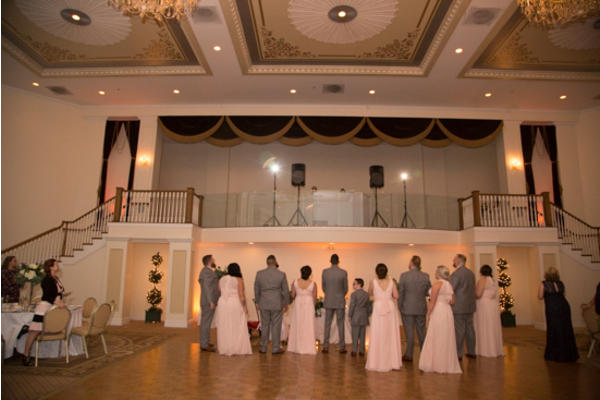 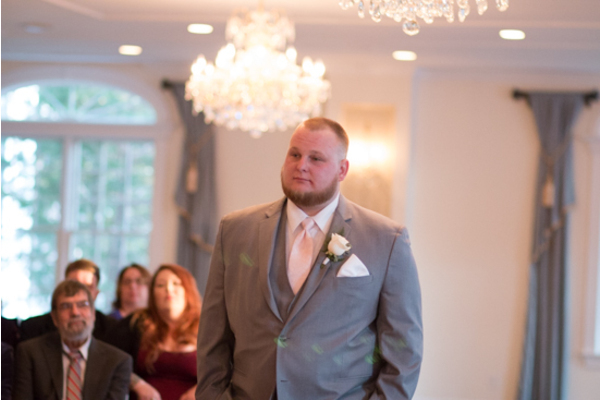 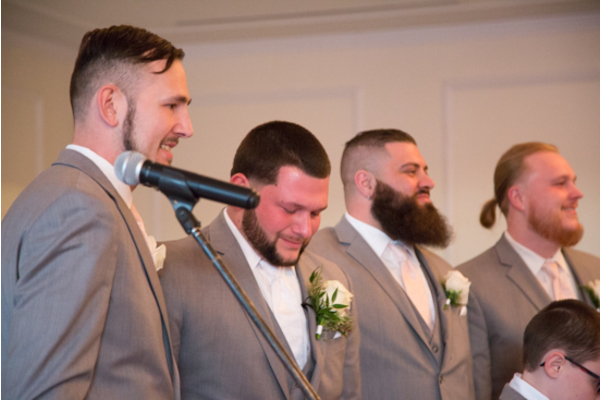 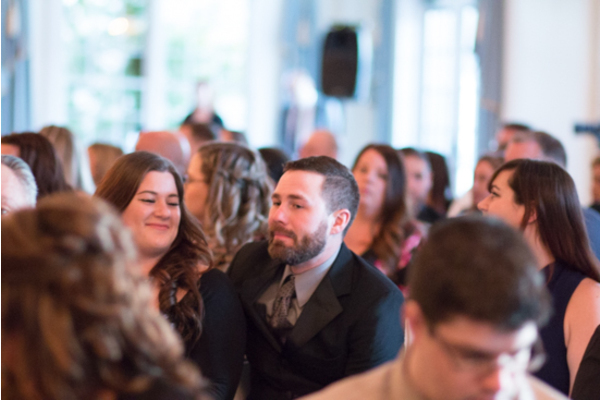 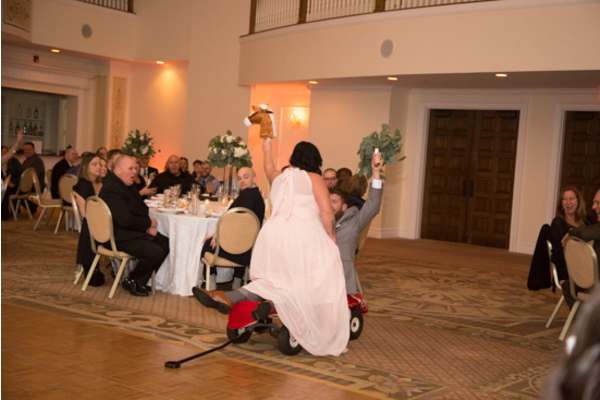 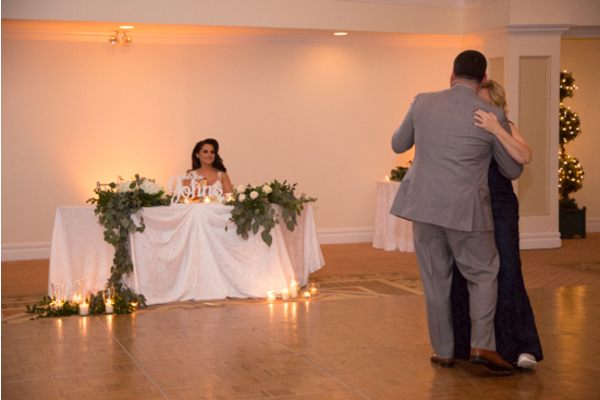 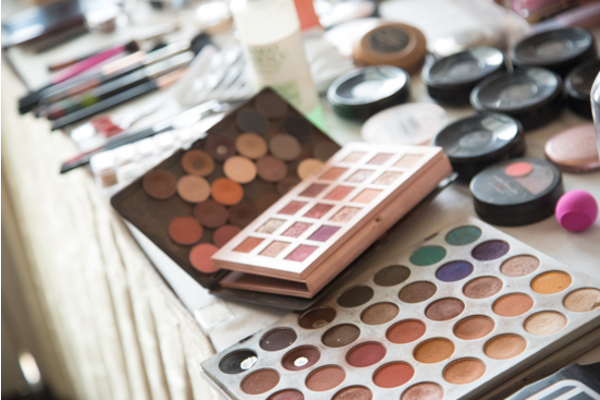 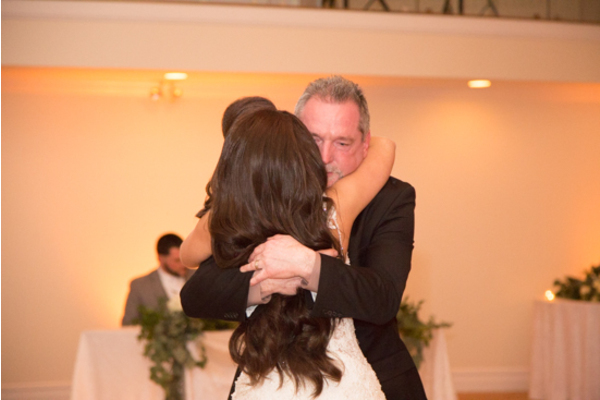 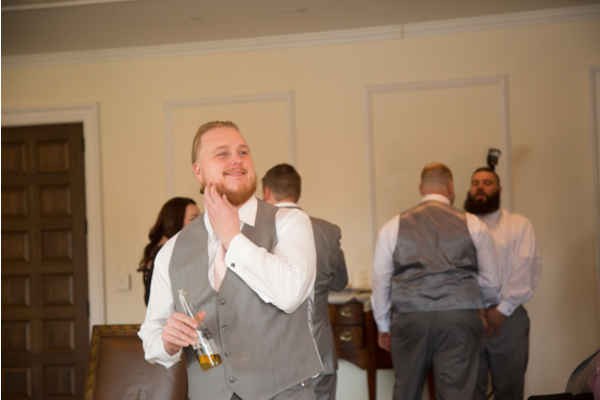 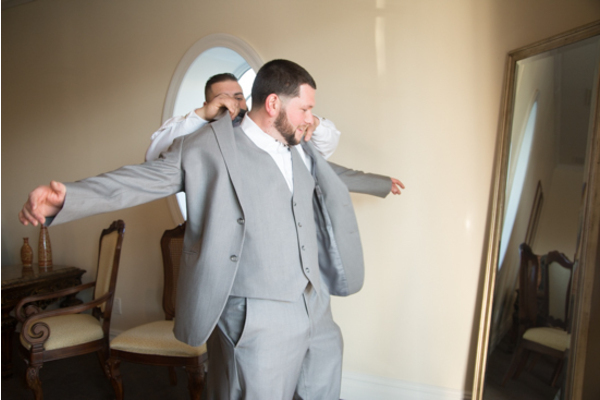 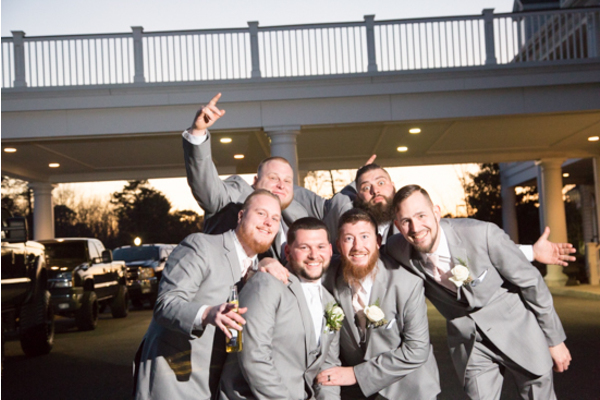 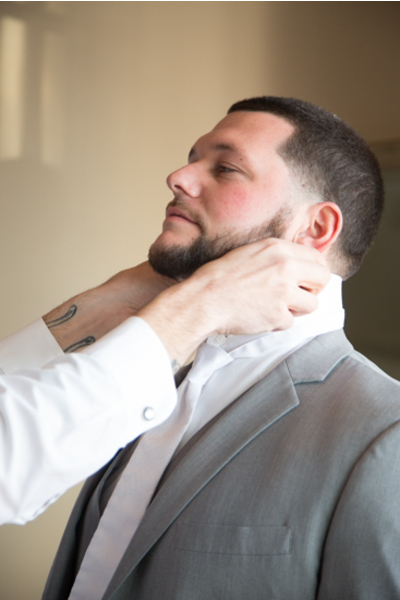 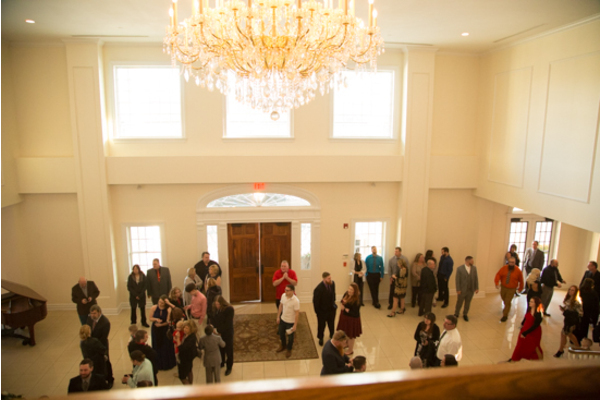 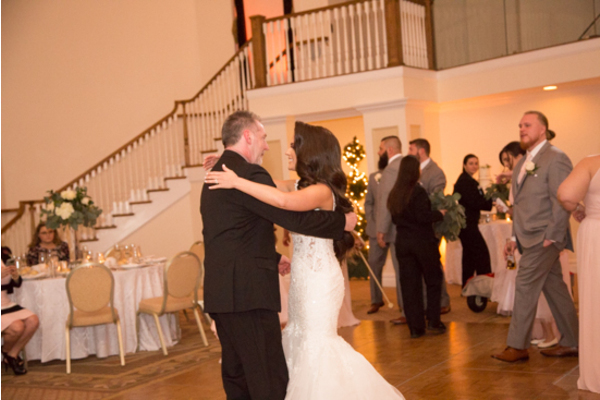 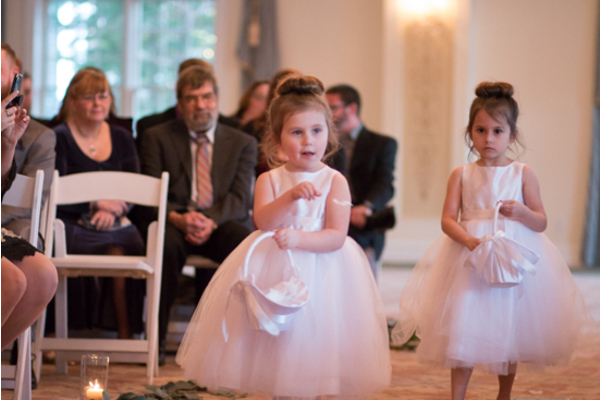 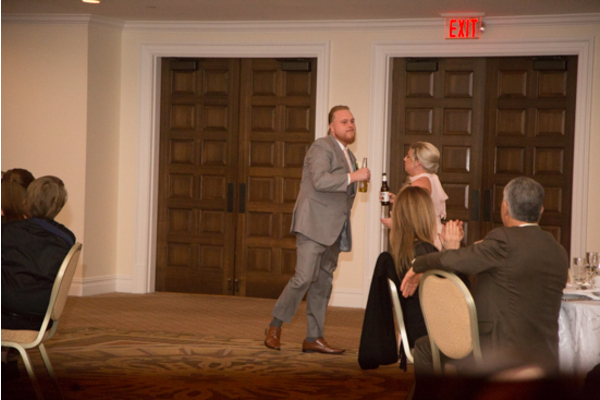 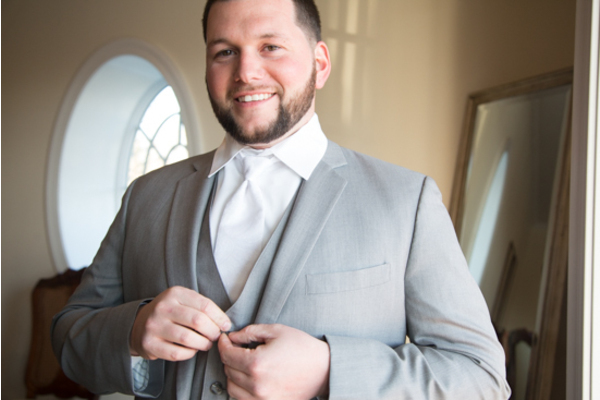 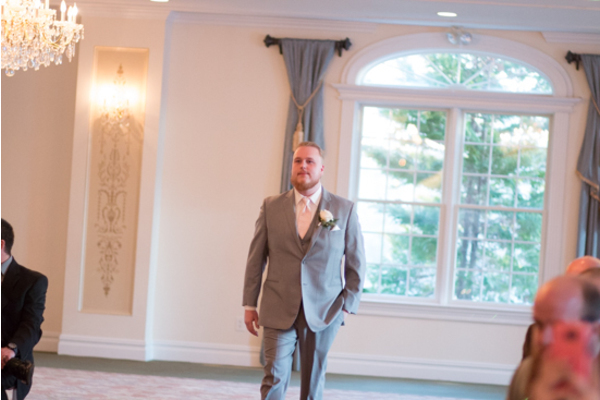 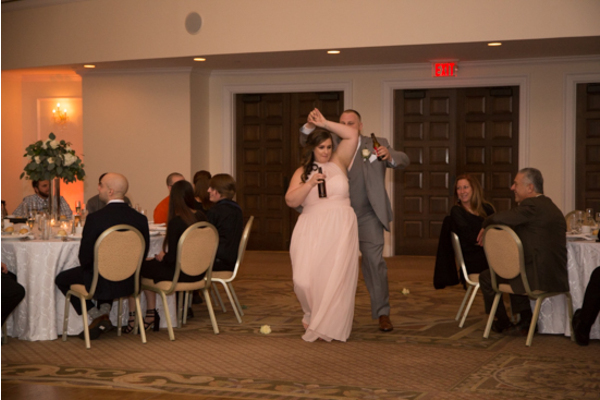 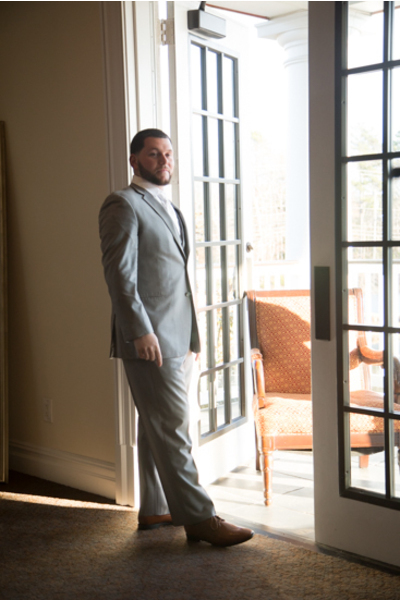 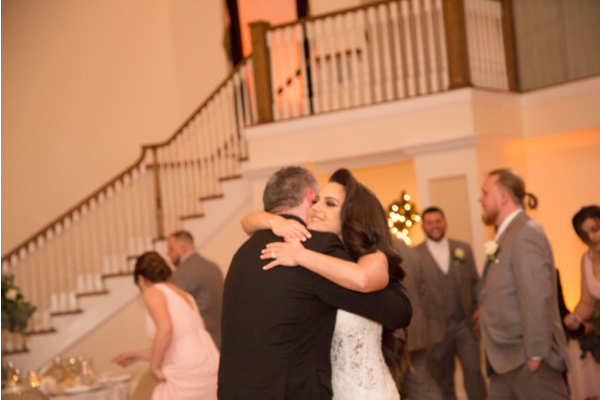 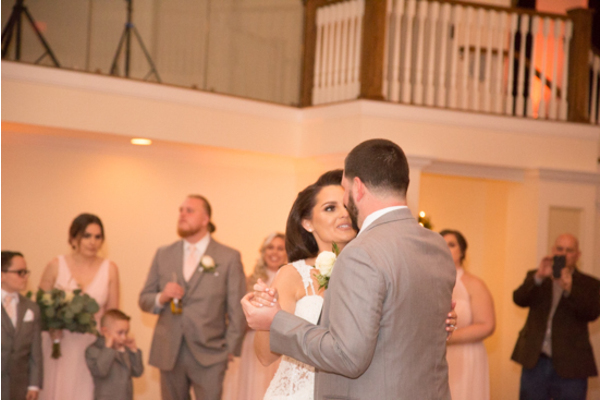 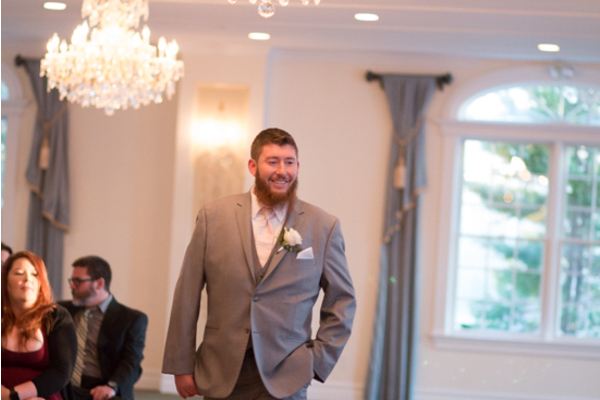 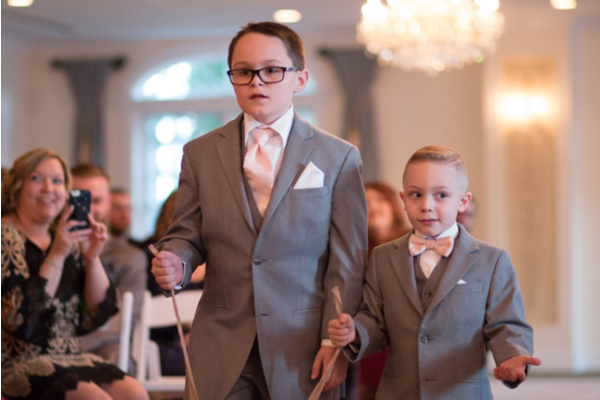 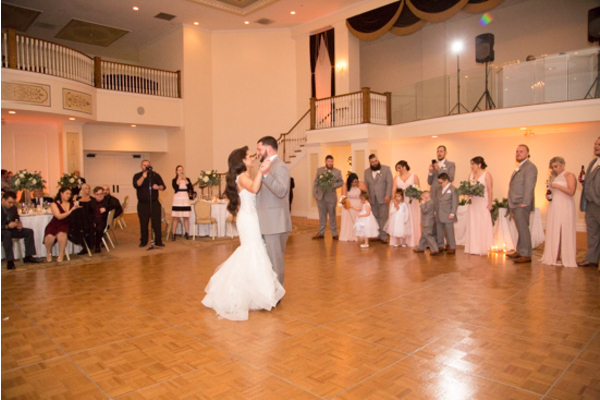 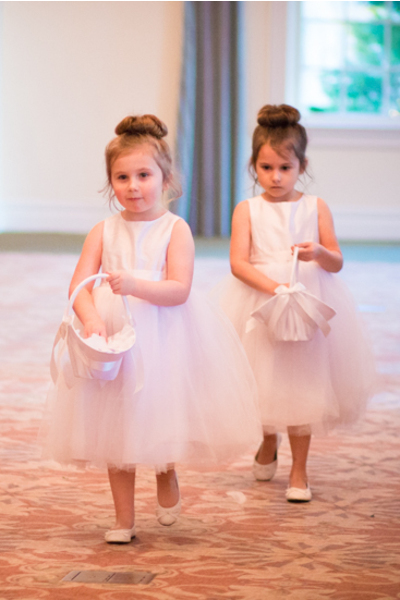 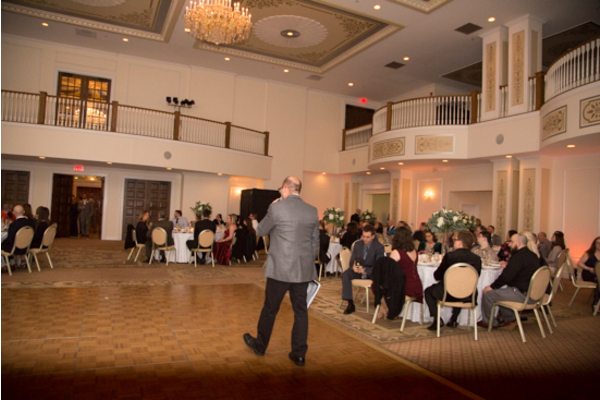 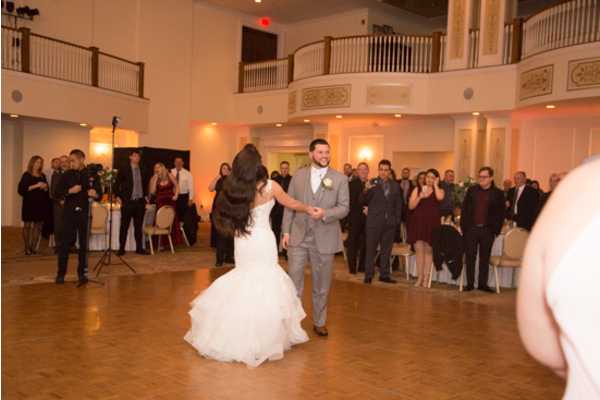 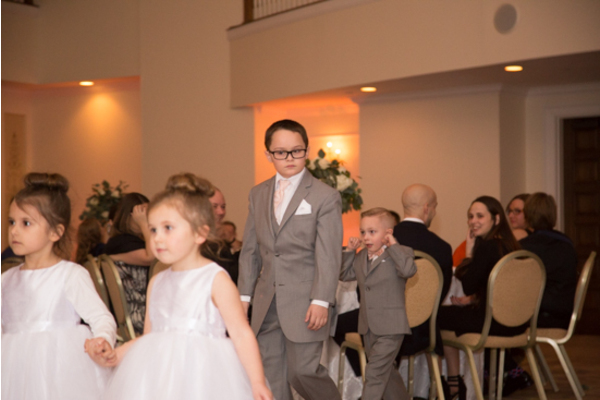 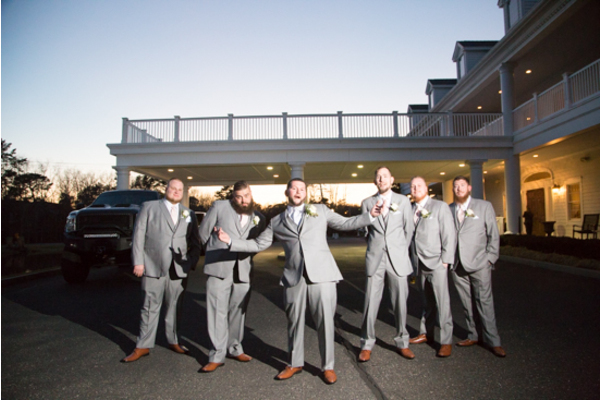 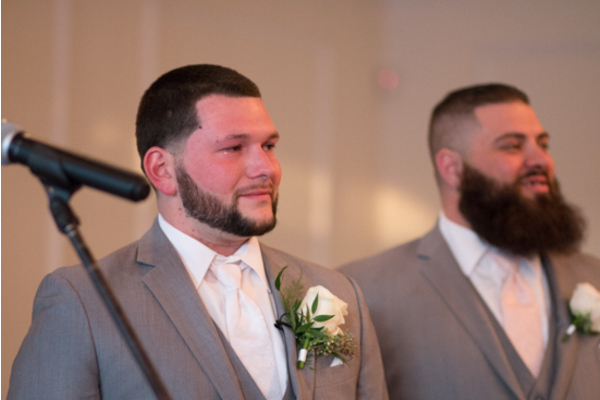 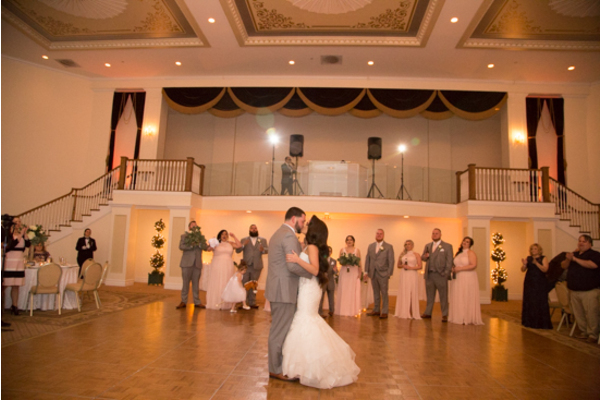 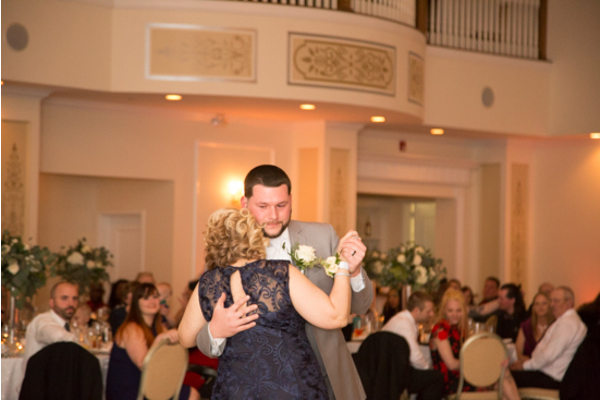 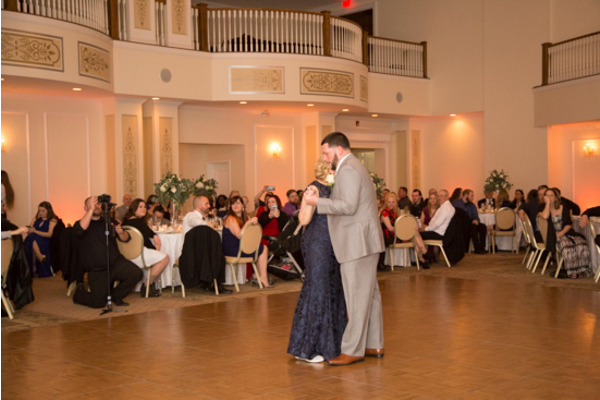 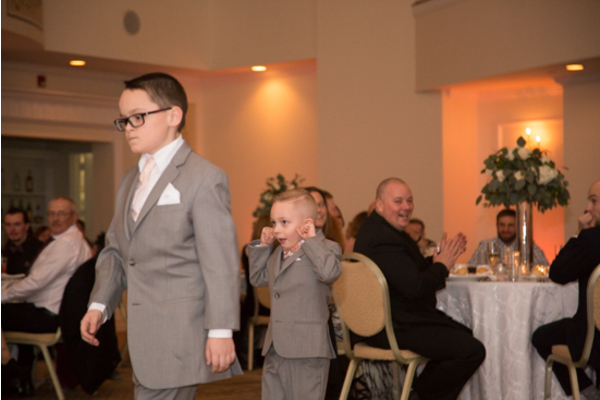 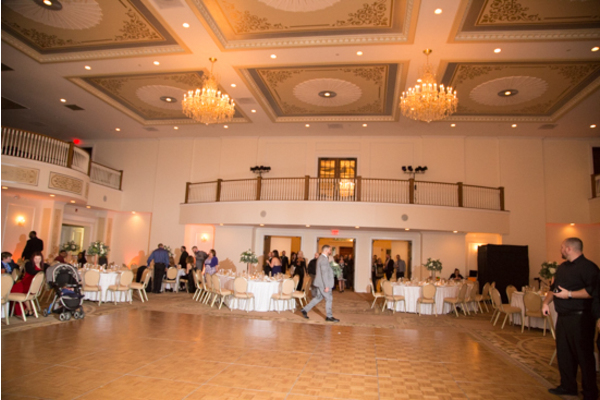 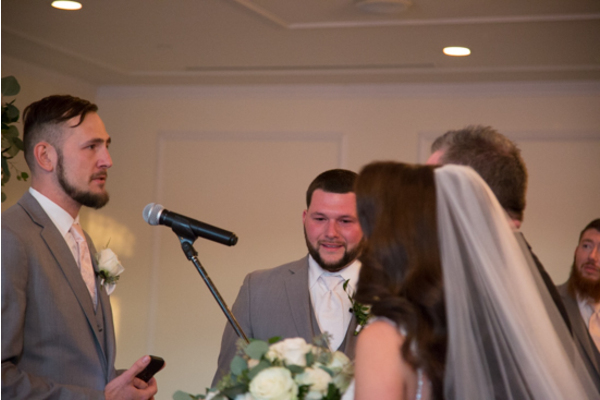 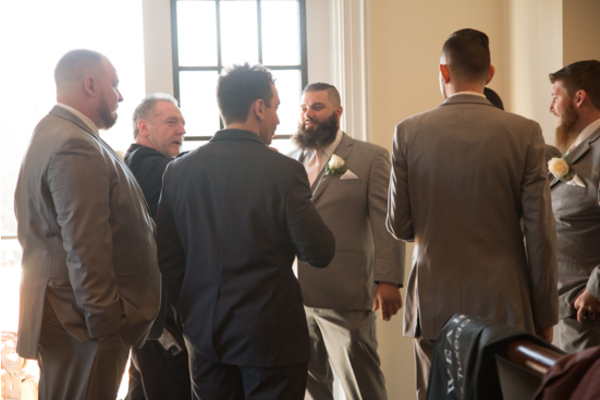 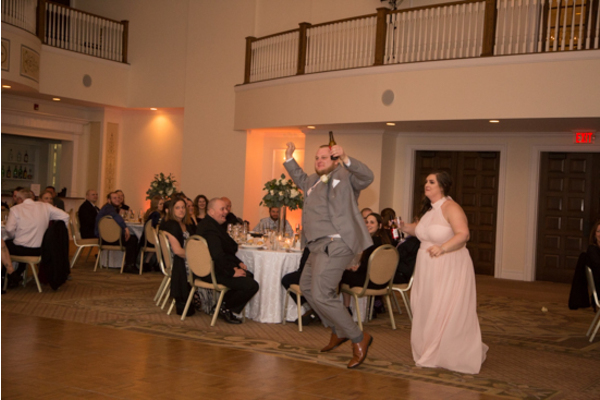 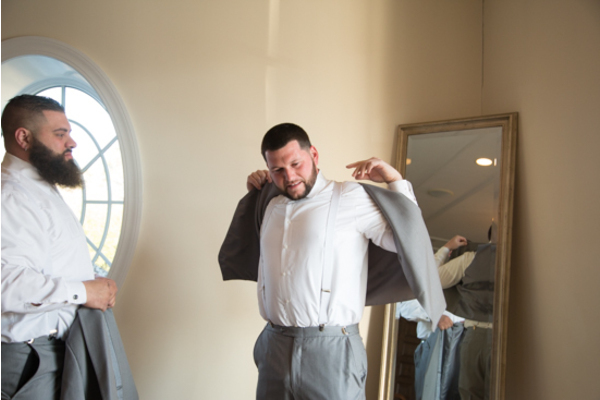 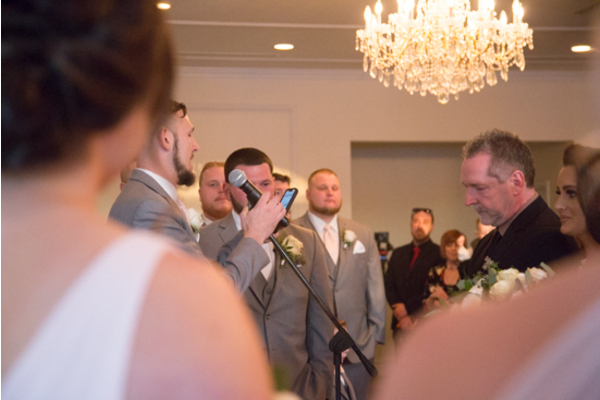 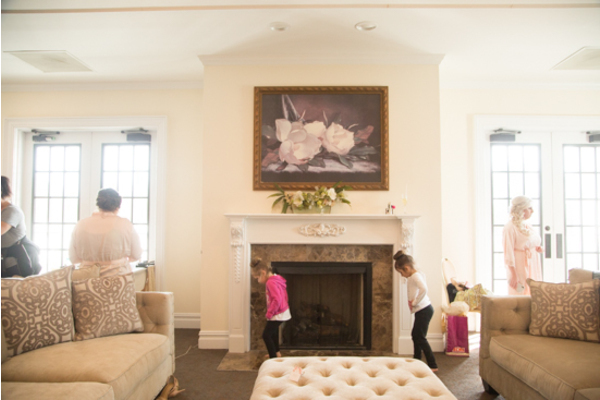 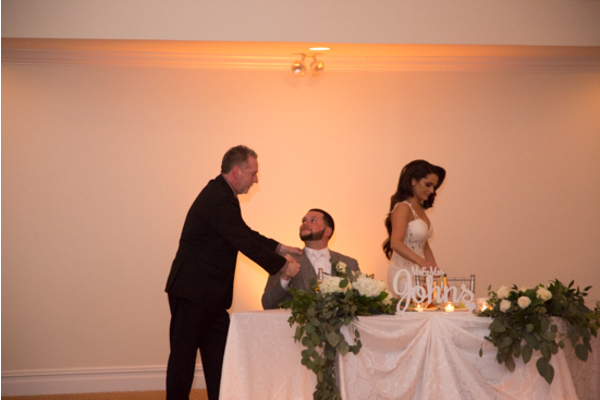 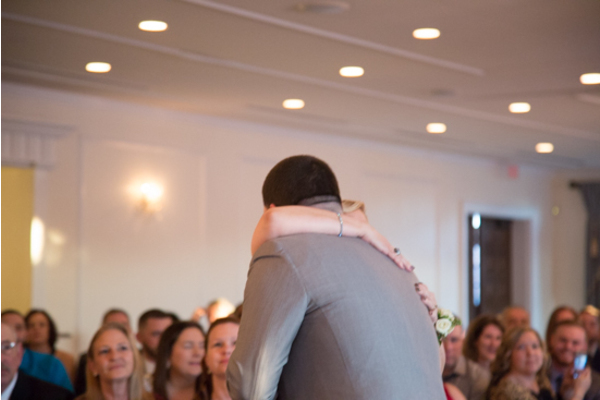 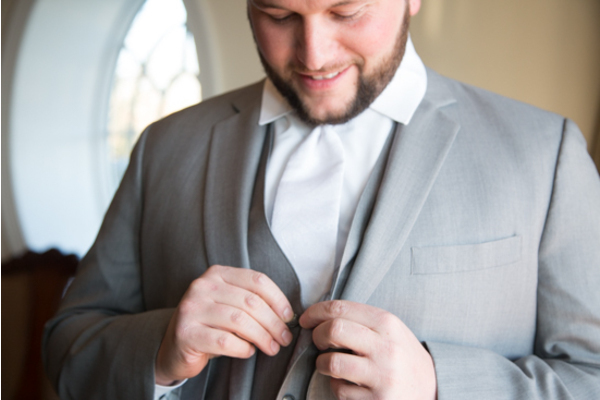 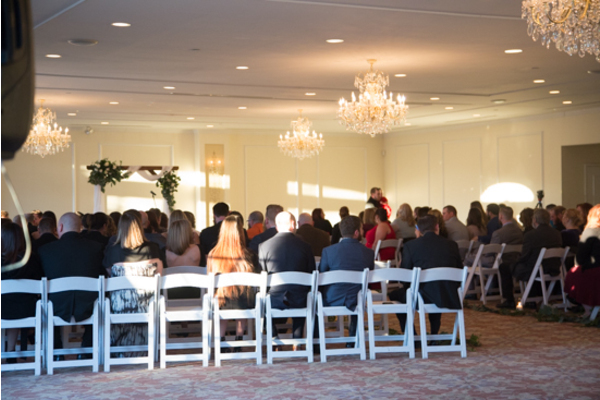 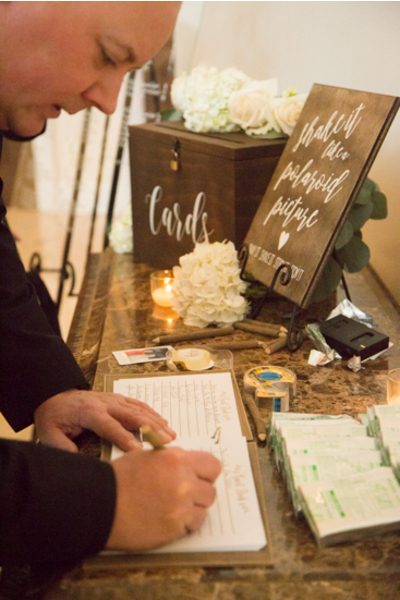 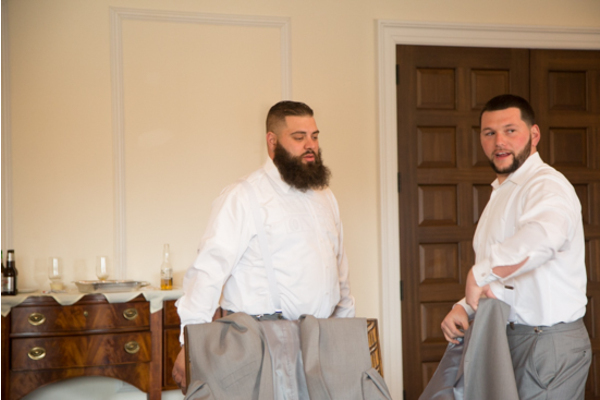 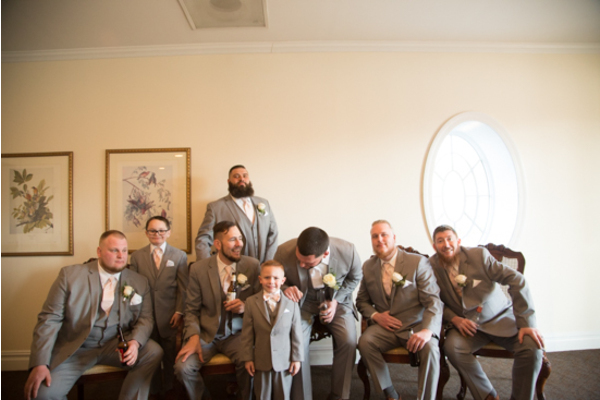 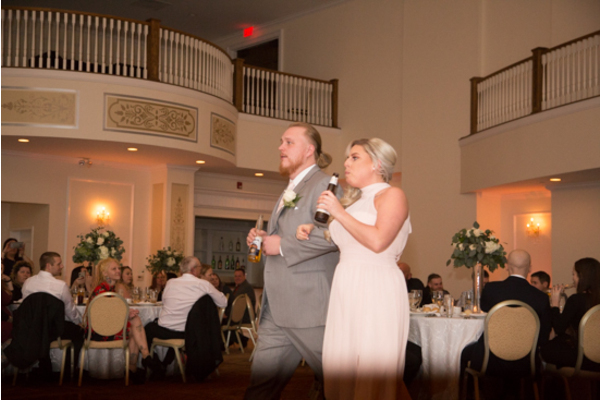 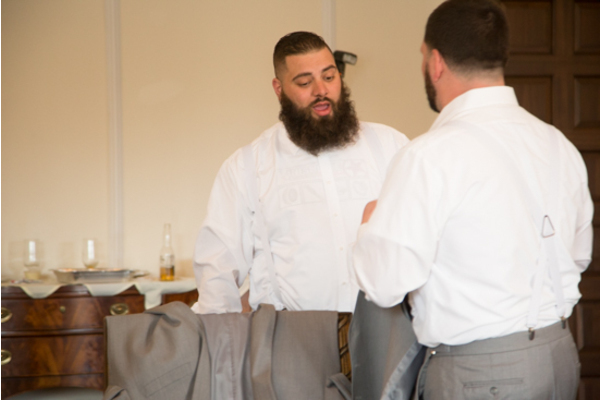 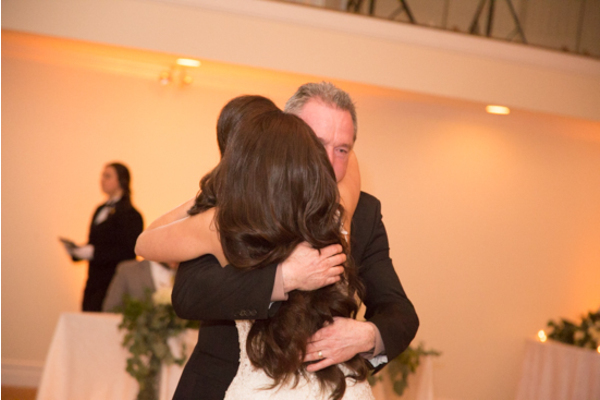 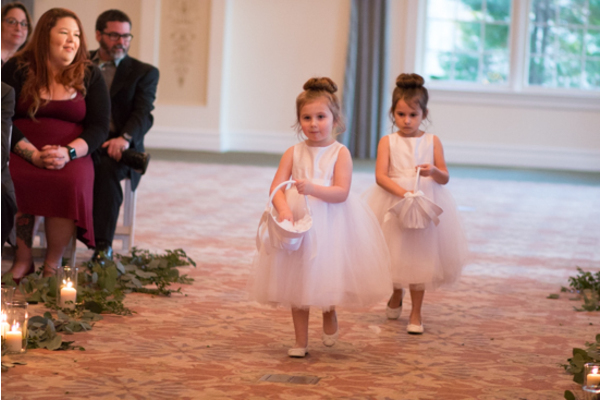 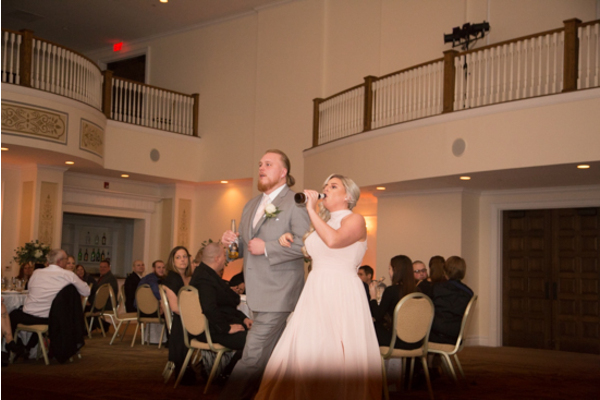 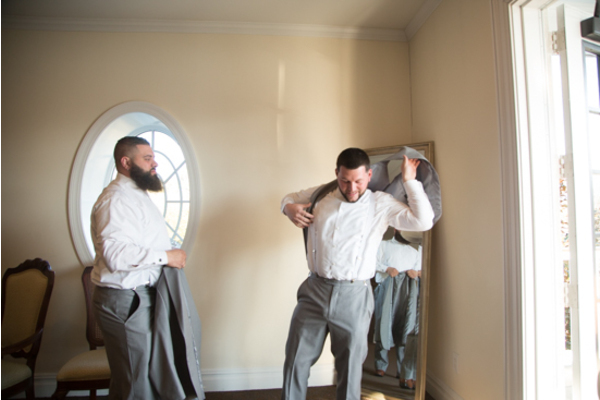 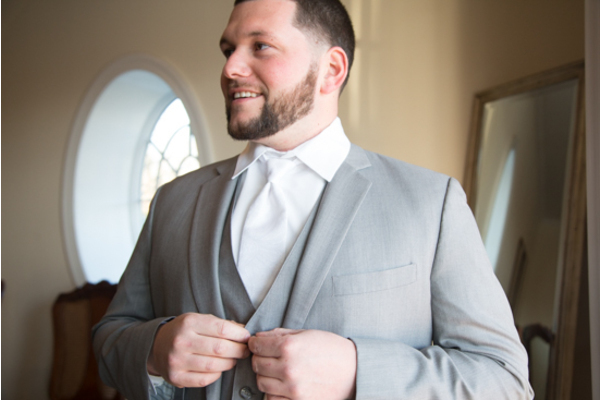 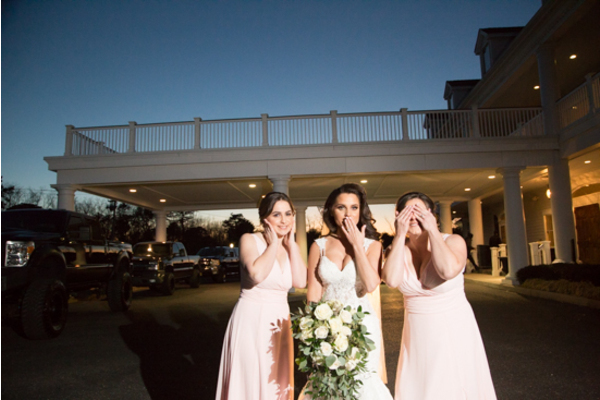 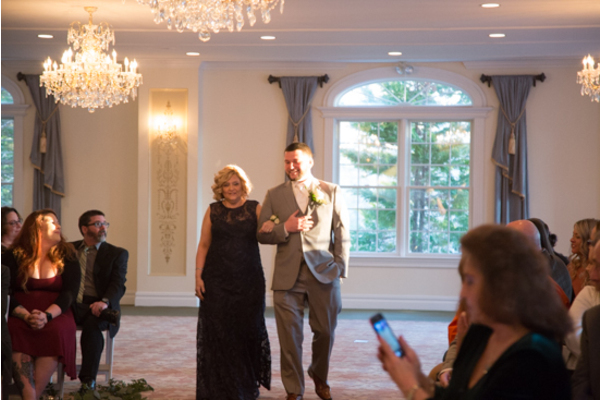 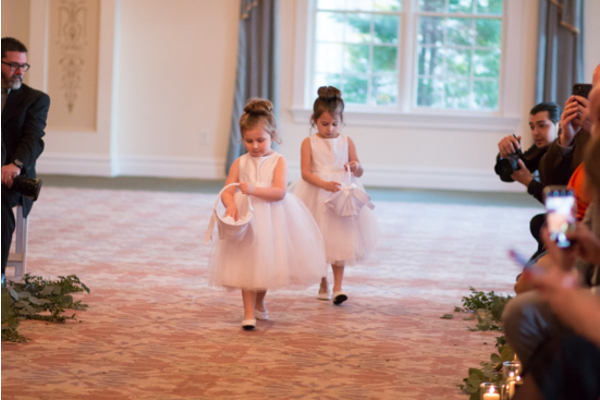 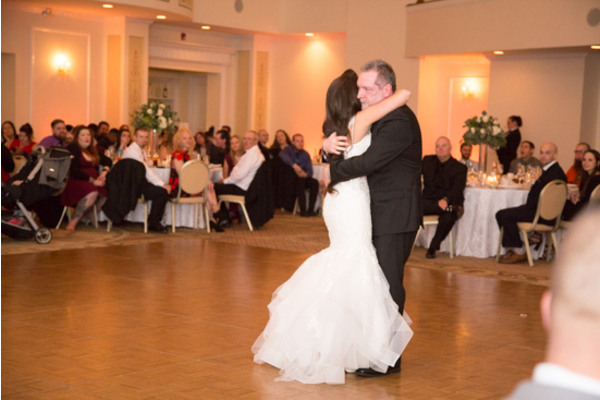 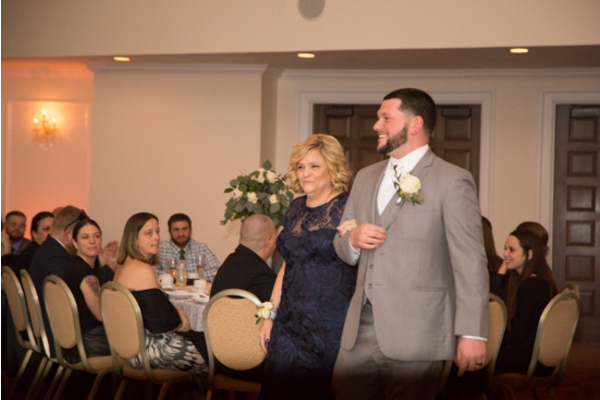 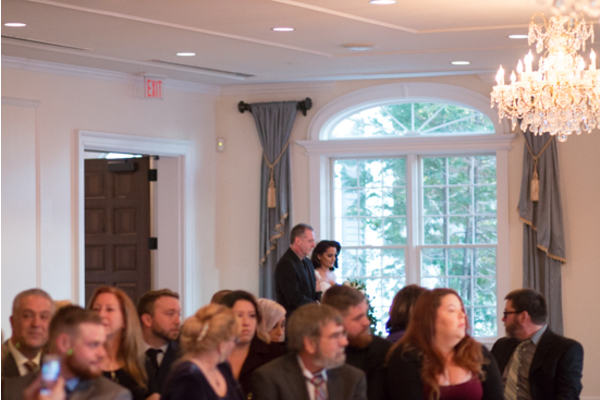 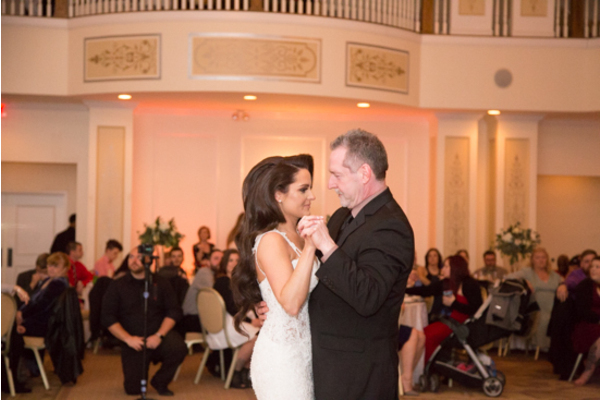 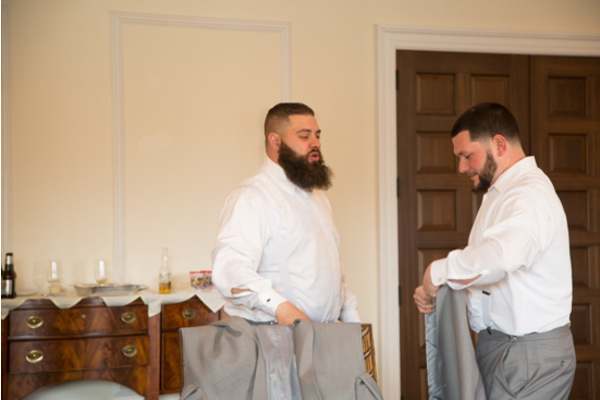 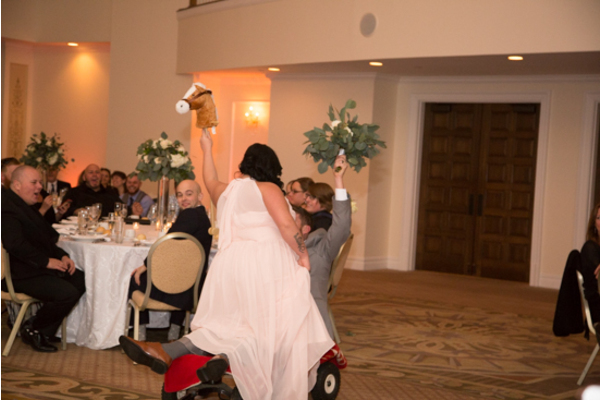 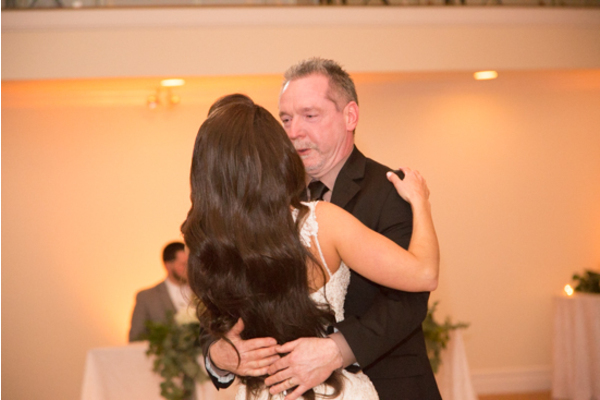 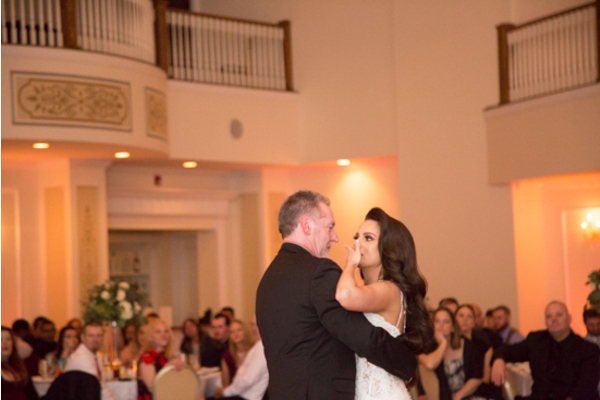 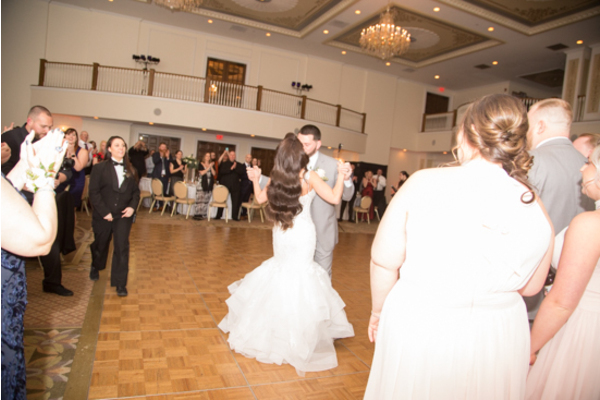 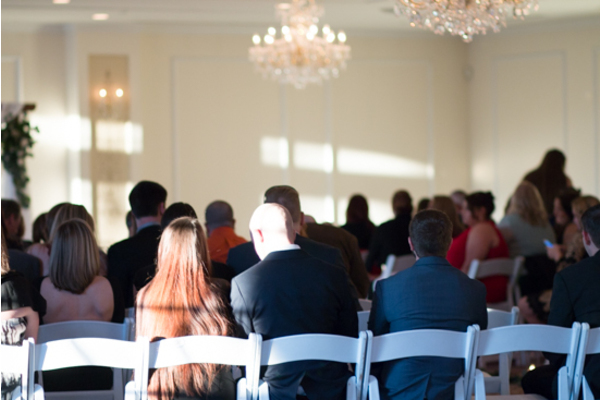 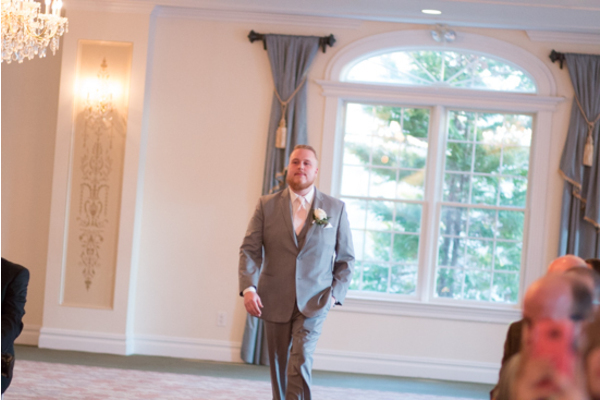 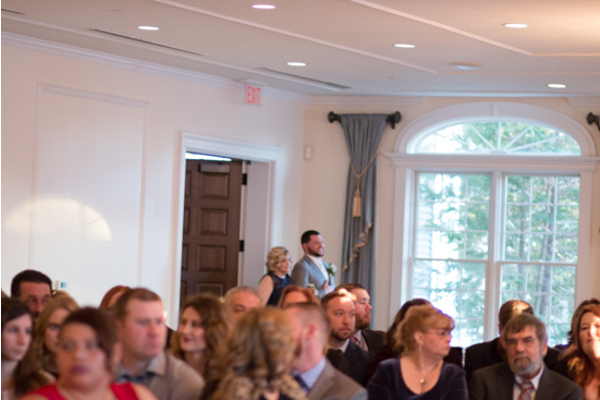 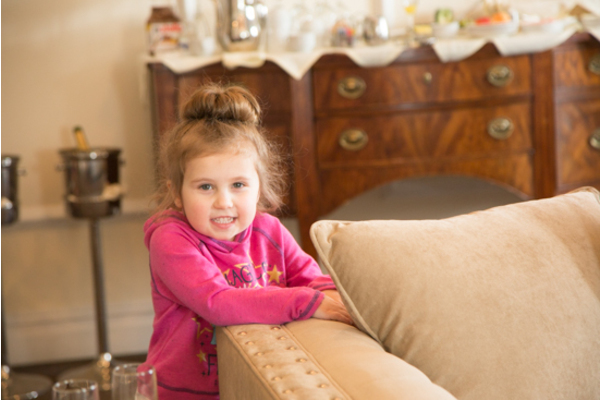 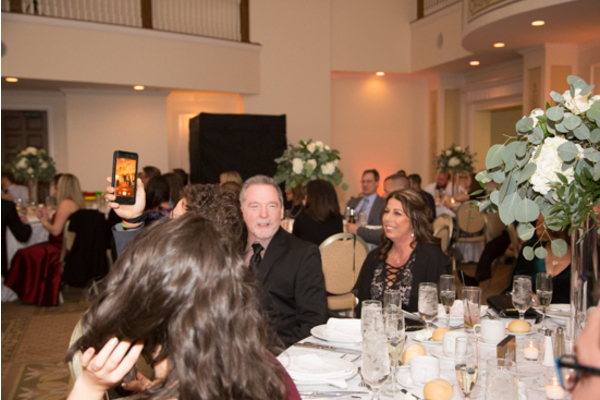 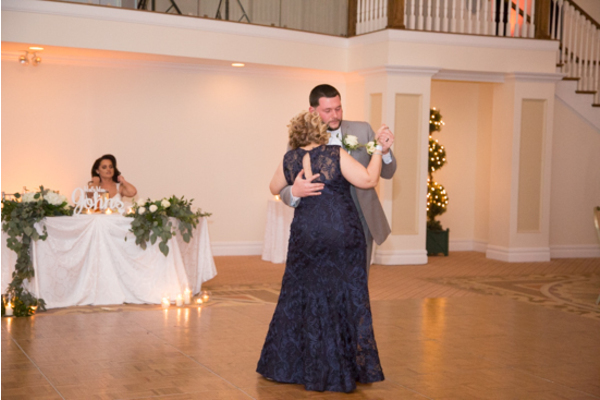 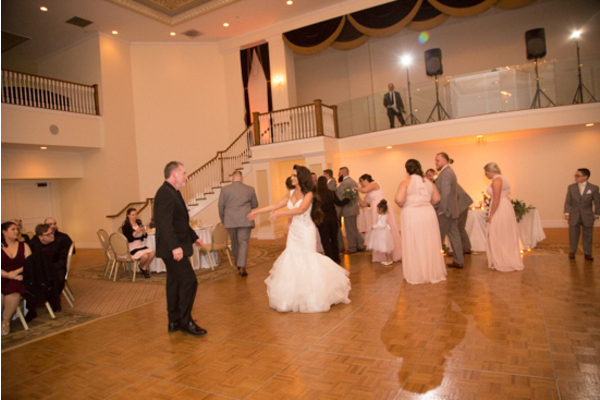 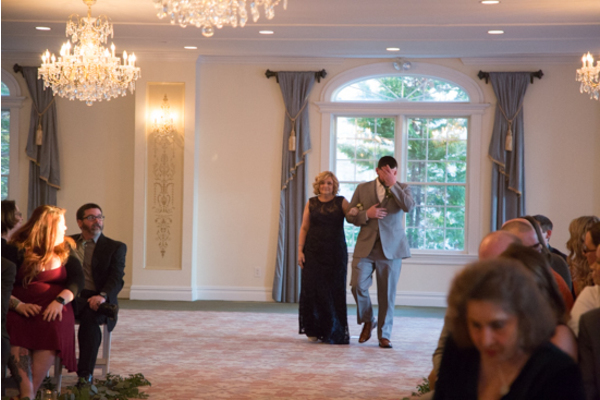 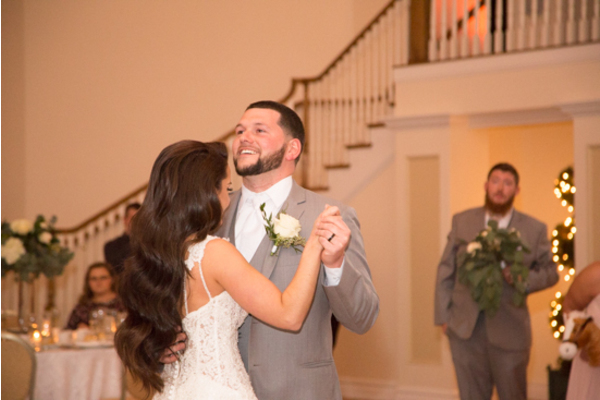 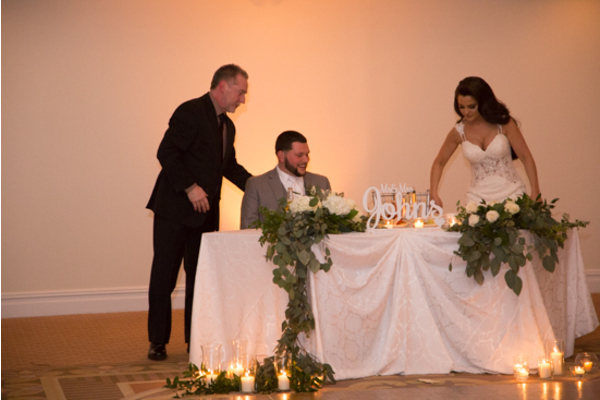 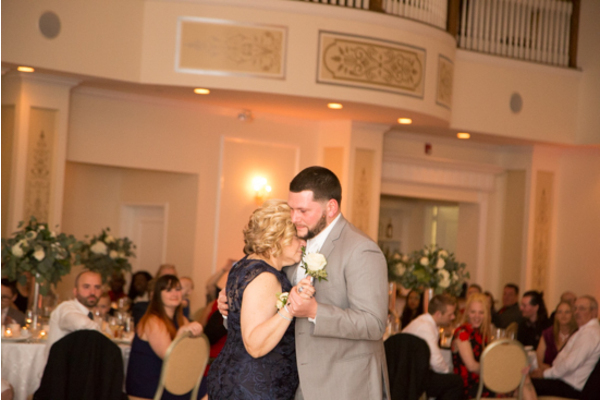 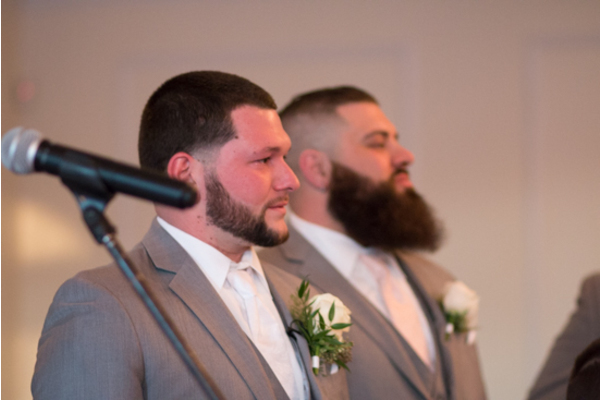 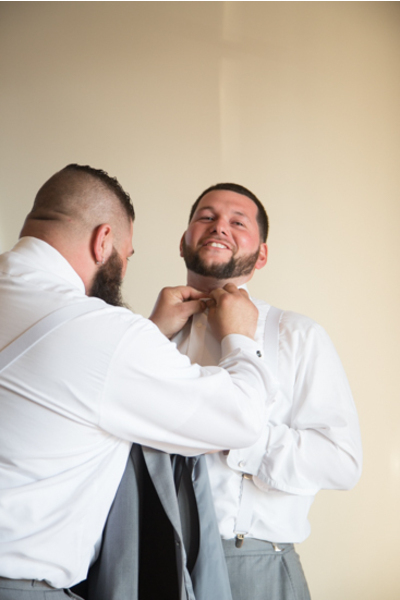 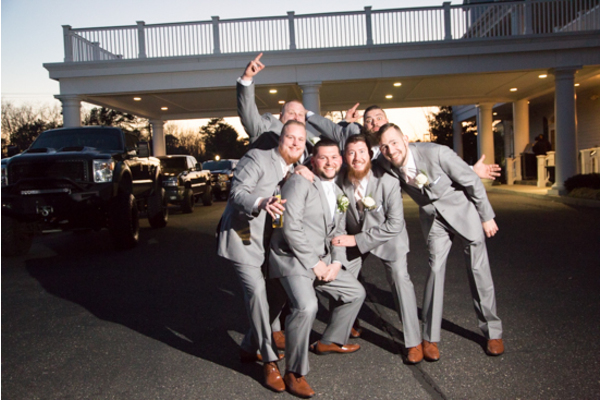 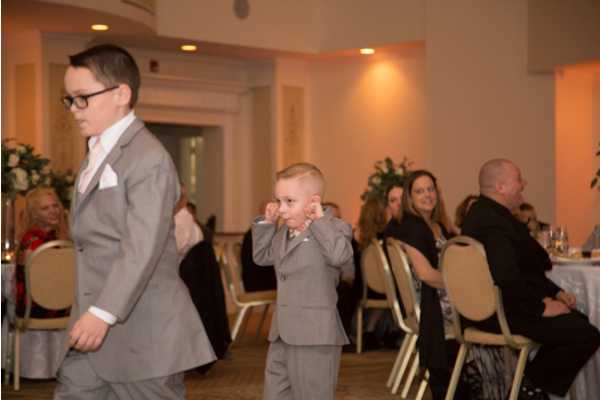 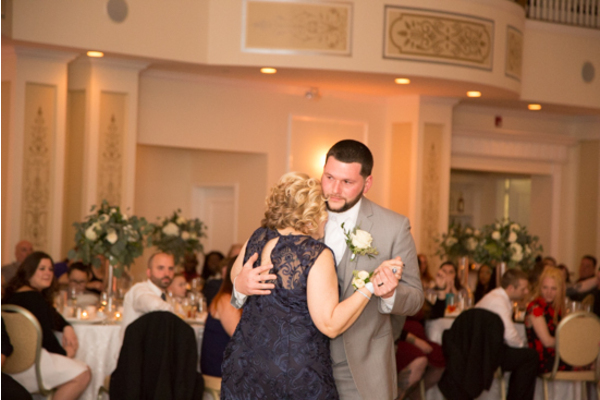 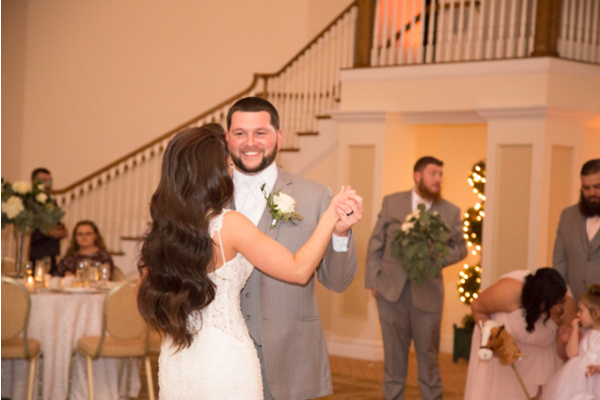 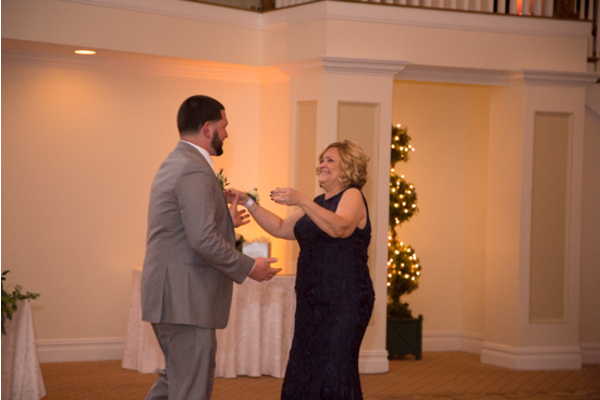 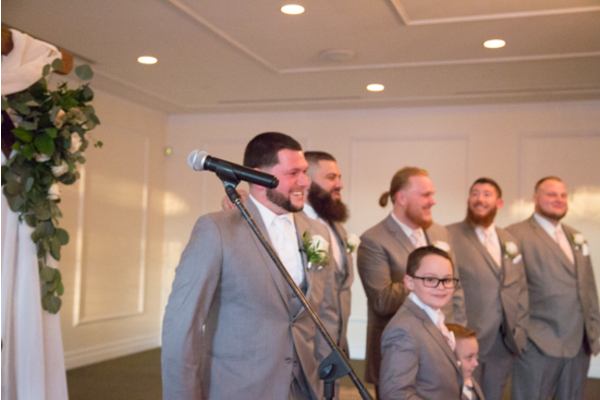 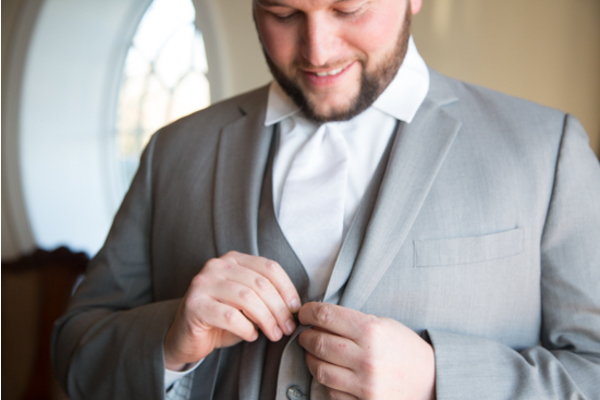 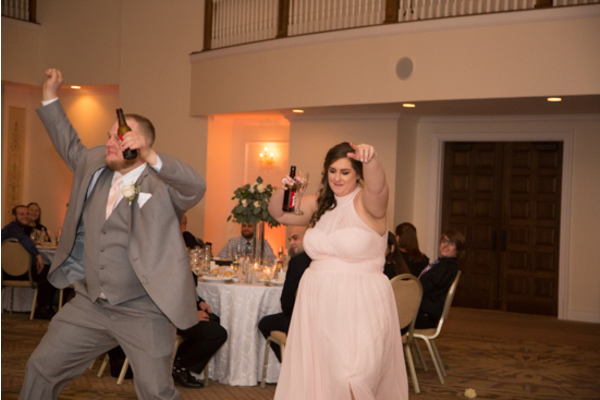 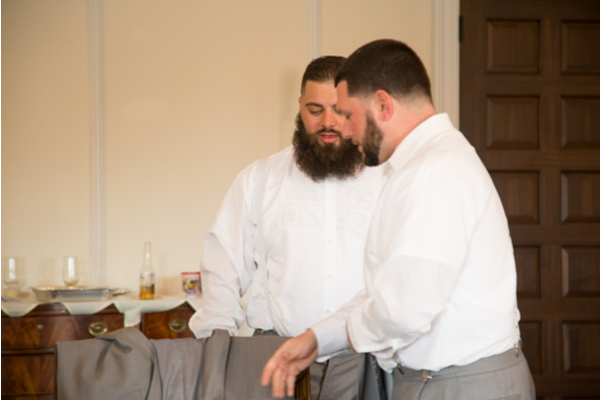 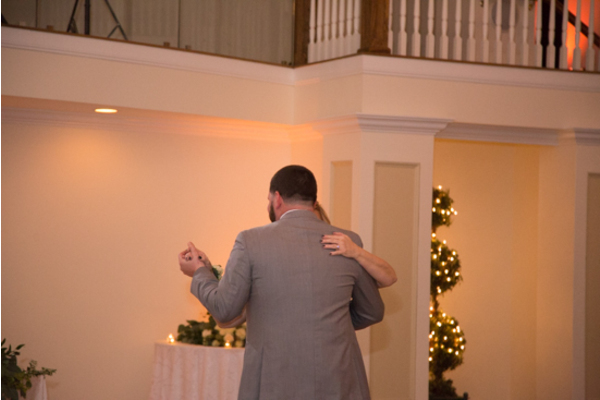 Of course, our NJ Wedding DJ kept this party going at The Carriage House. 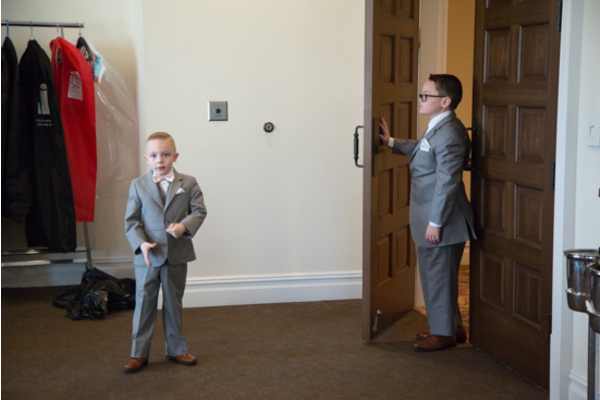 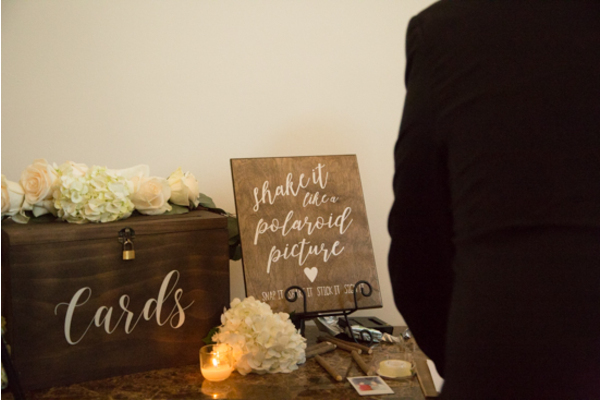 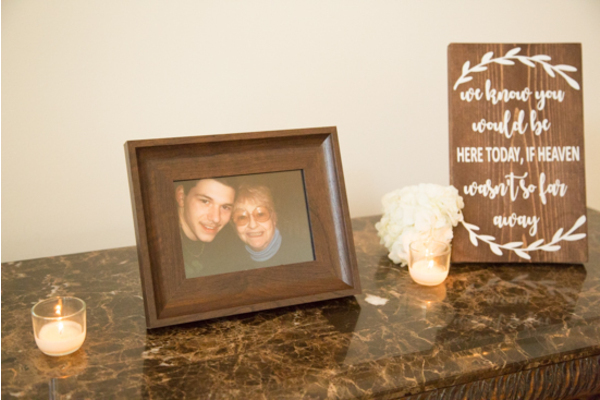 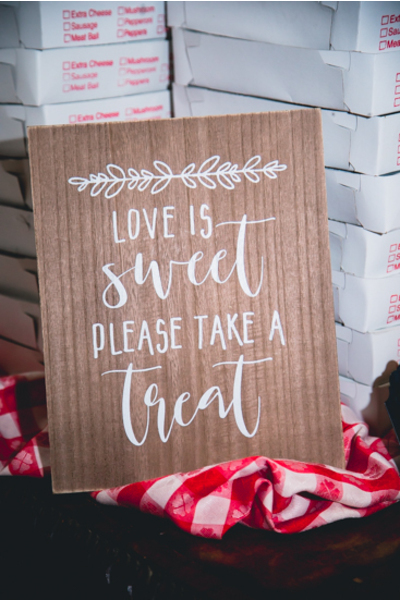 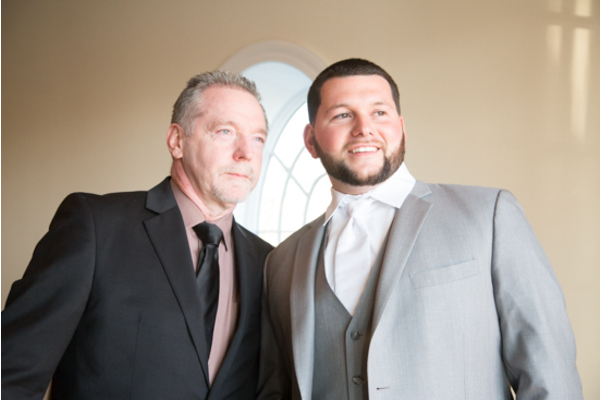 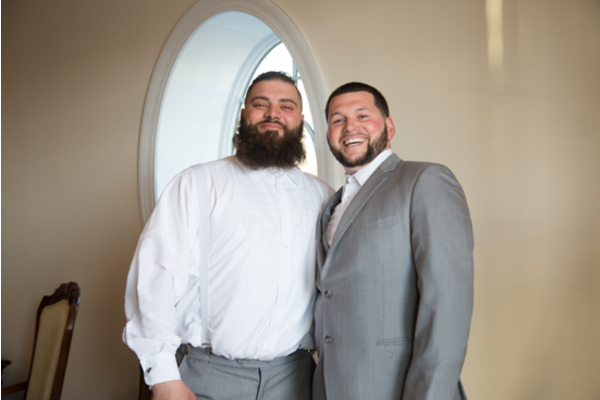 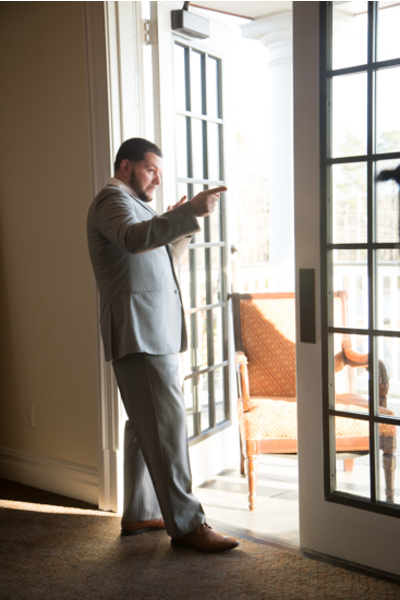 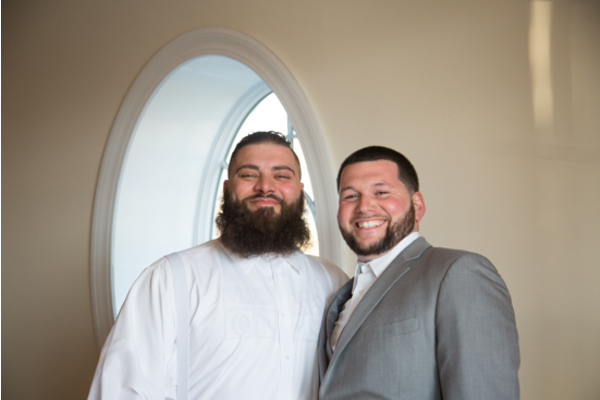 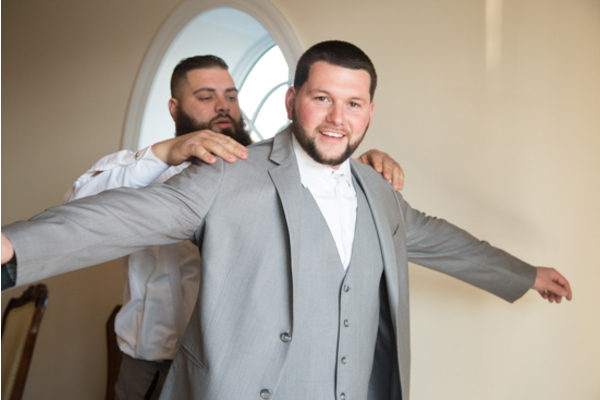 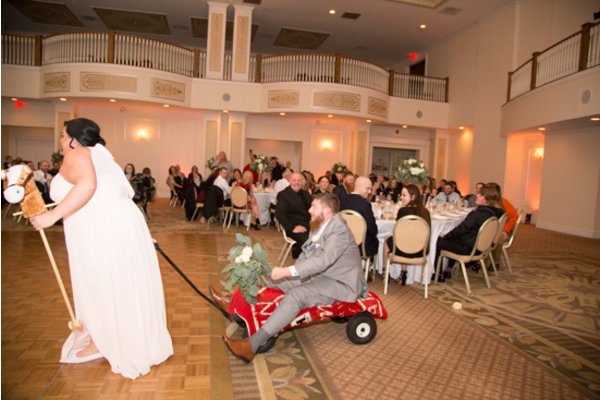 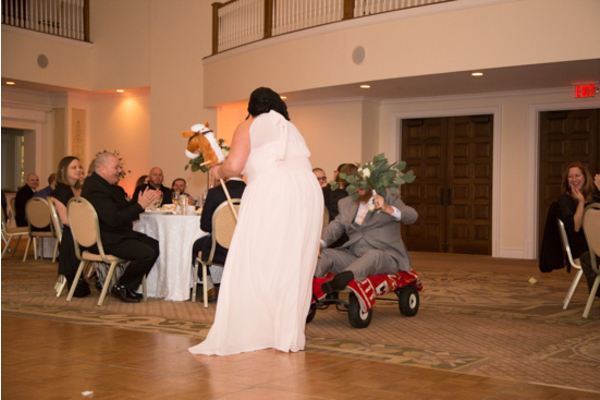 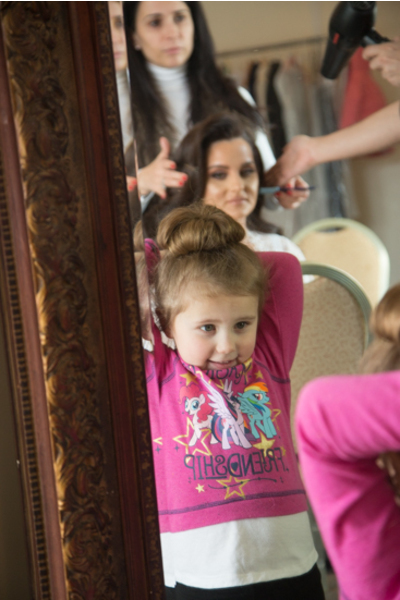 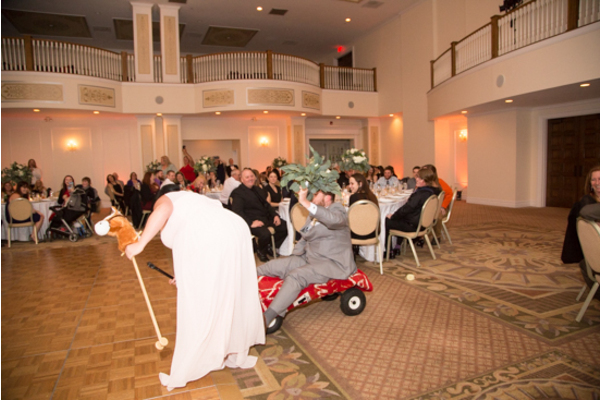 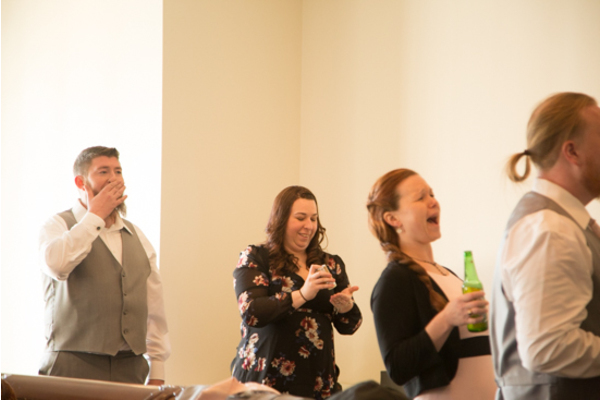 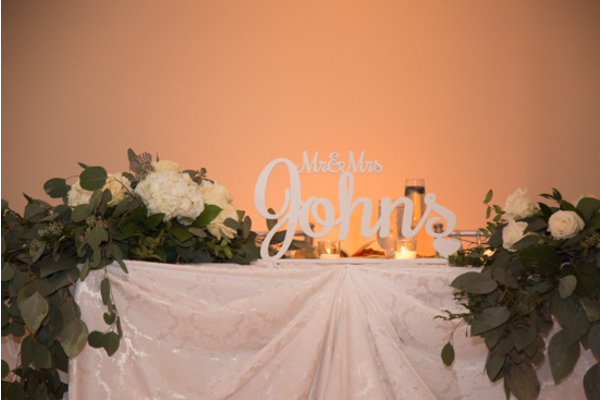 Likewise, our NJ Wedding Photo Booth made the event even more special. 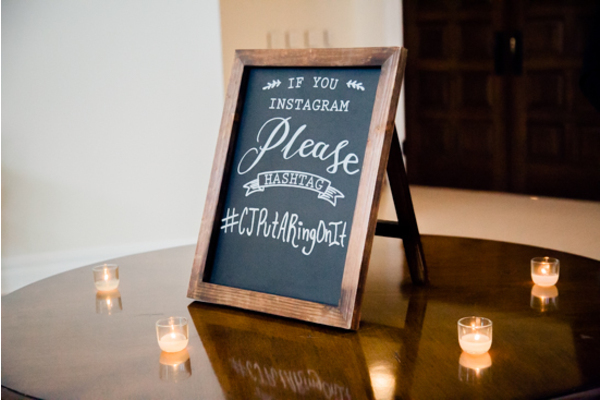 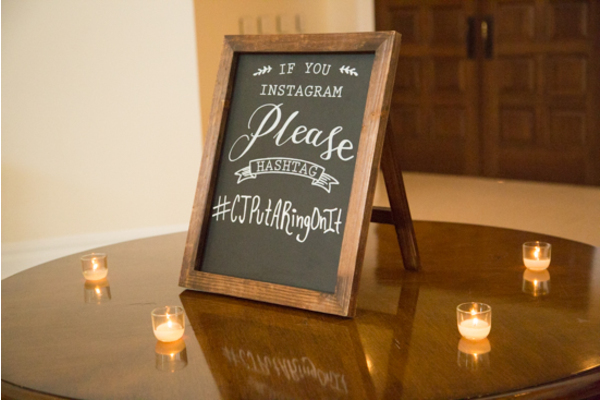 Furthermore, everyone was hash tagging #CJPutARingOnIt on social media! 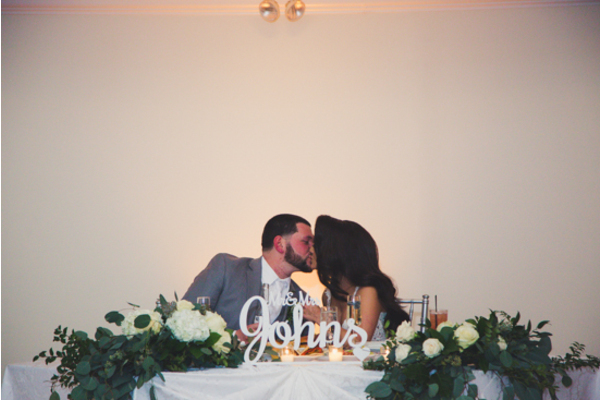 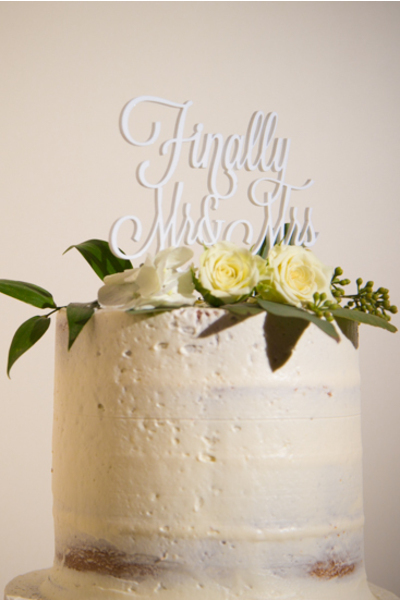 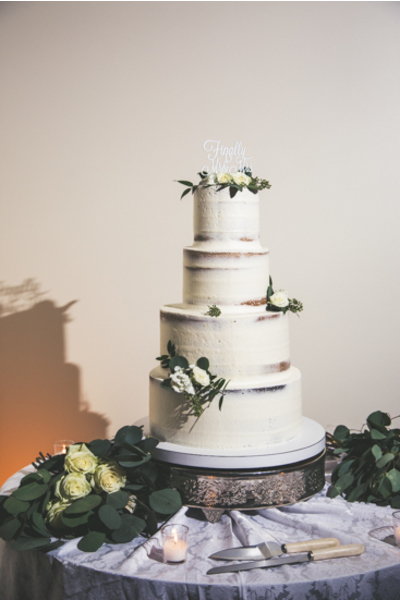 There were simple greenery decorations throughout the room and sweet treats to eat all night. 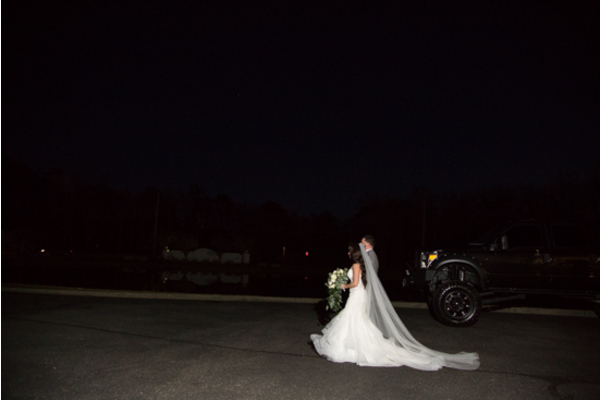 In short, it was such a perfect night! 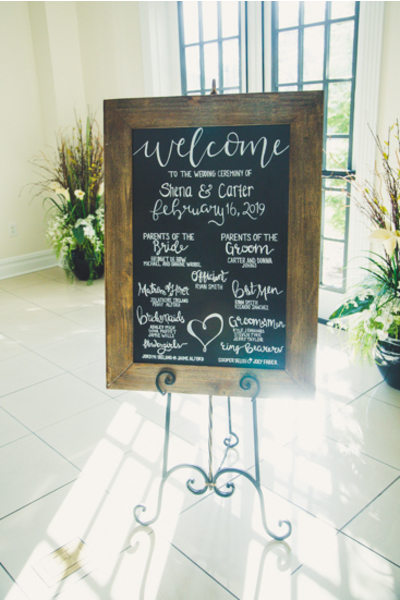 Congratulations, again, to Shena and Carter. 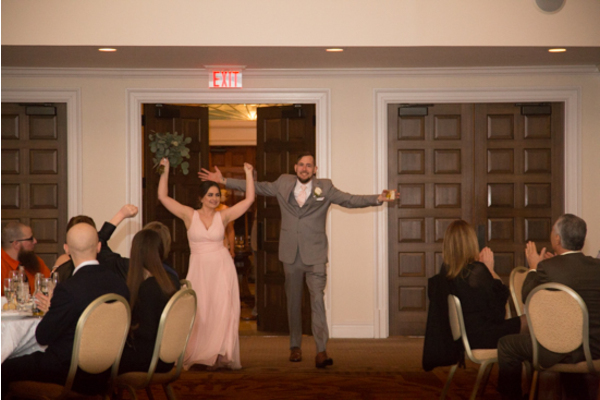 In conclusion, we loved celebrating all day and night with you!